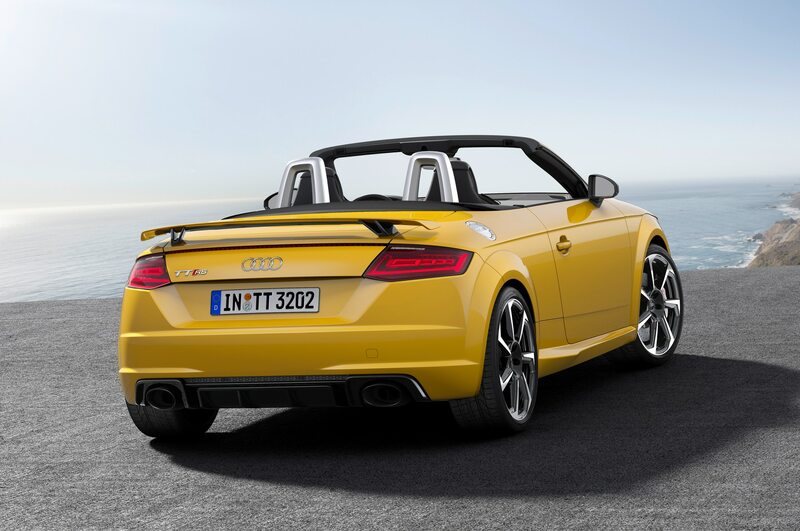 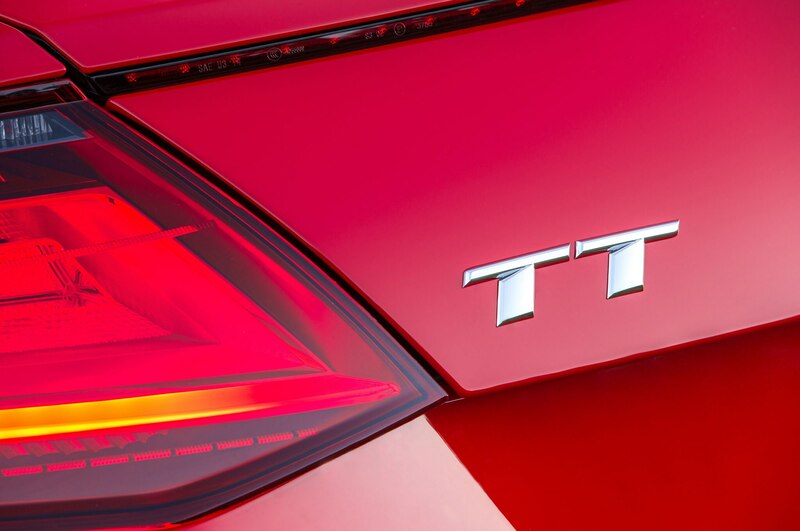 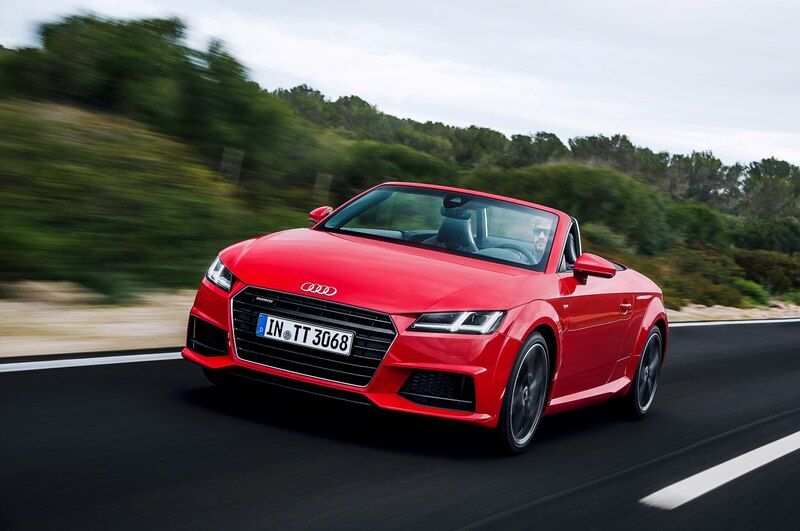 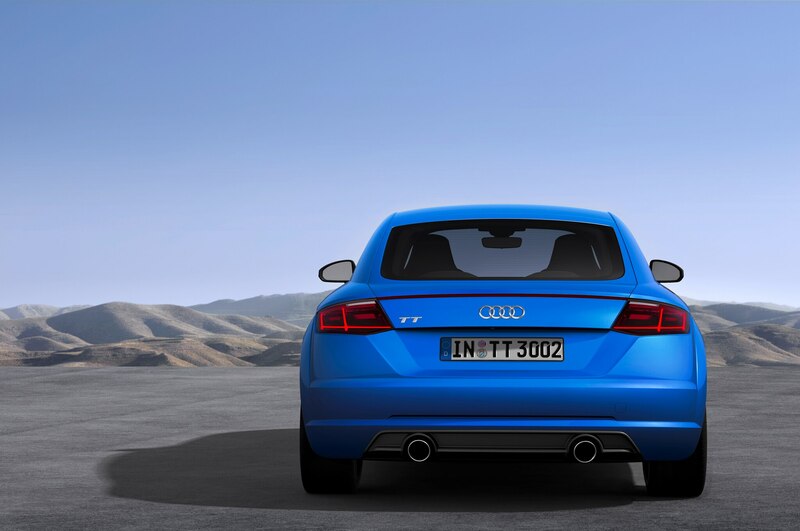 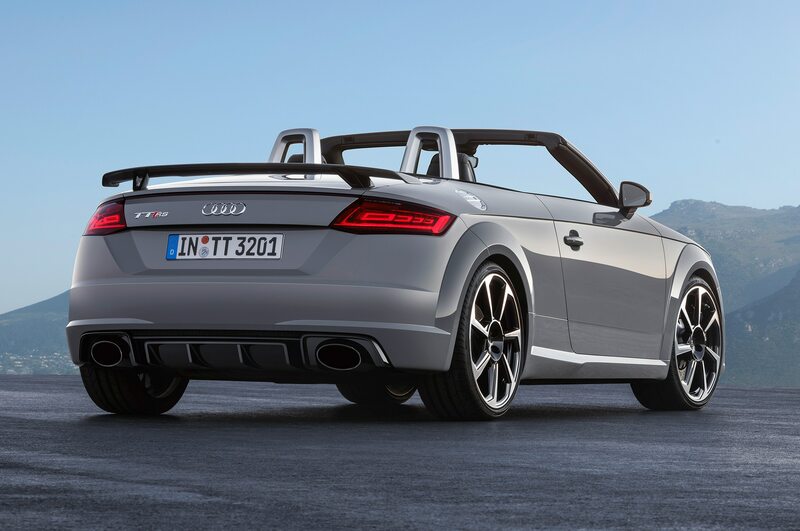 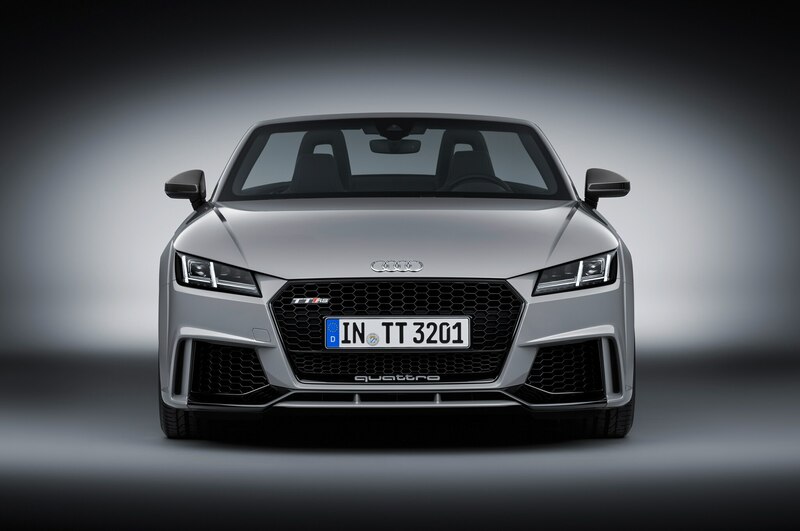 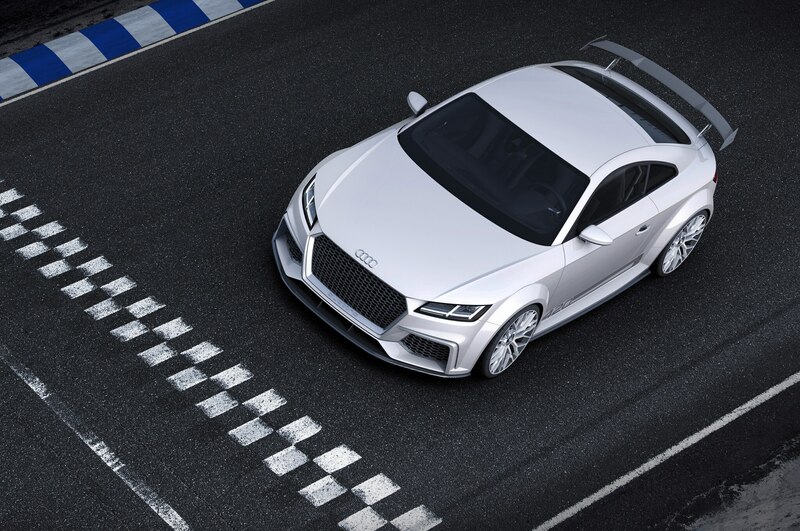 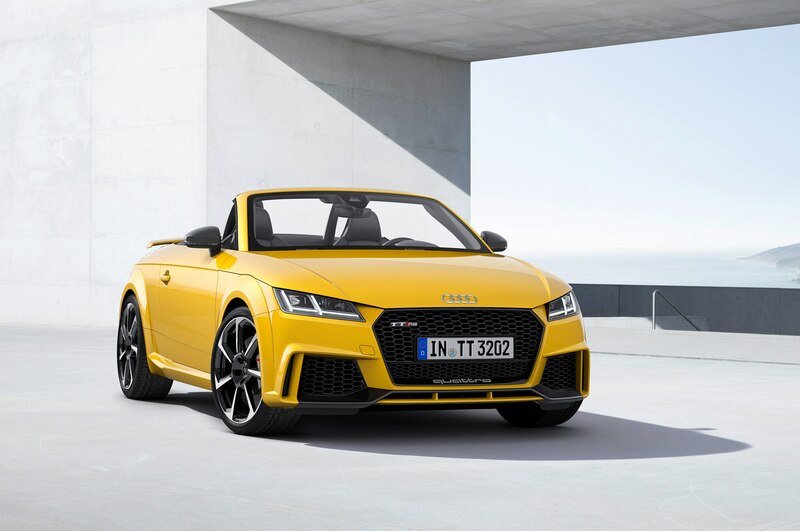 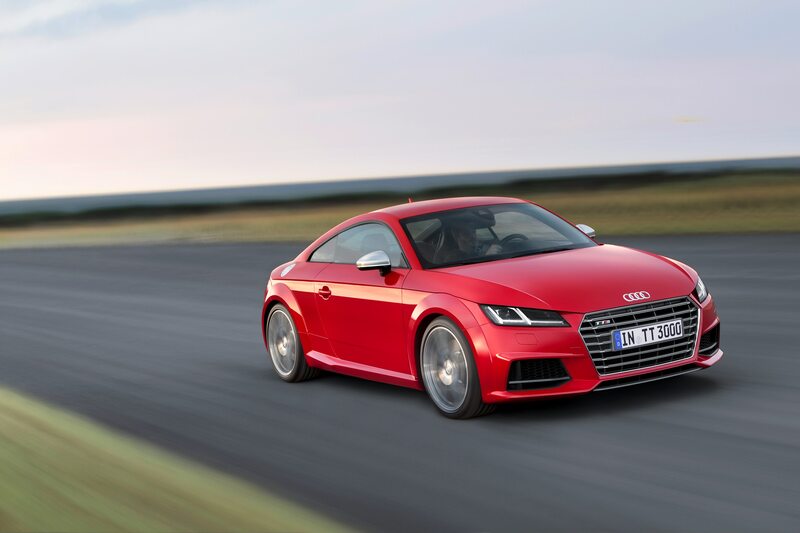 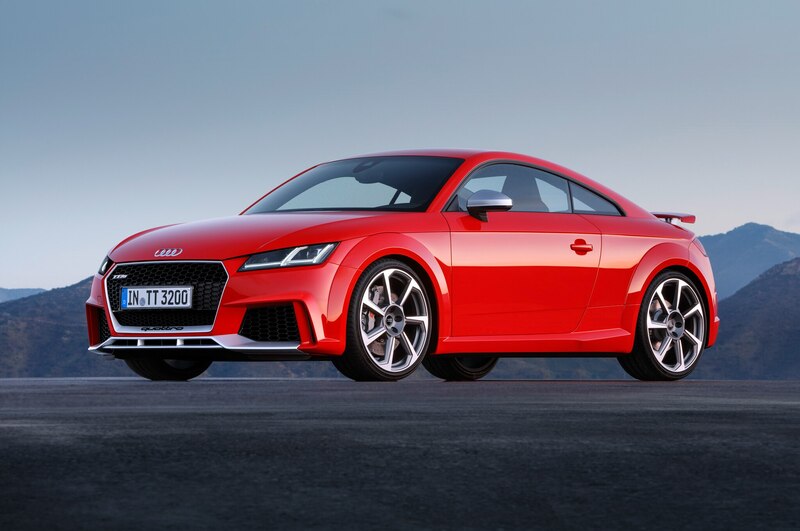 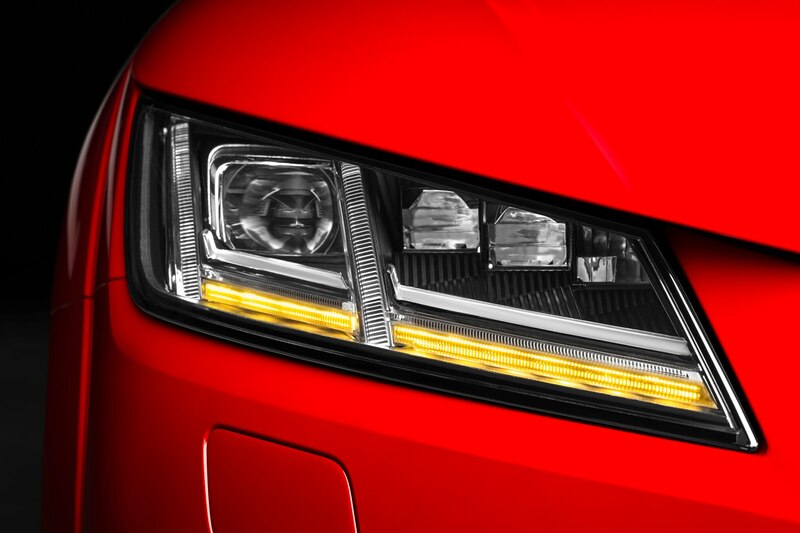 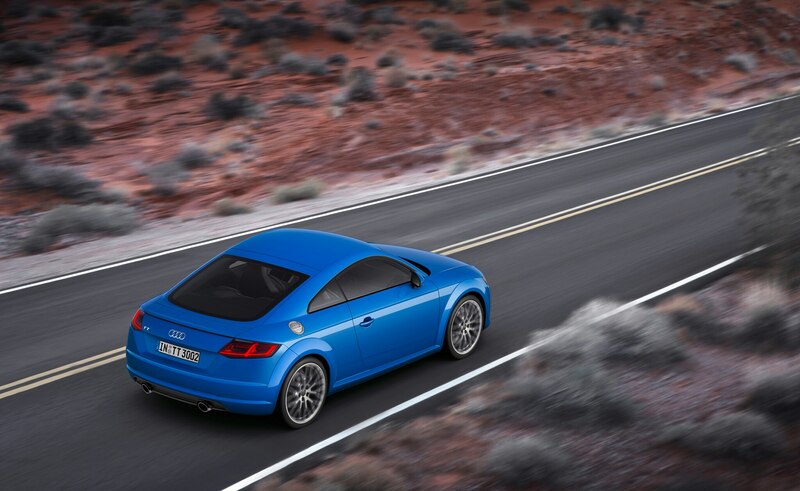 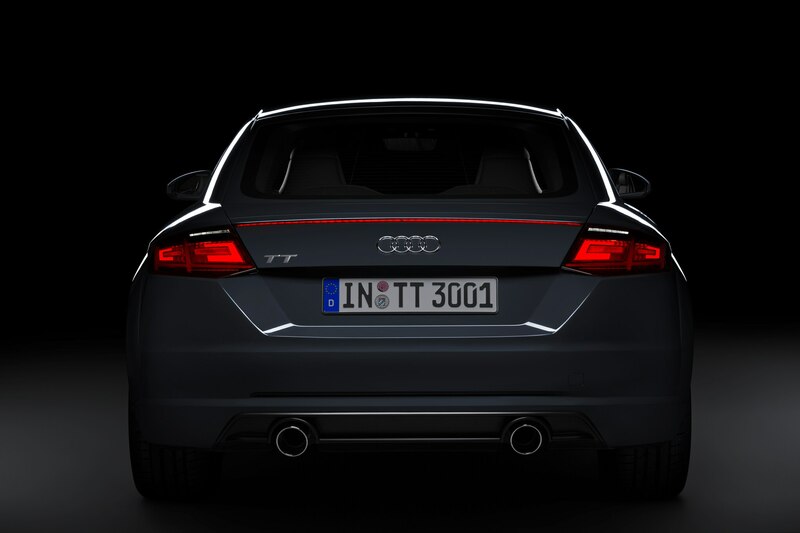 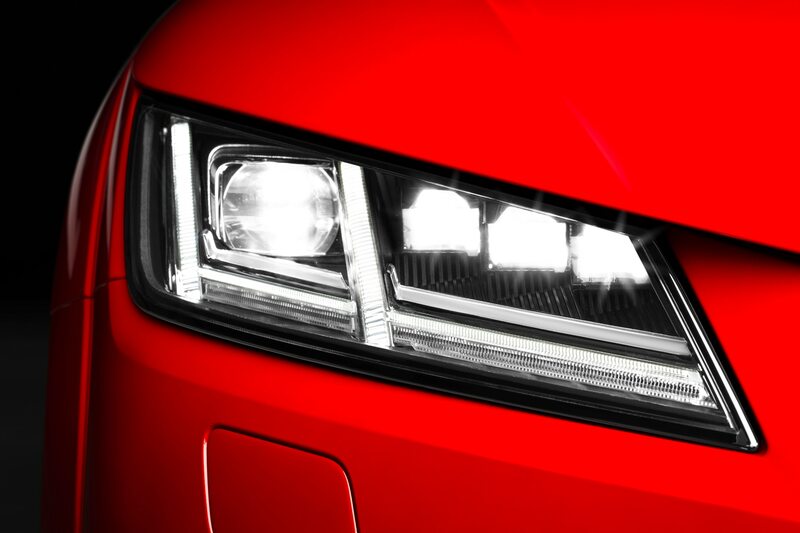 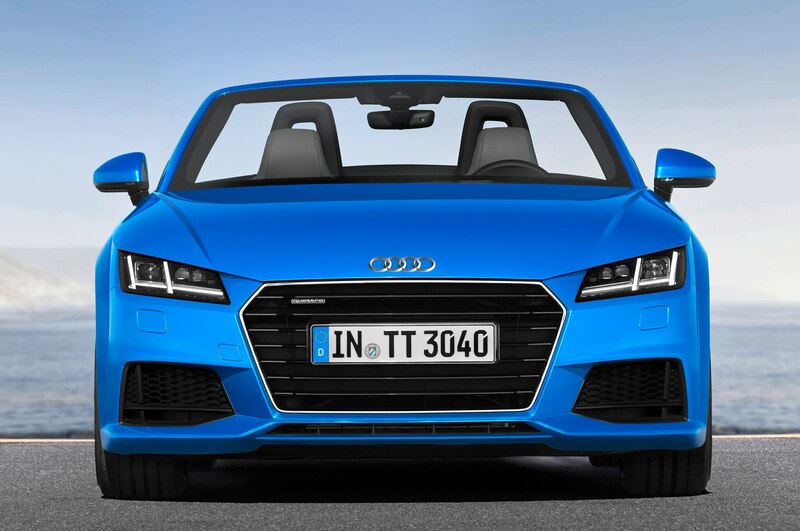 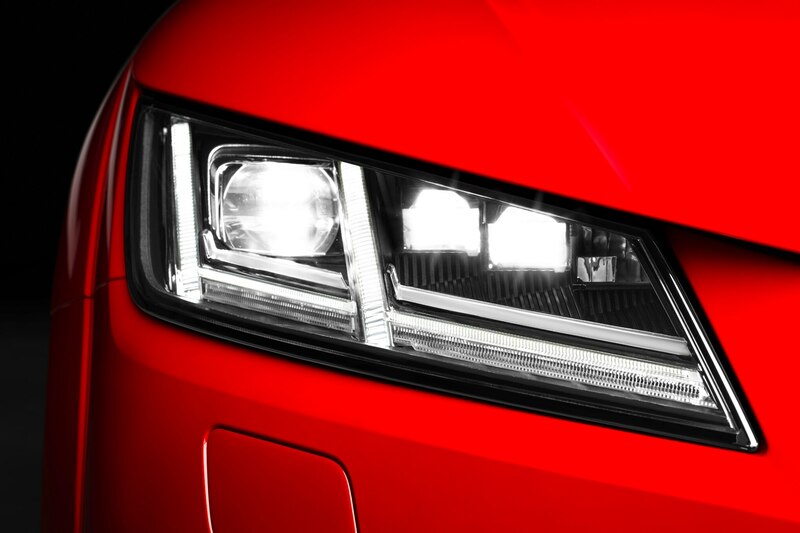 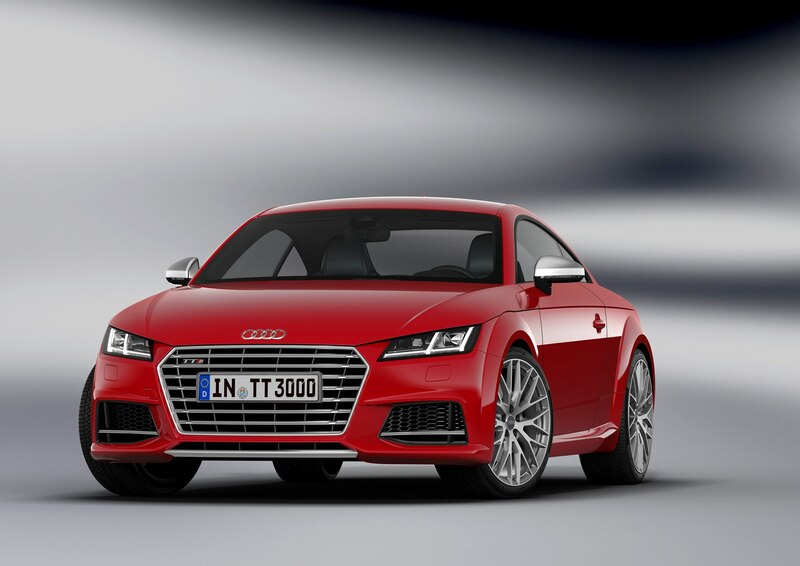 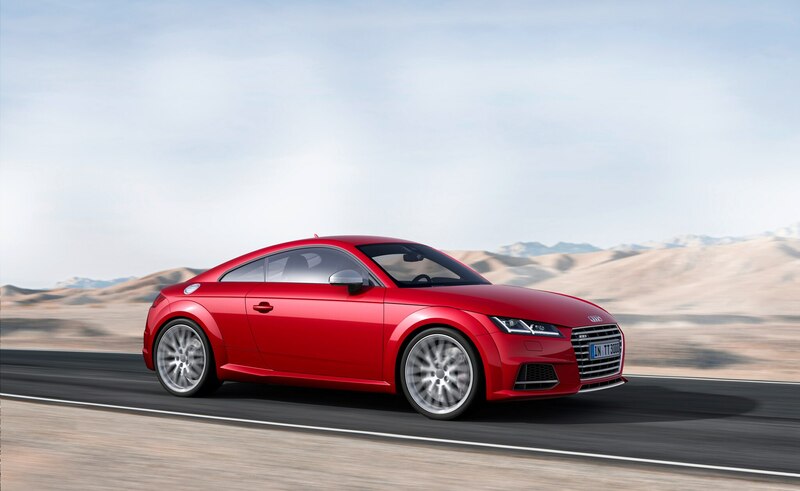 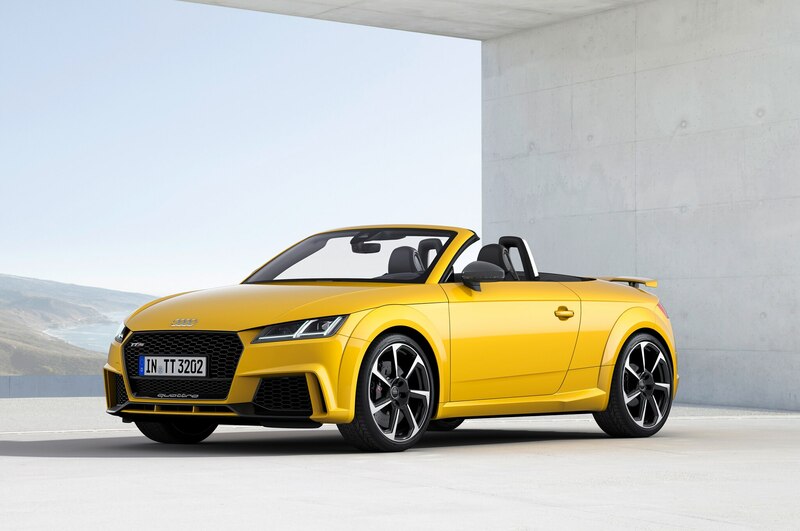 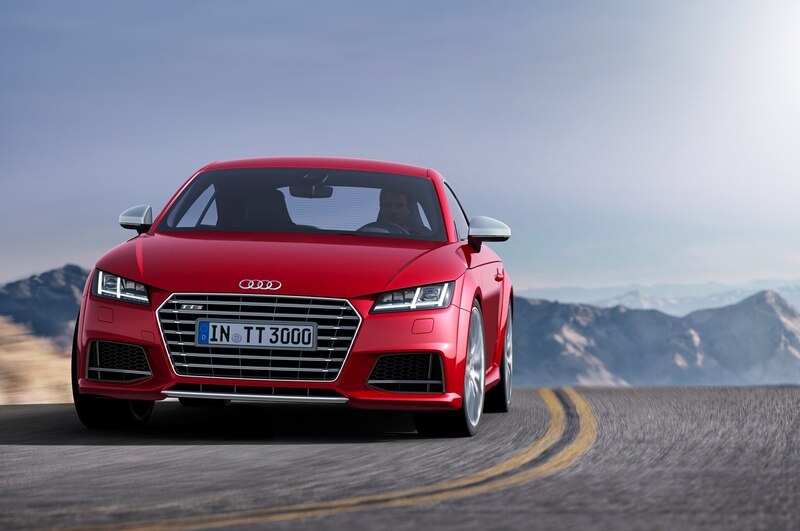 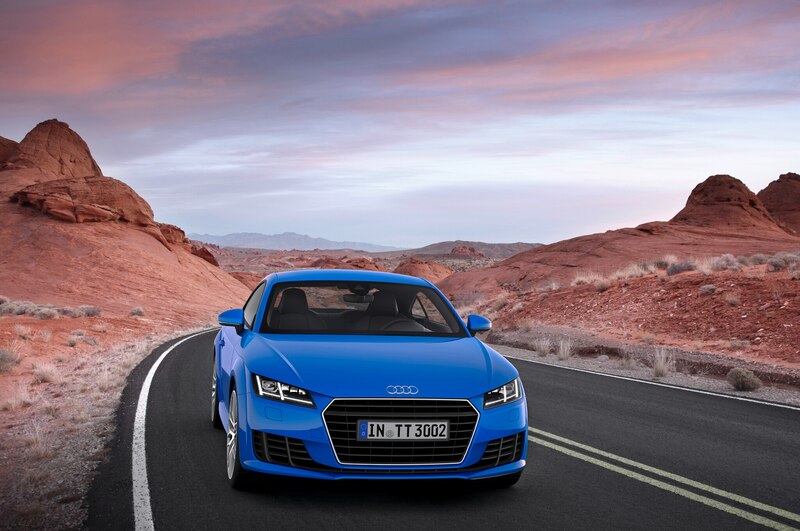 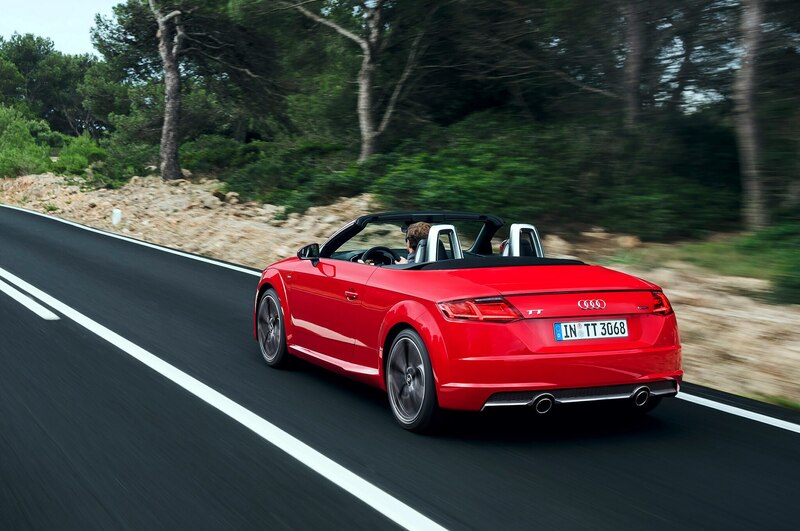 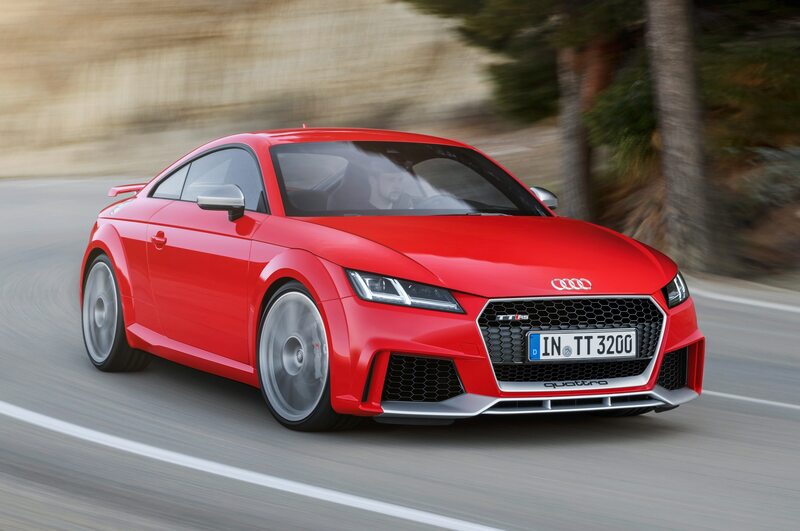 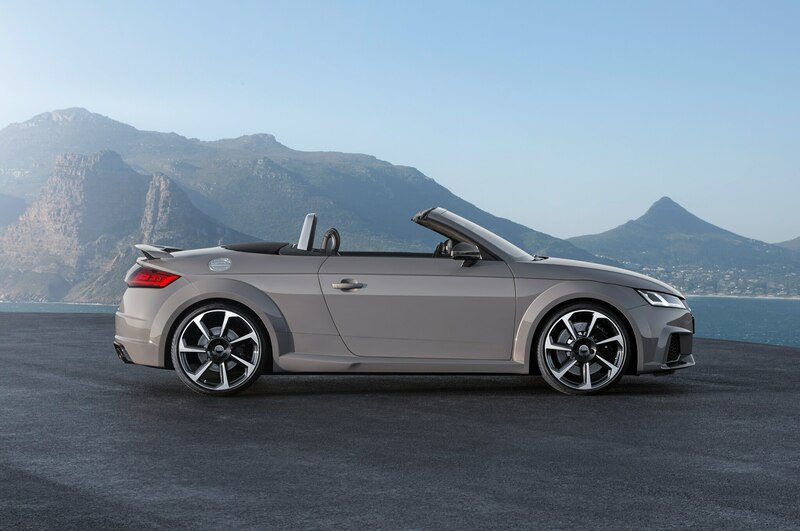 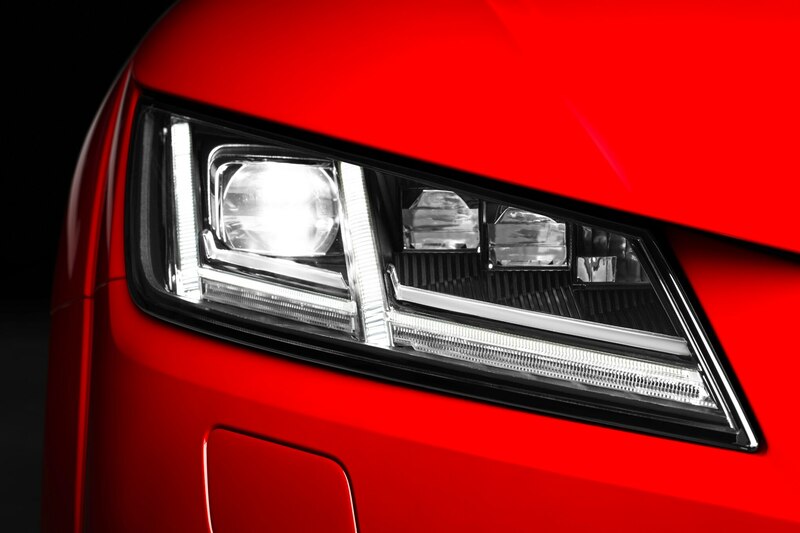 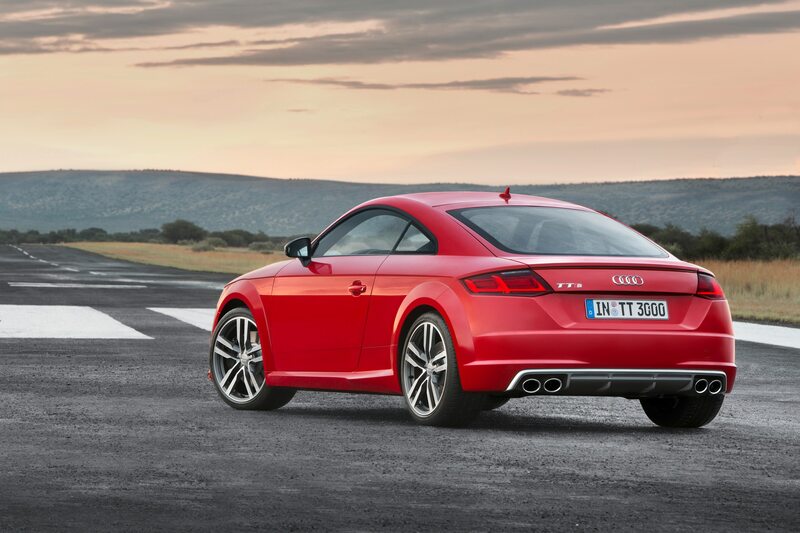 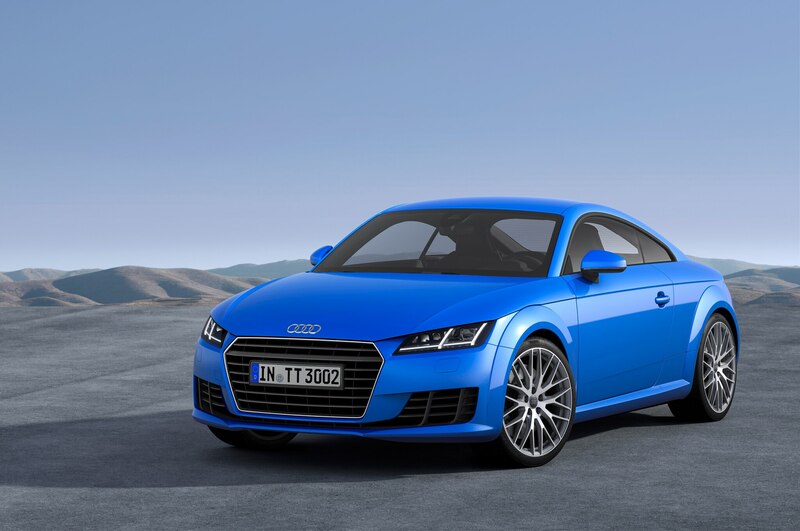 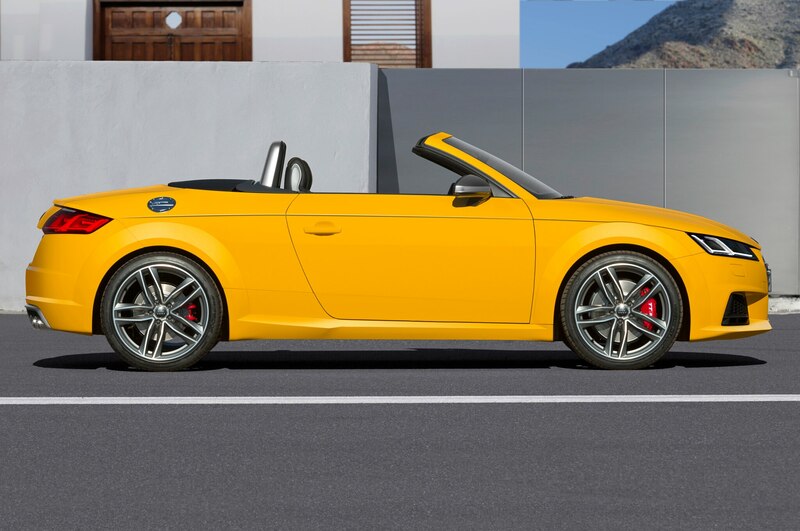 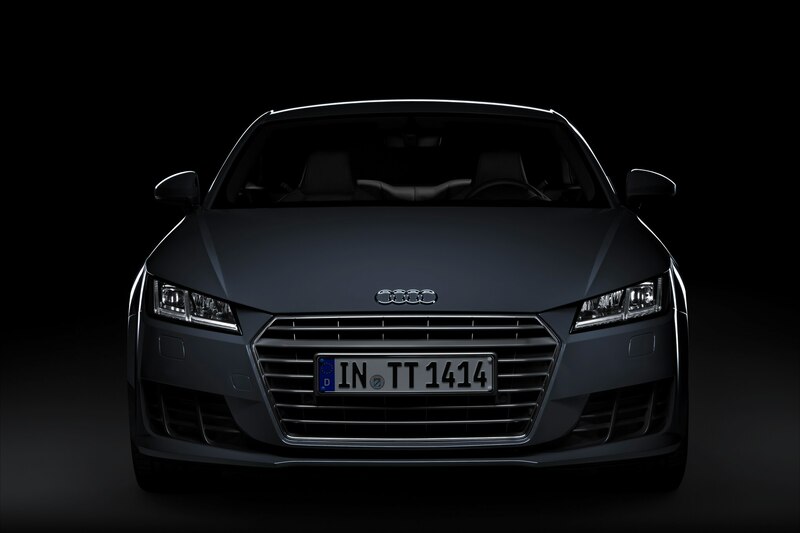 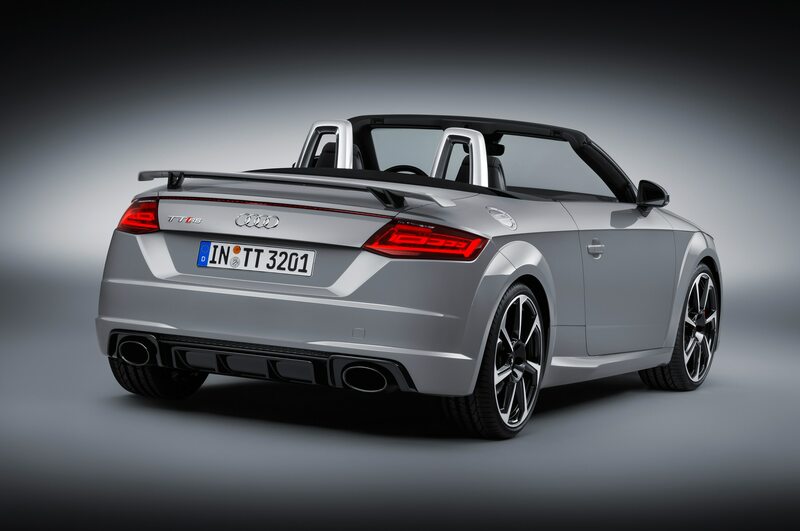 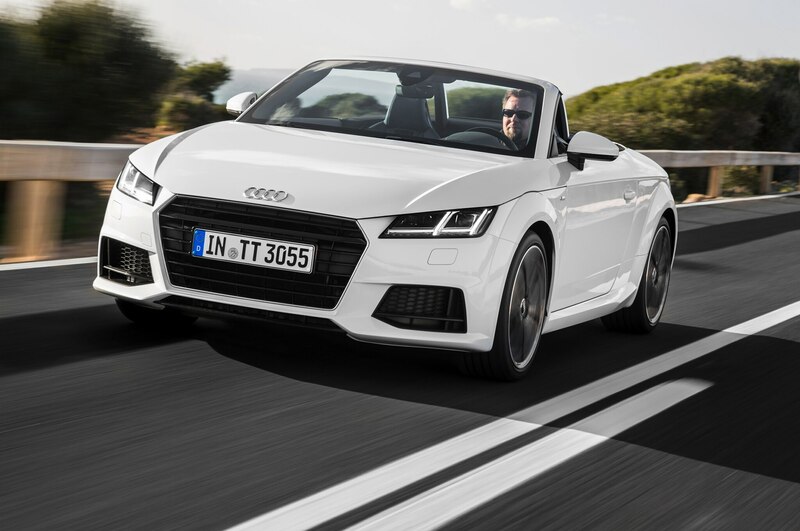 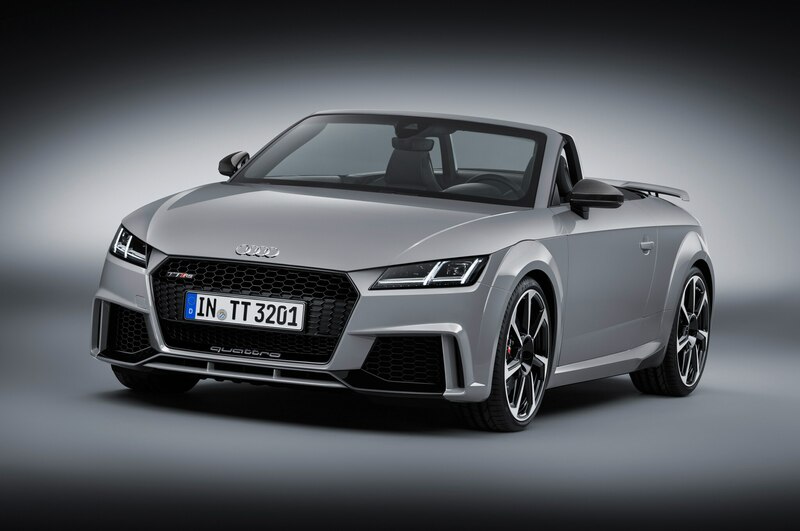 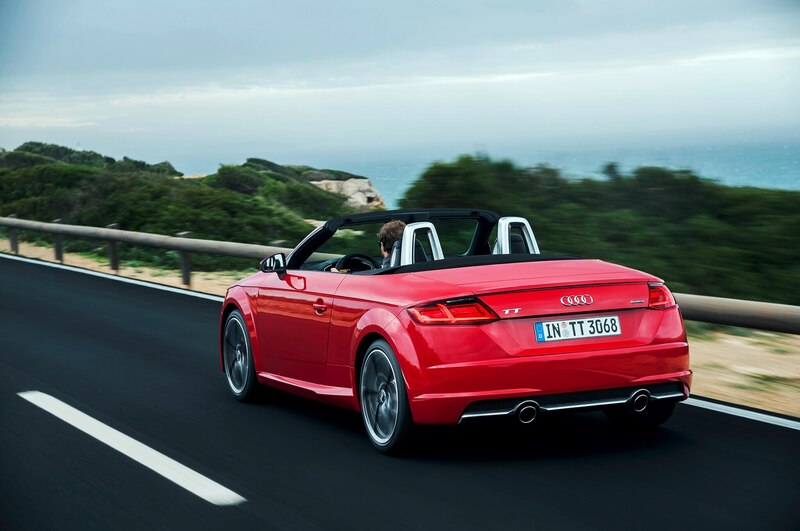 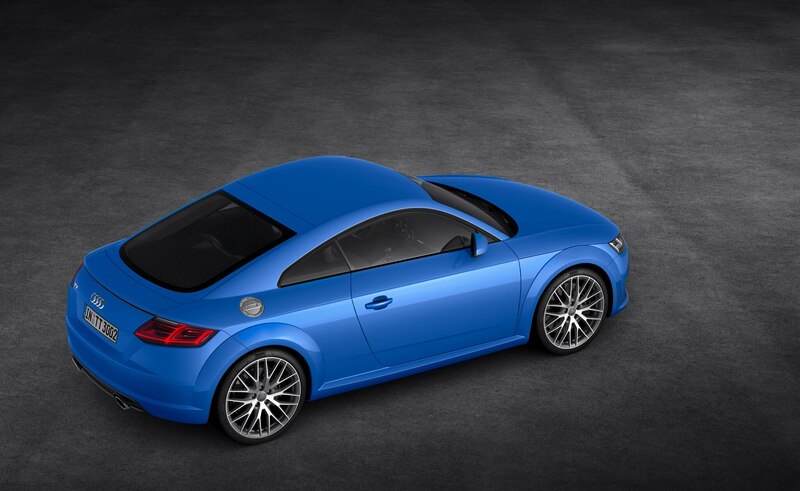 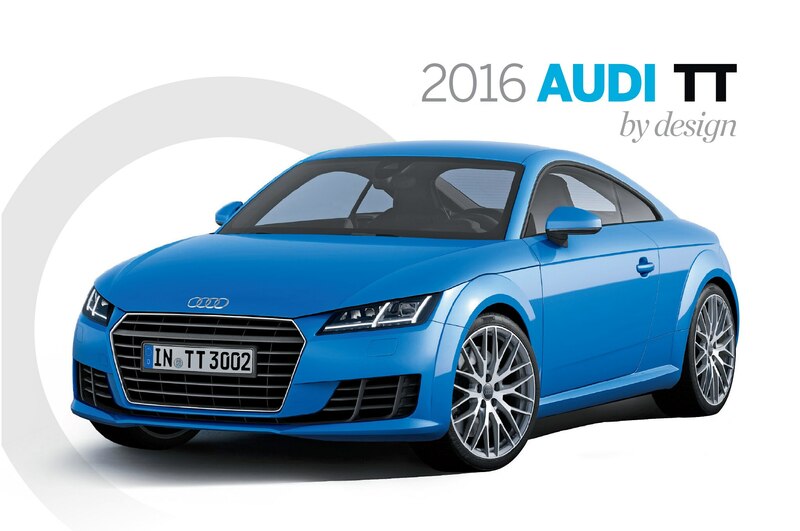 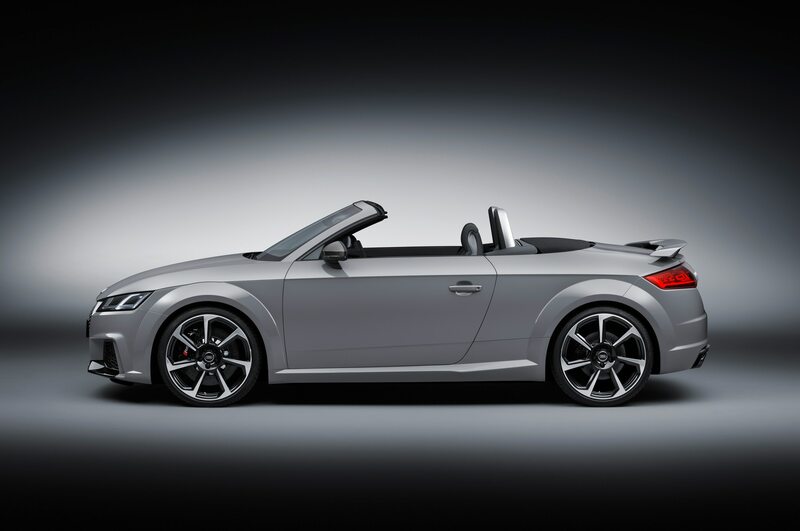 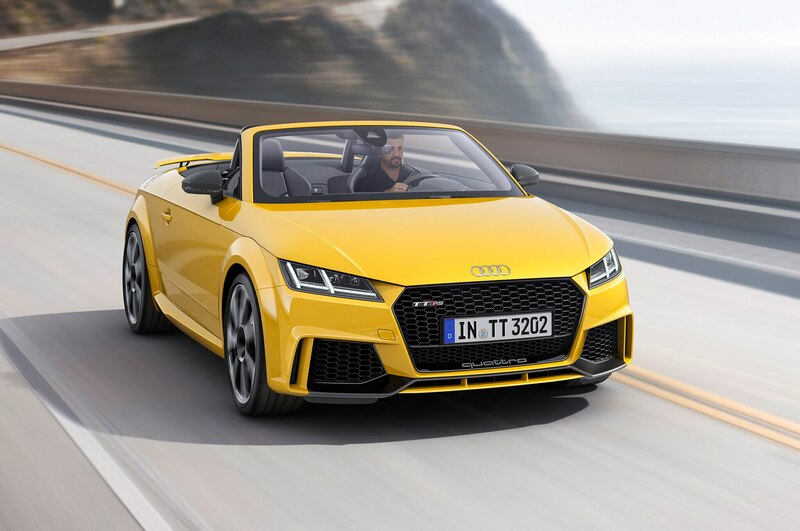 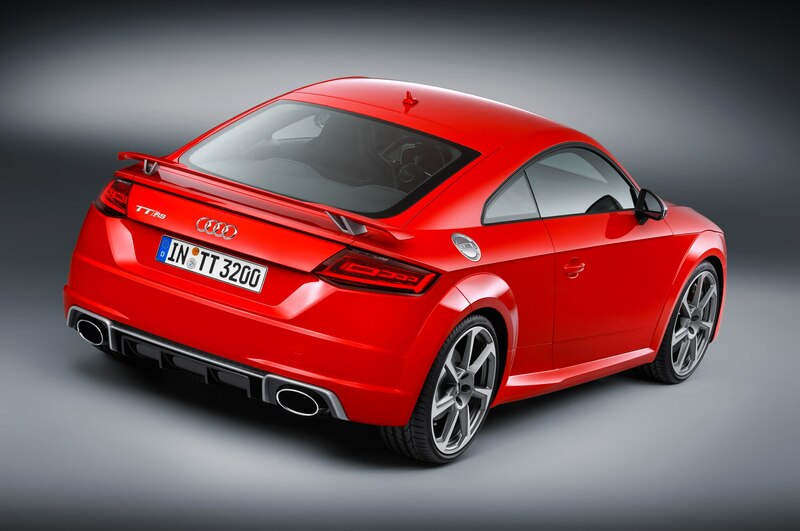 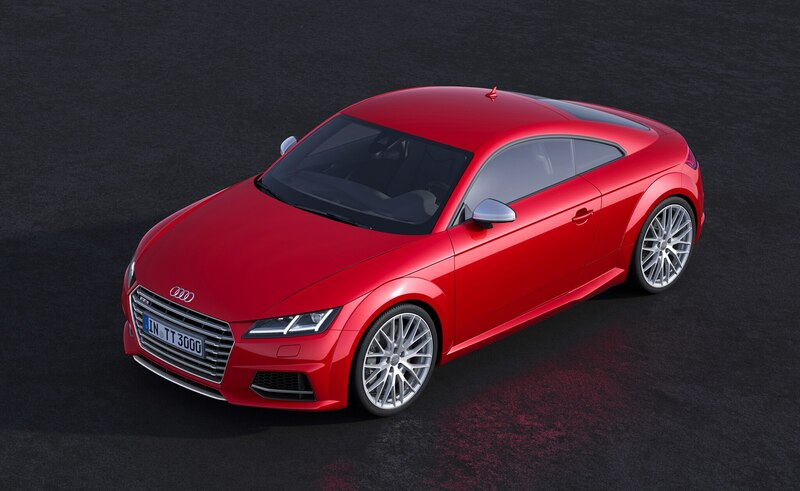 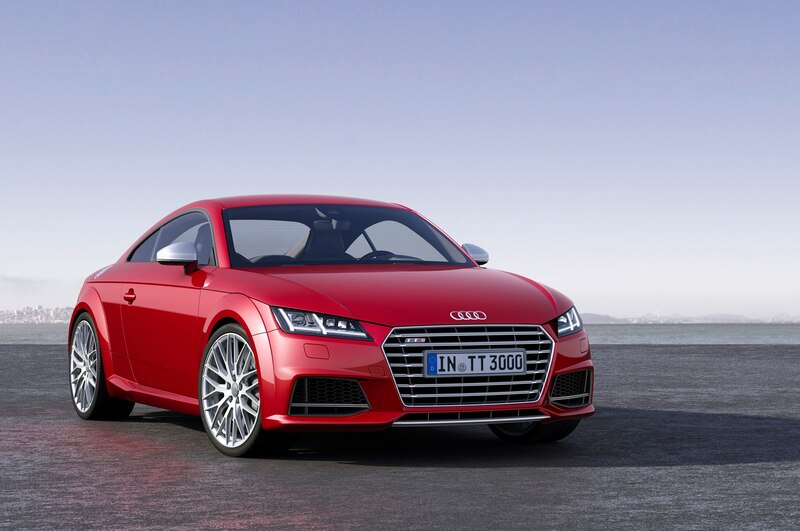 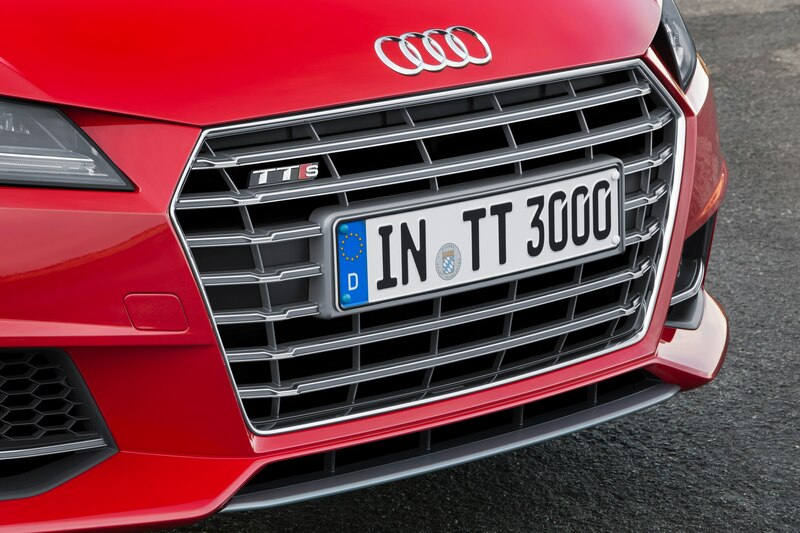 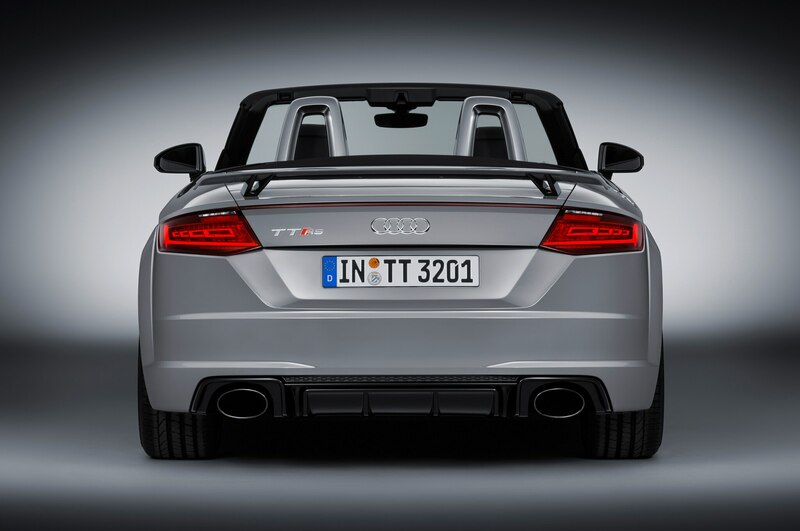 The TT RS name is back, as the latest version of Audi’s coupe and convertible gain a new high-performance variant. 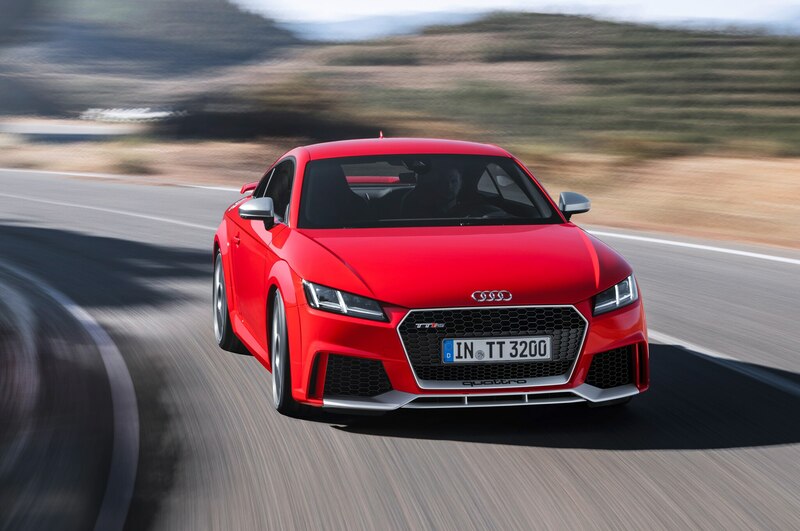 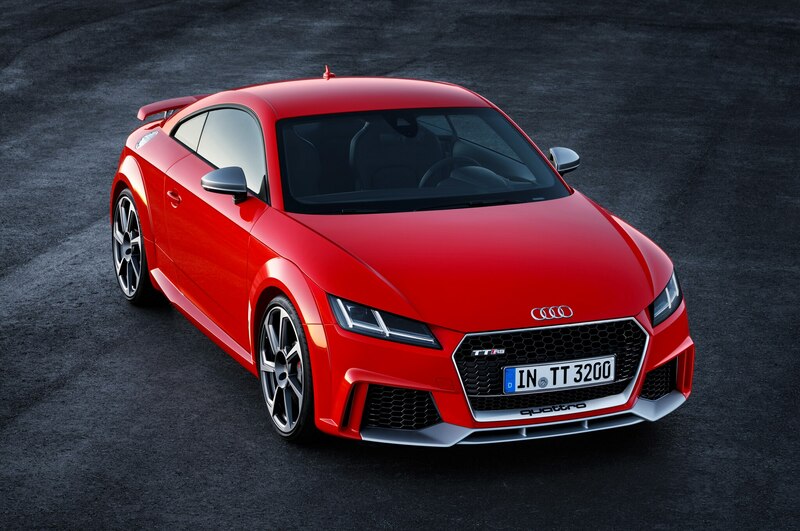 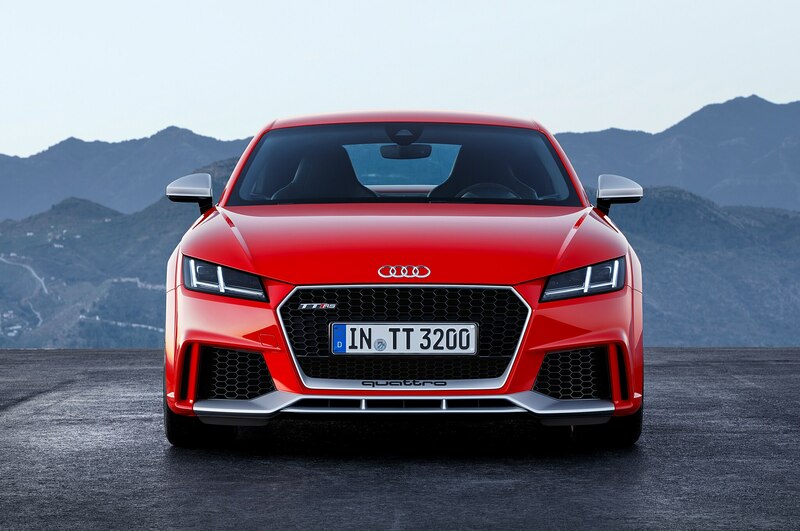 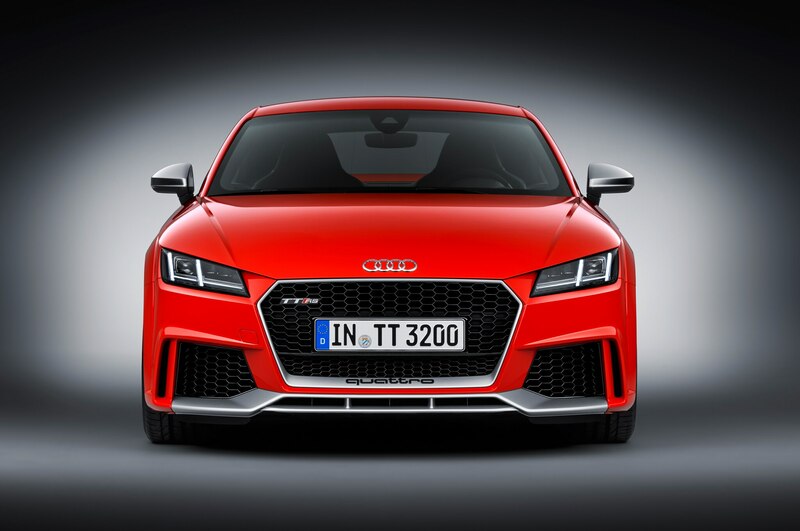 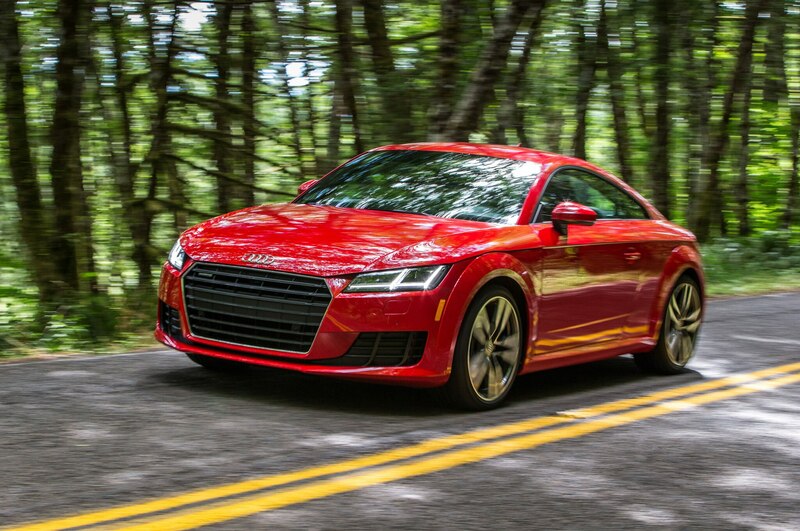 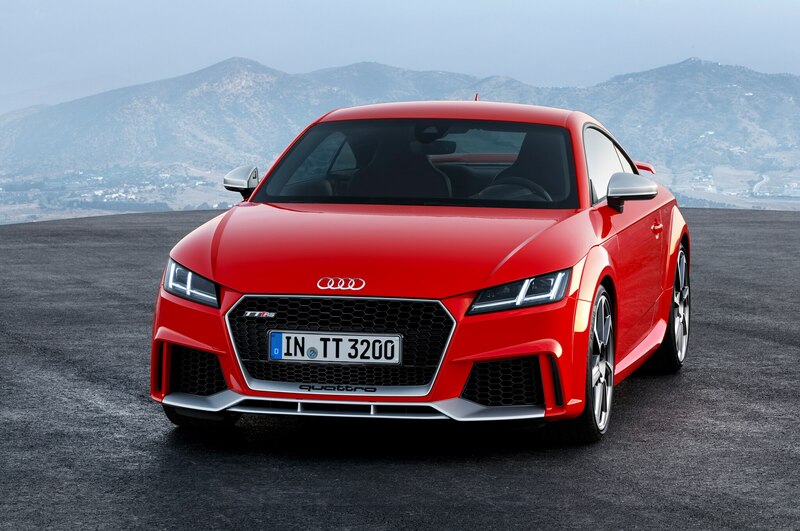 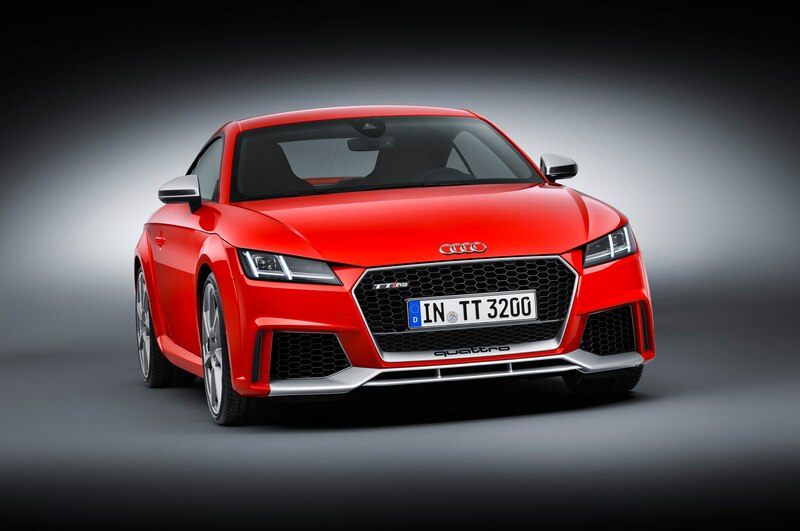 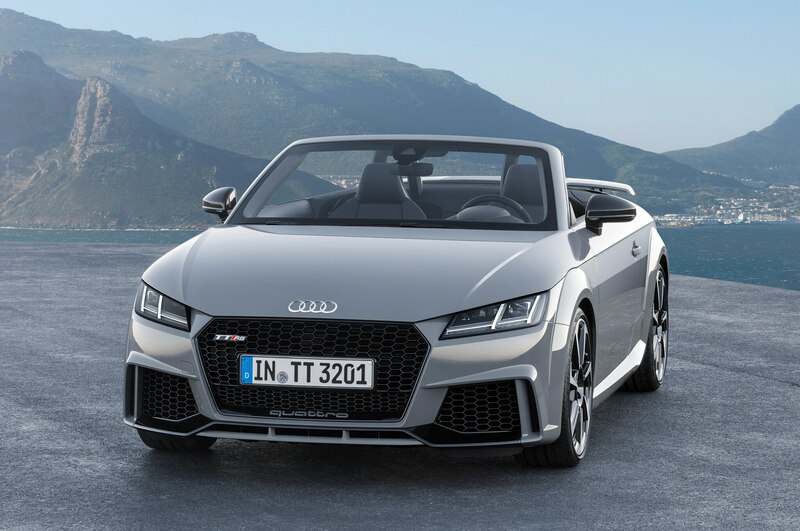 As with the old car, the new Audi TT RS uses a 2.5-liter turbocharged five-cylinder engine, though now it has a lighter aluminum block, and it makes 394 hp and 354 lb-ft of torque. 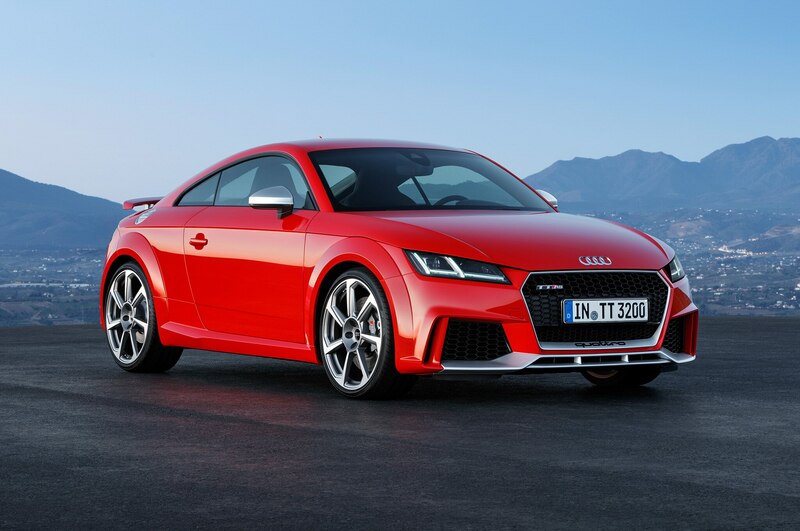 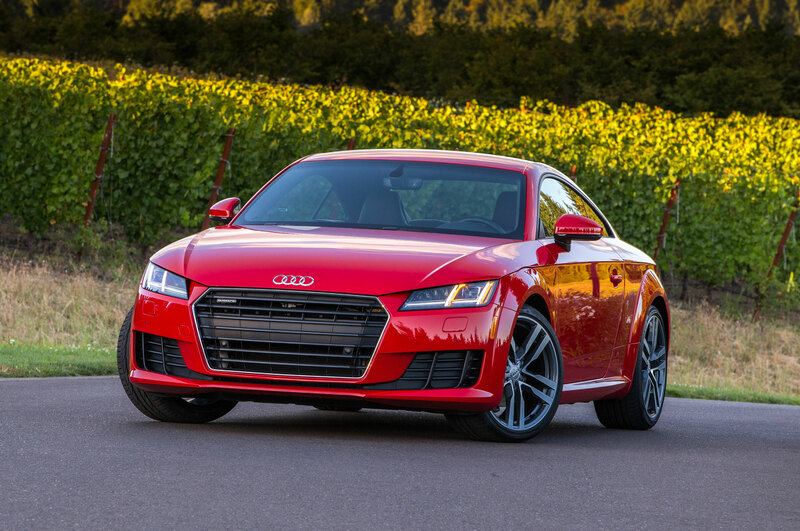 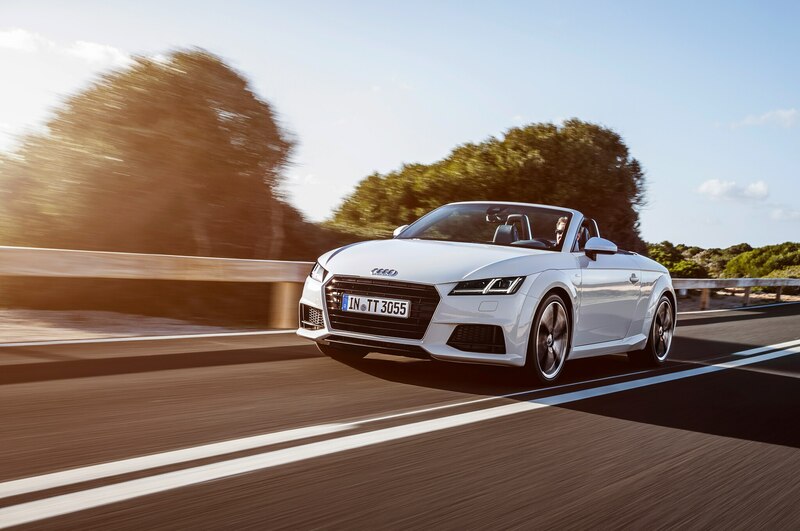 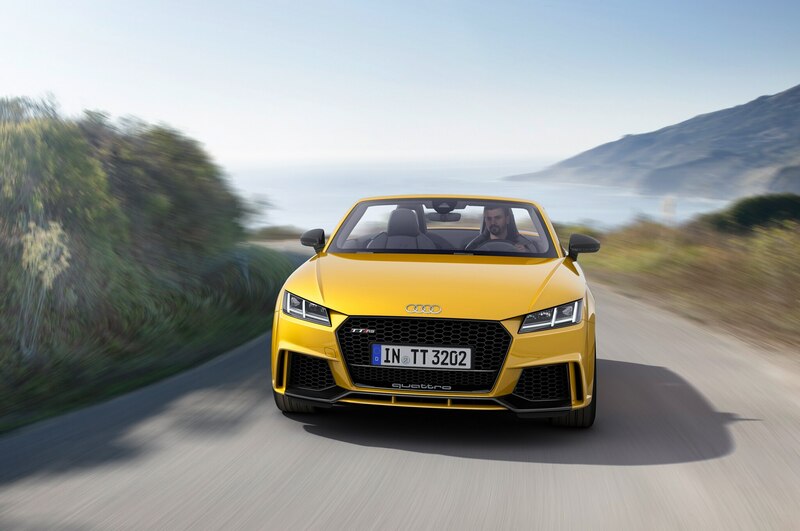 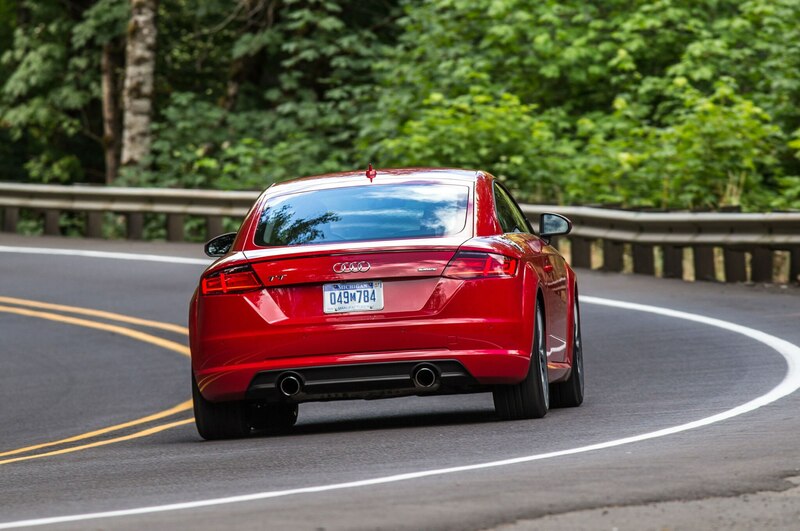 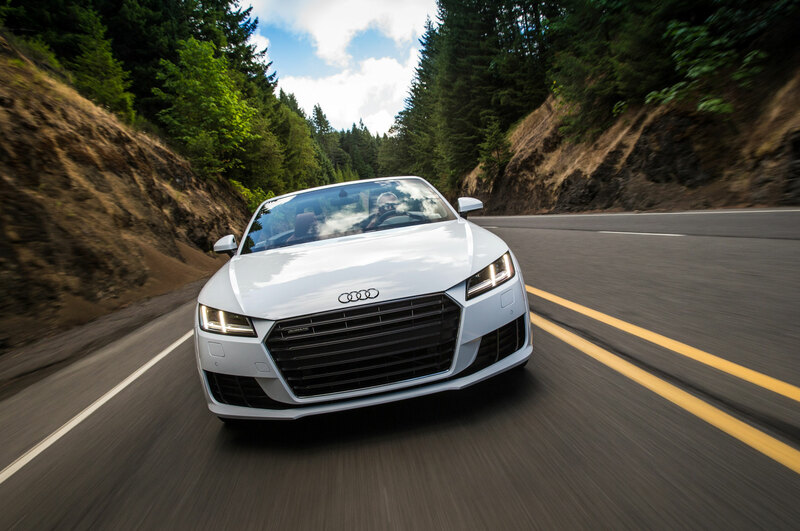 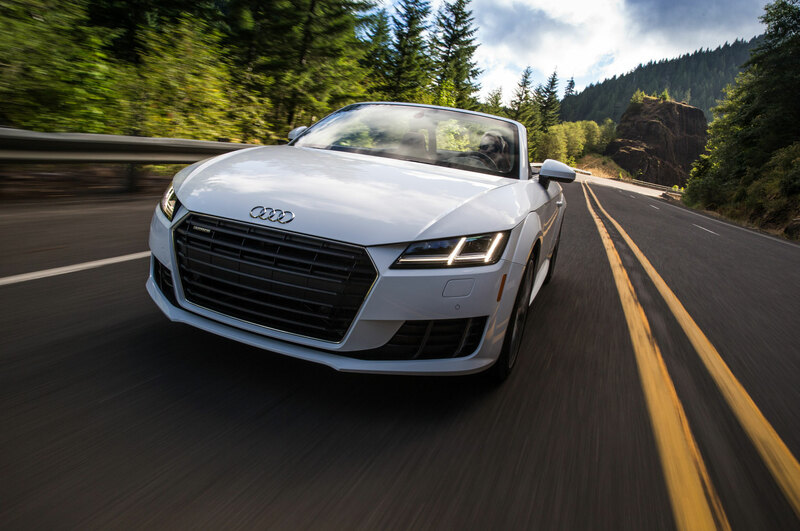 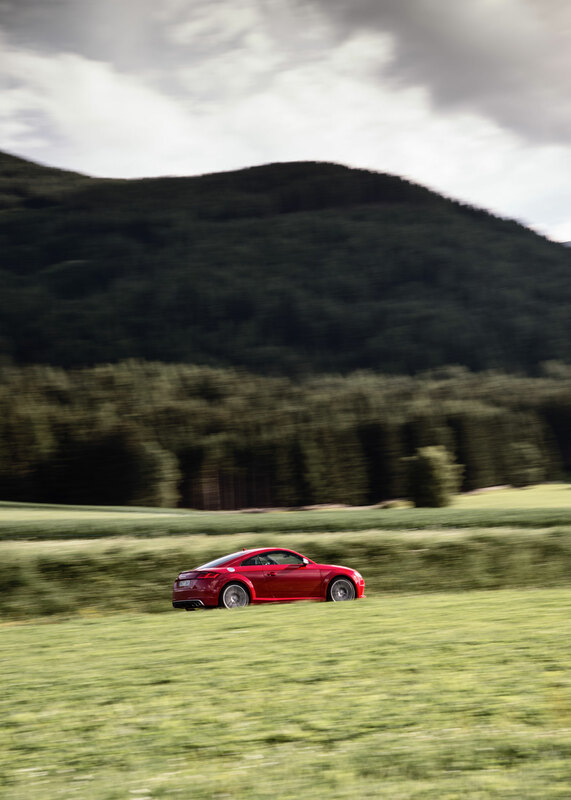 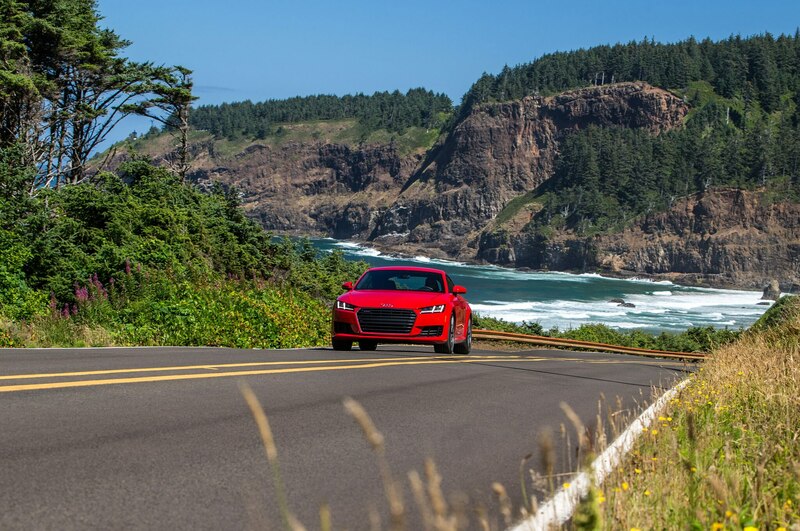 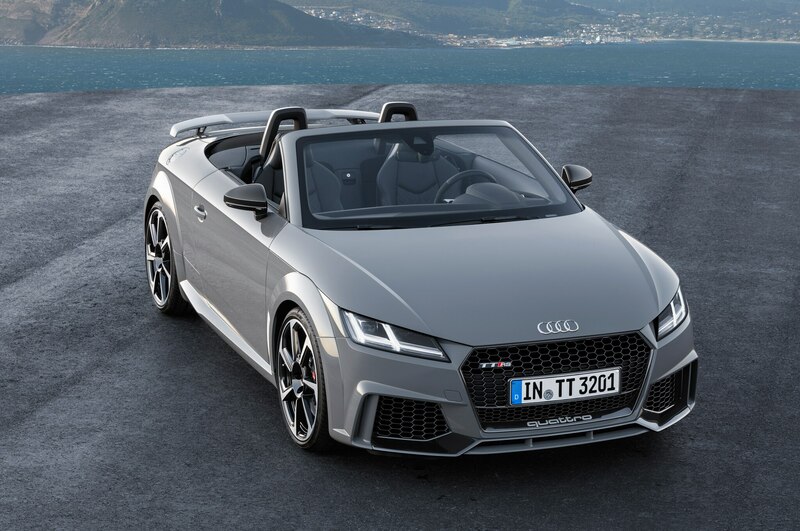 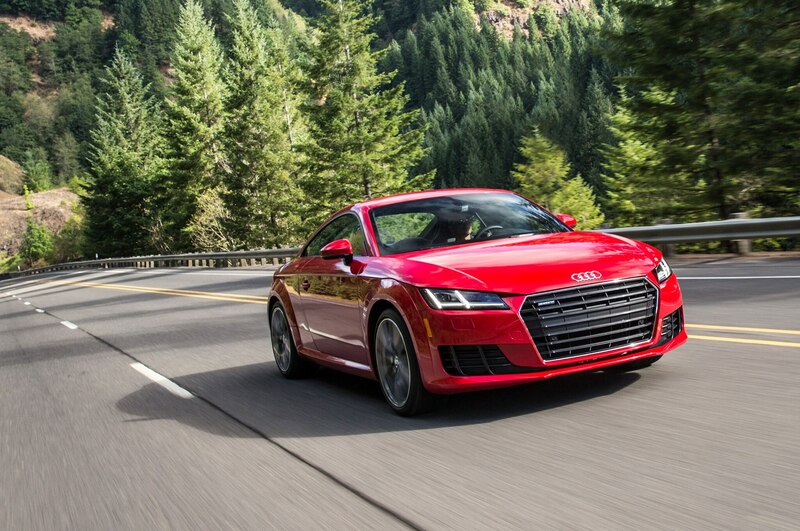 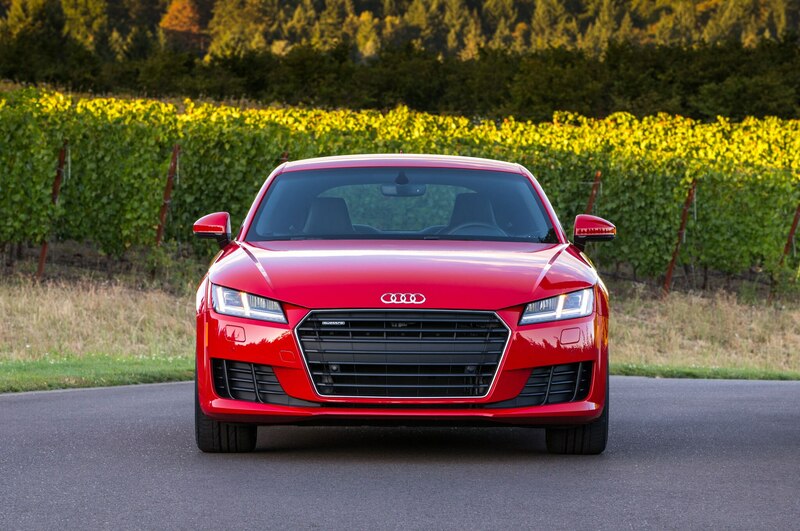 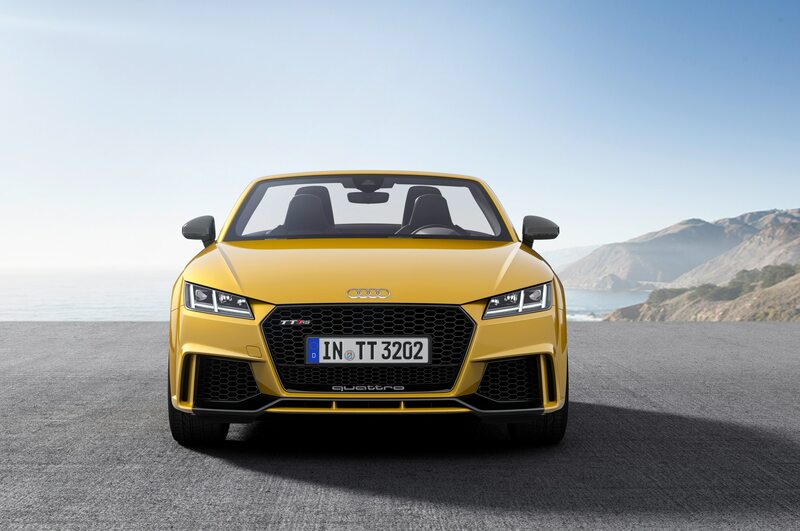 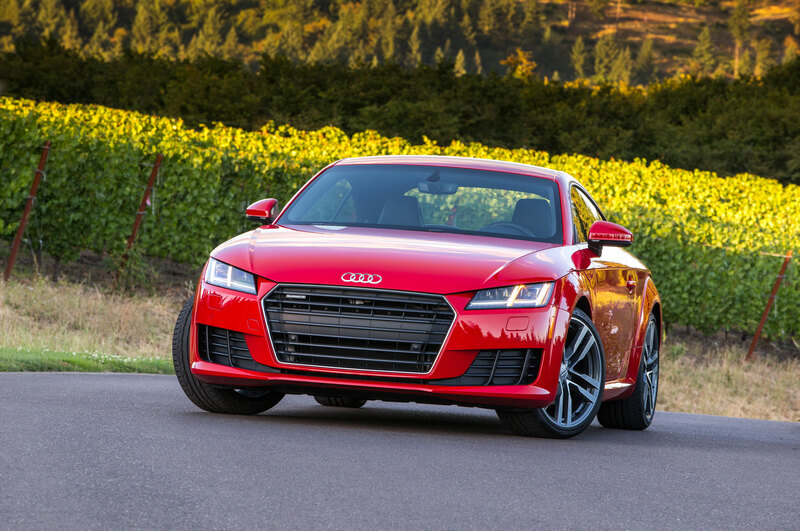 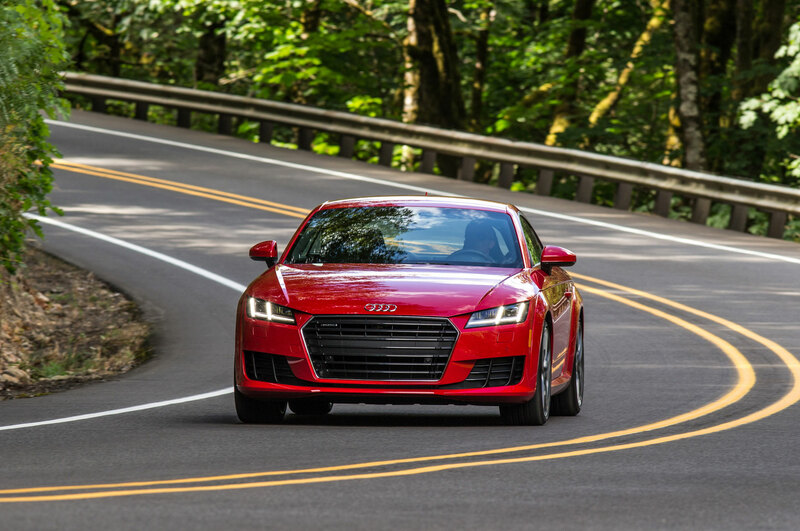 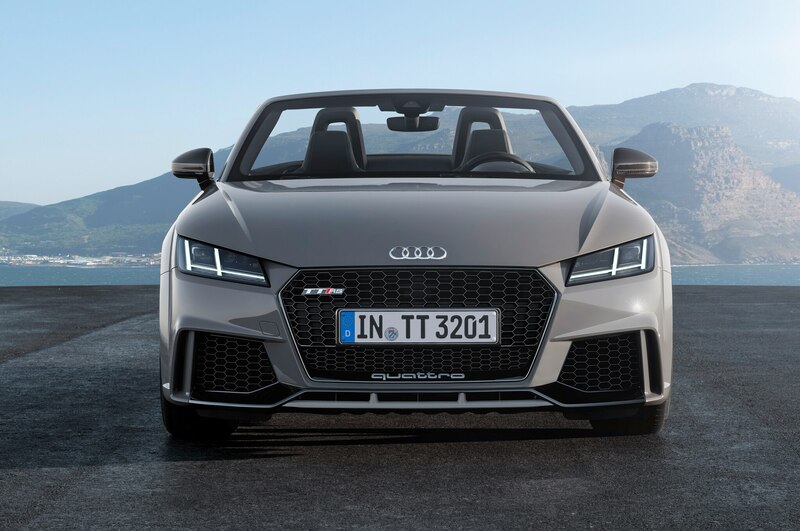 Coupled to a seven-speed dual-clutch transmission and Quattro all-wheel drive, the engine rockets the Audi TT RS coupe to 62 mph in 3.7 seconds, while the convertible hits the benchmark in 3.9 seconds. 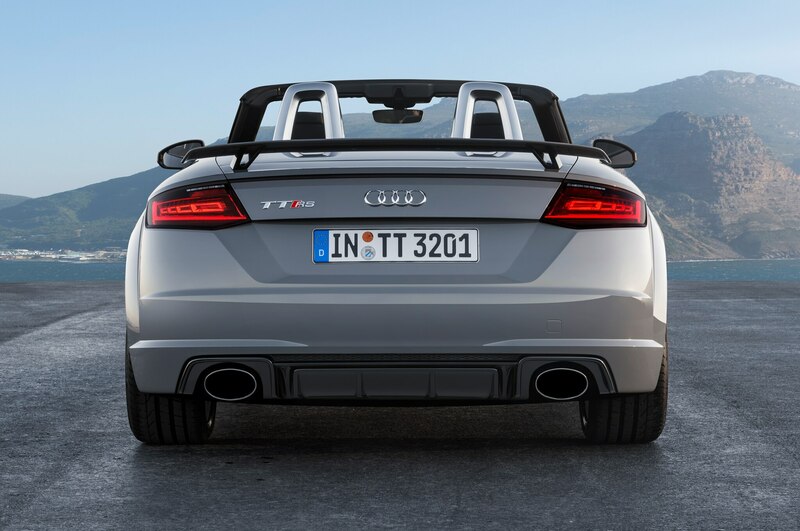 Both are limited to 155 mph as standard, but a 174-mph limiter is available as an option. 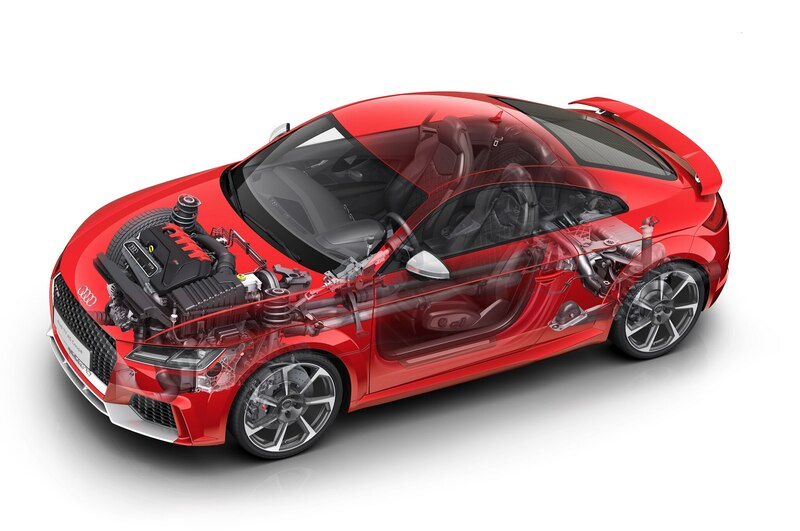 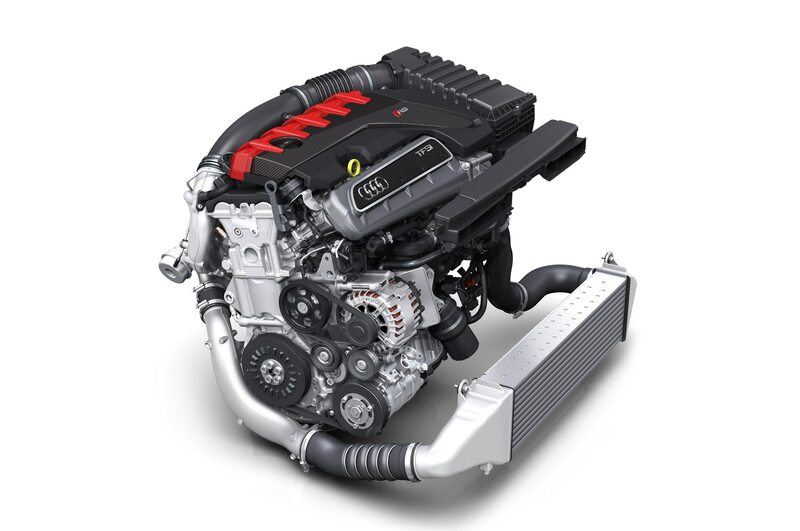 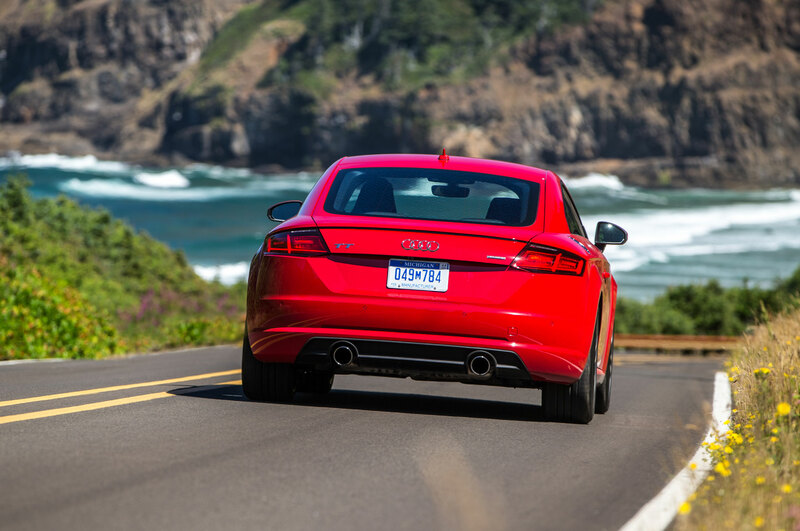 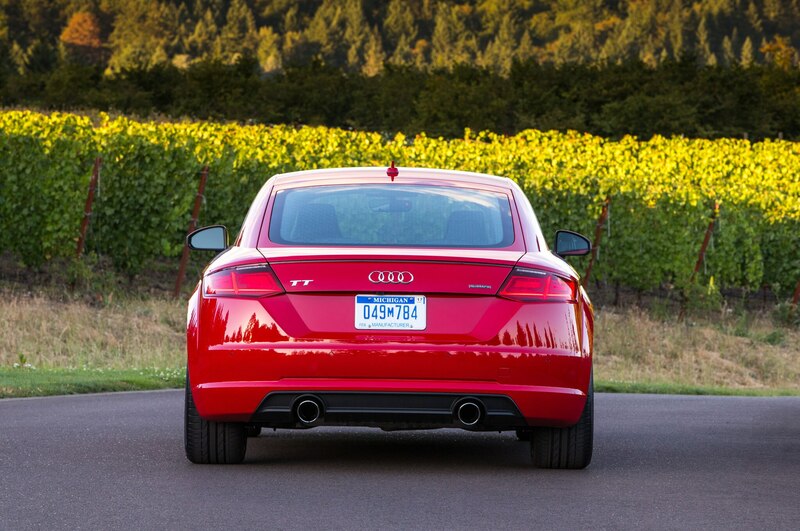 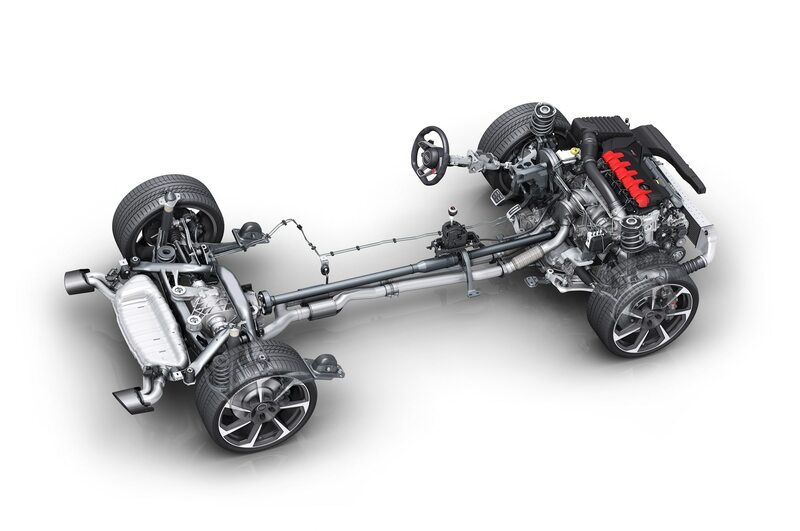 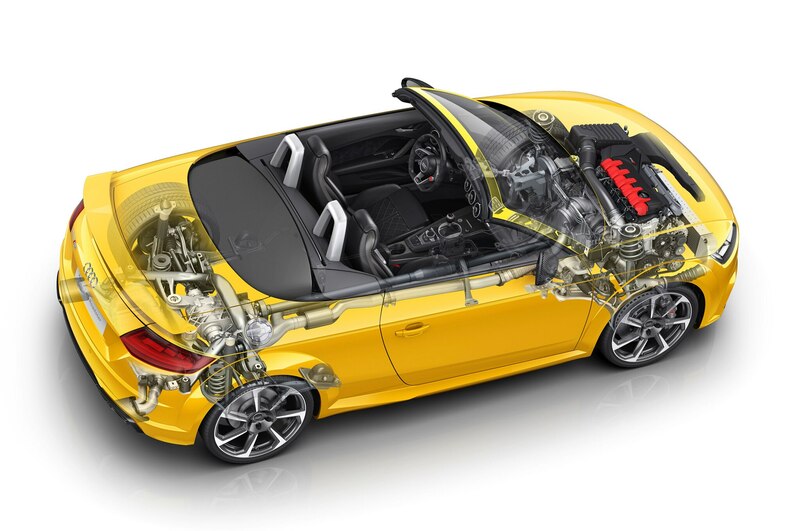 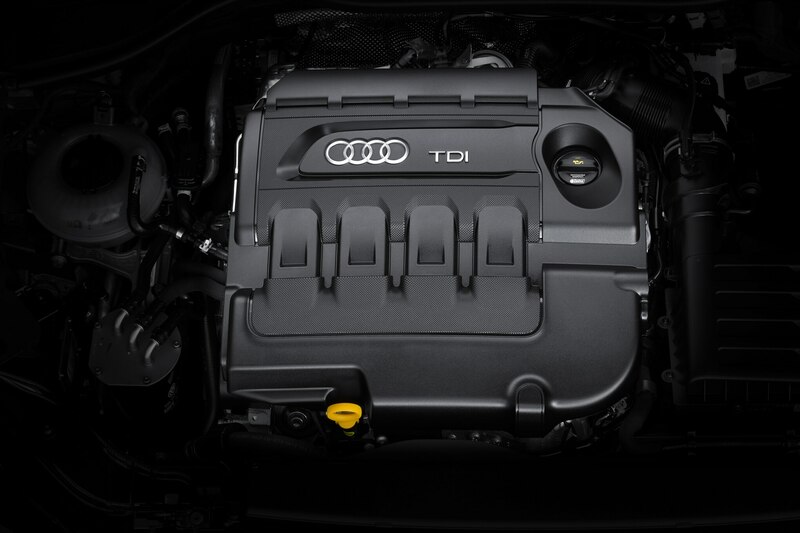 The five-cylinder engine is considerably more efficient than before, and a total of 57.3 lb lighter. 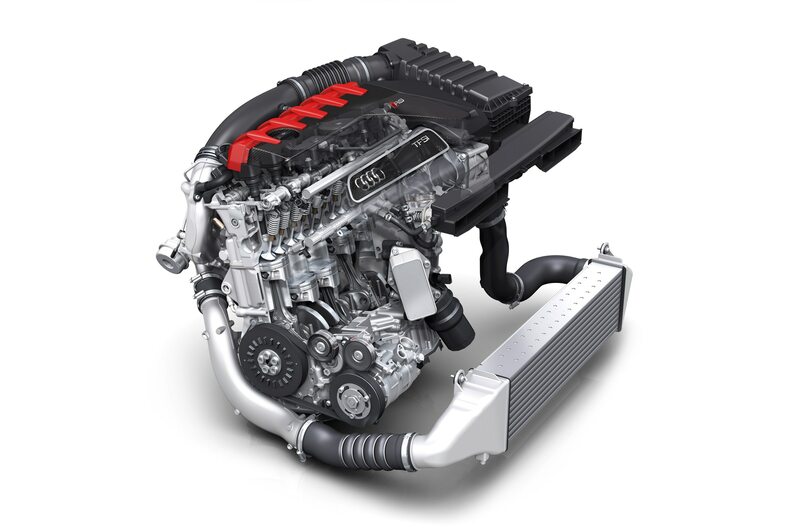 The aluminum block alone saves 39.7 lb compared to the old iron-block design, the crankshaft bearings are slightly thinner, and the crankshaft is now hollow to save 2.2 lb. 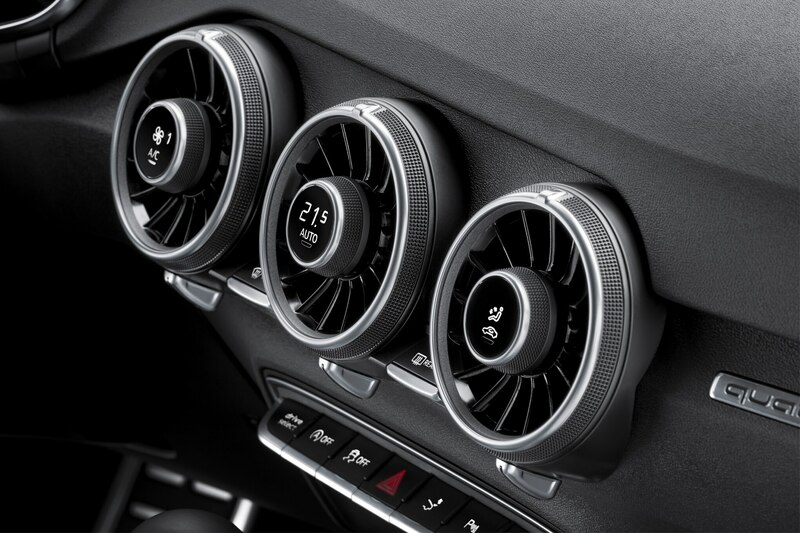 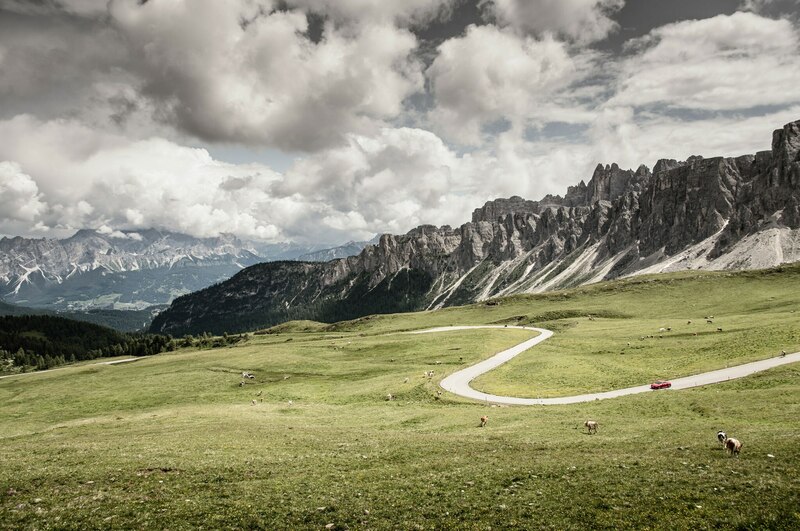 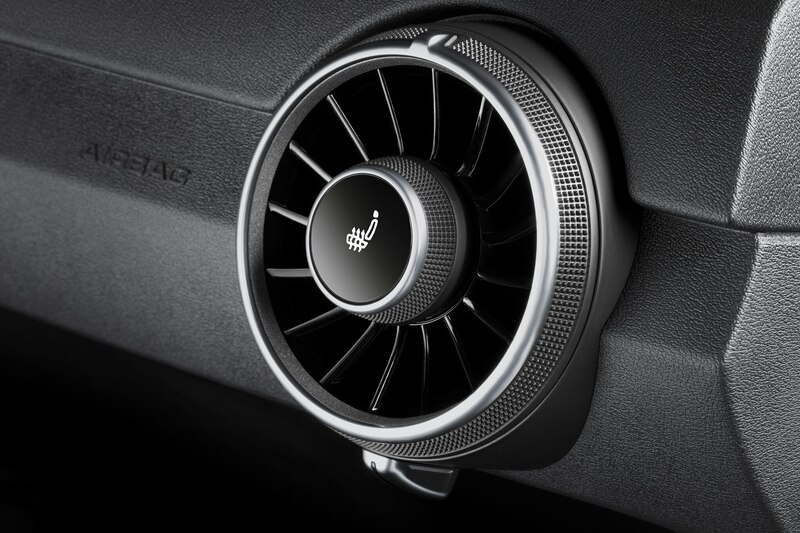 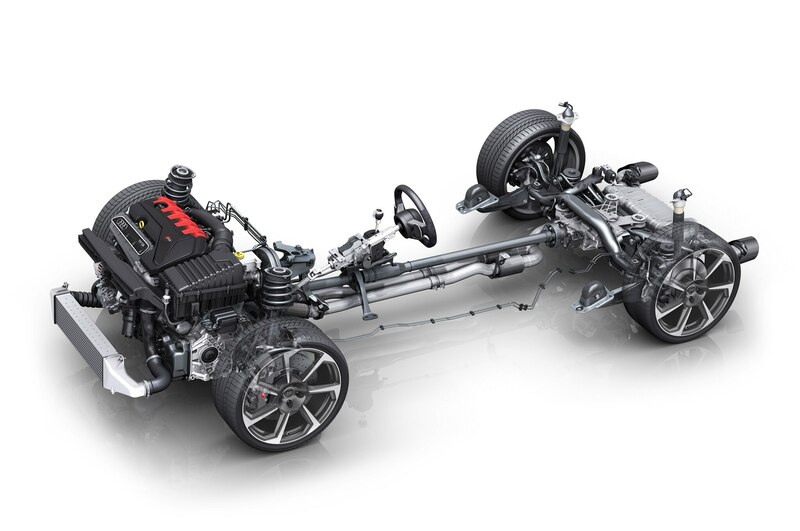 The turbo forces up to 19.6 psi of air into the five cylinders, and the Audi Valvelift System adjust exhaust-valve opening levels for better engine response. 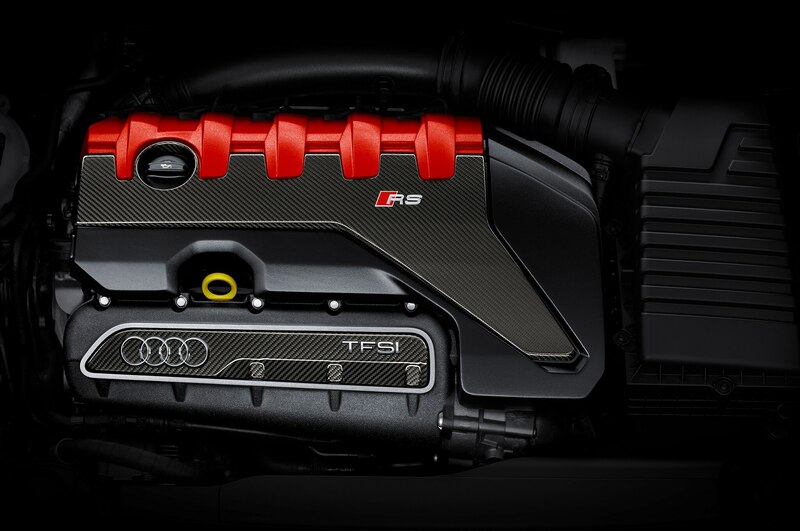 The transmission has a new design for its prop shaft, thus saving another 4.4 lb. 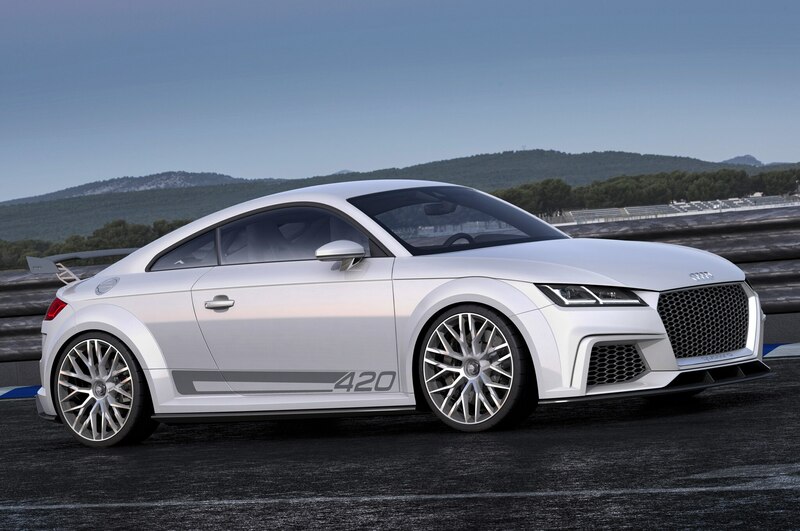 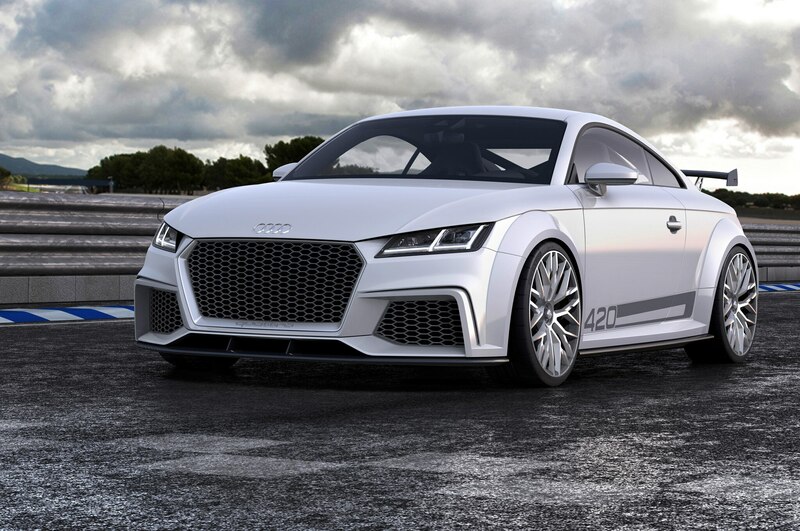 All told, the Audi TT RS is pretty skinny. 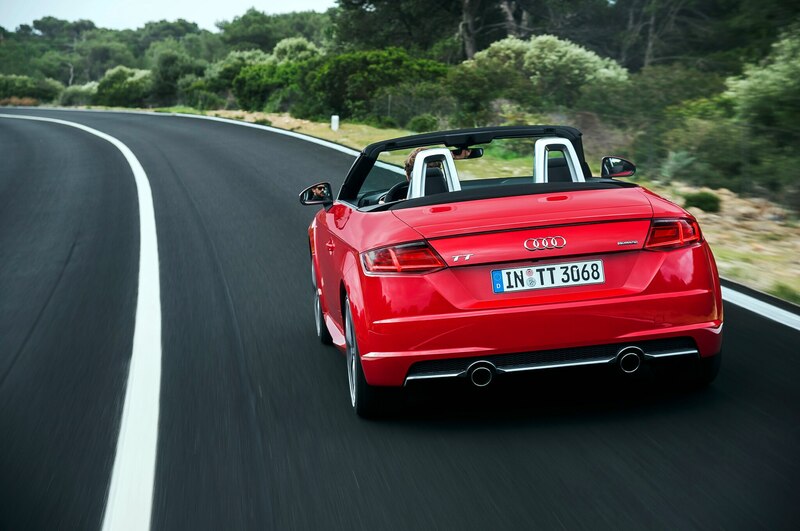 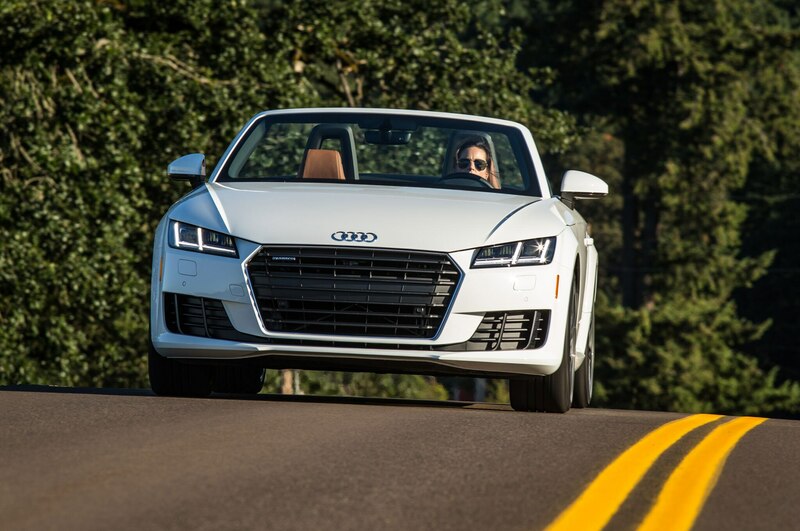 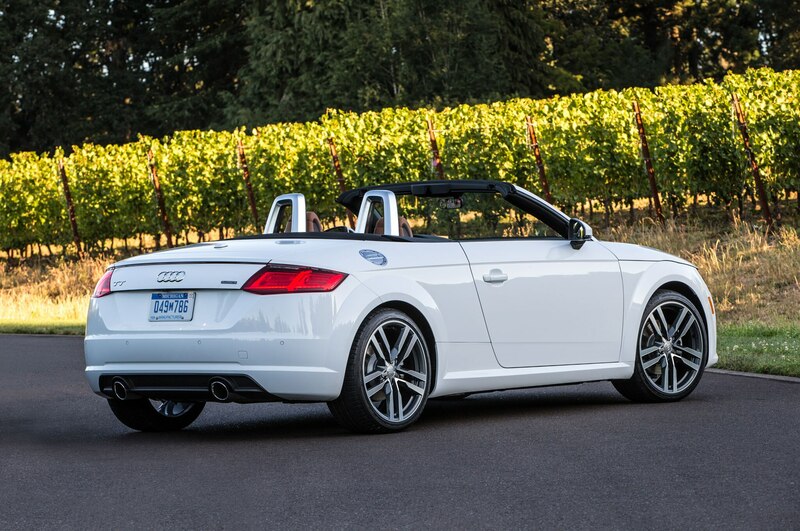 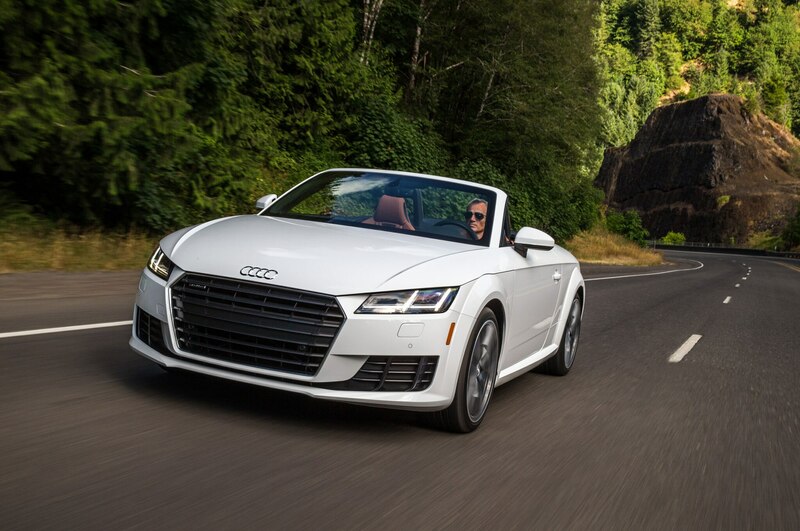 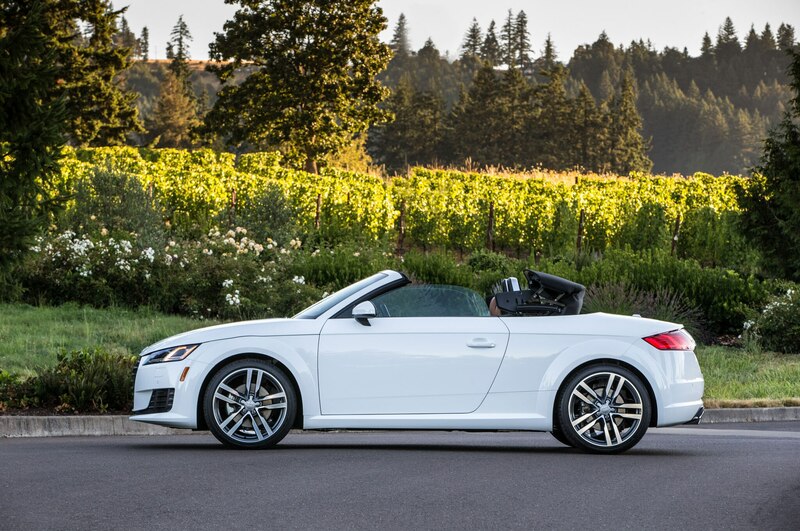 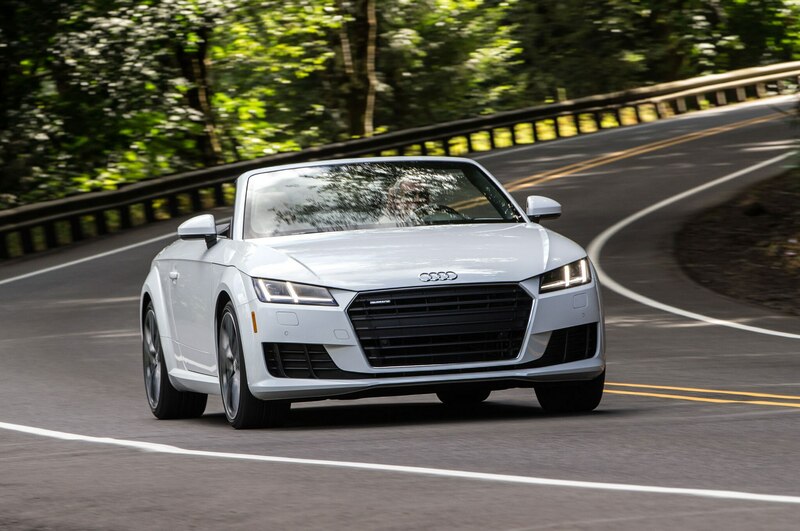 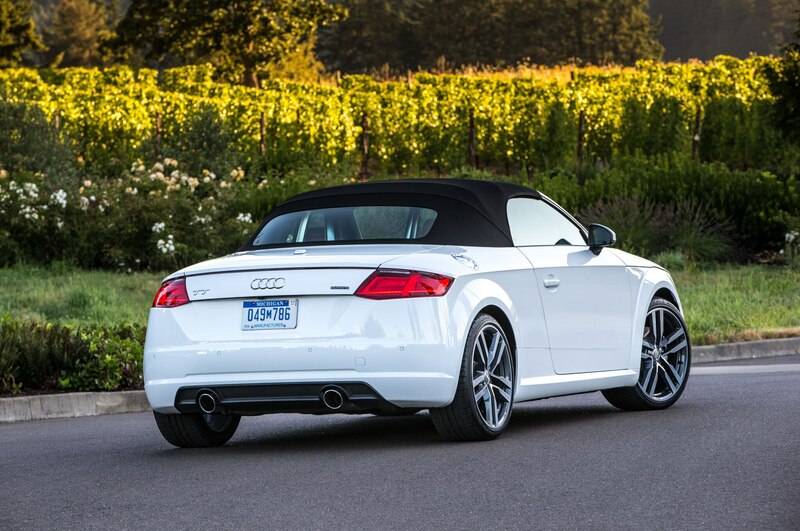 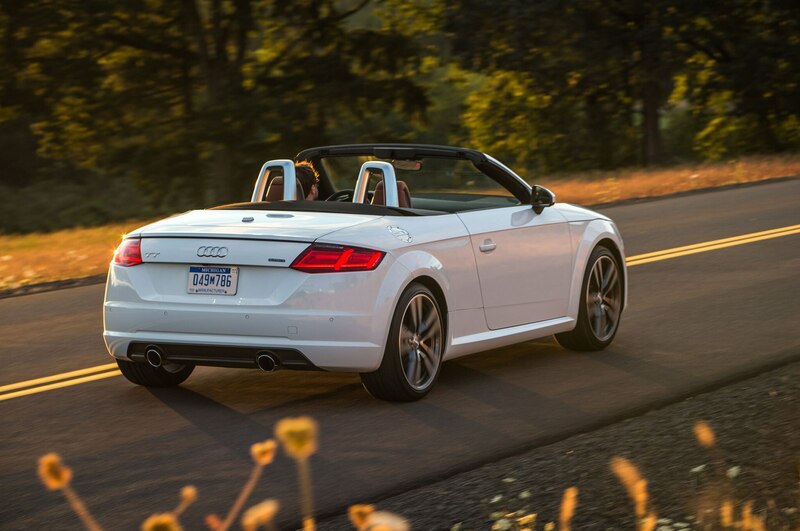 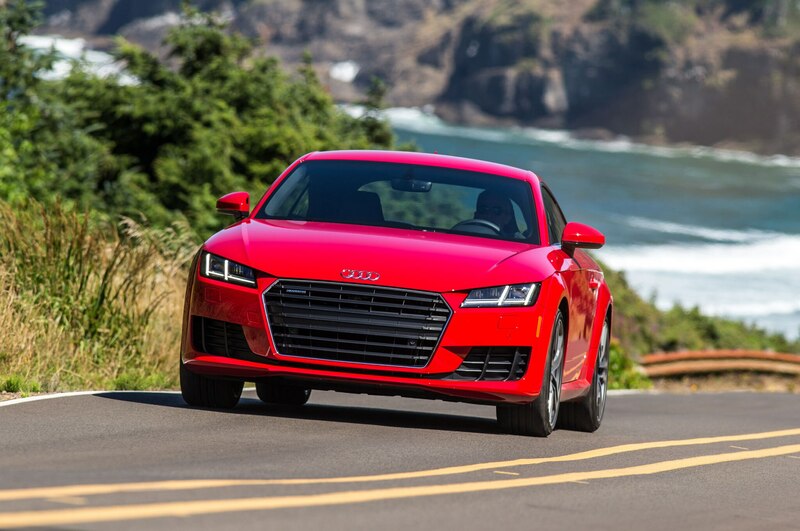 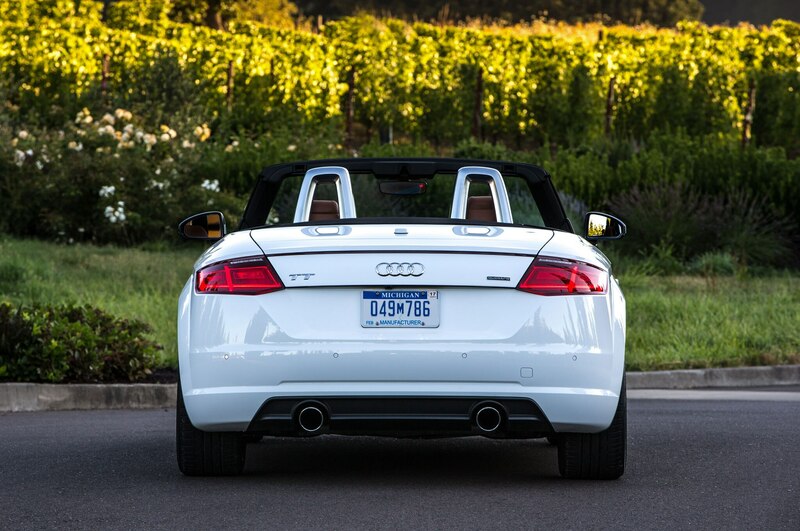 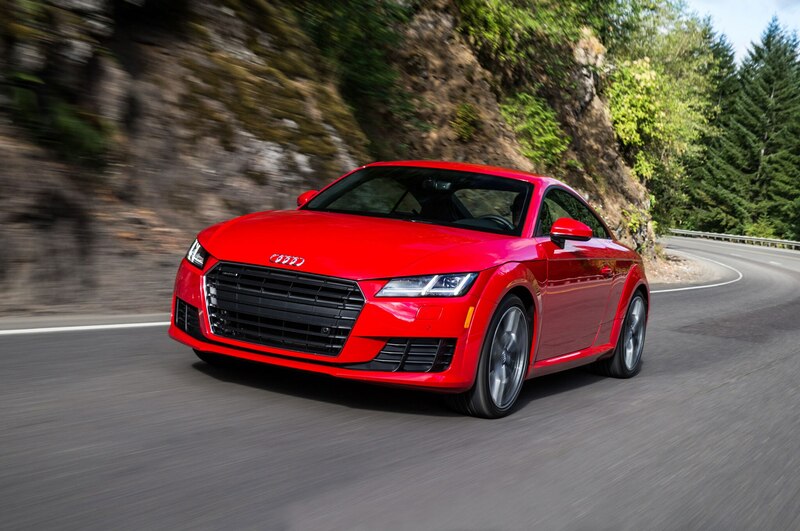 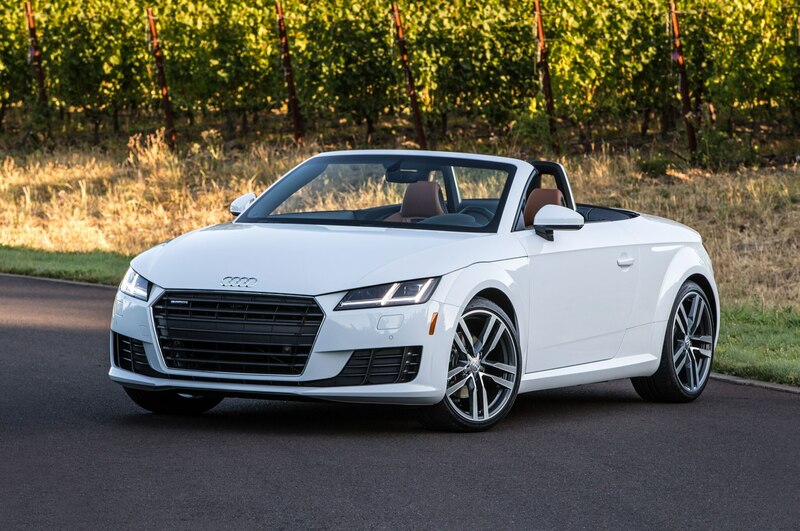 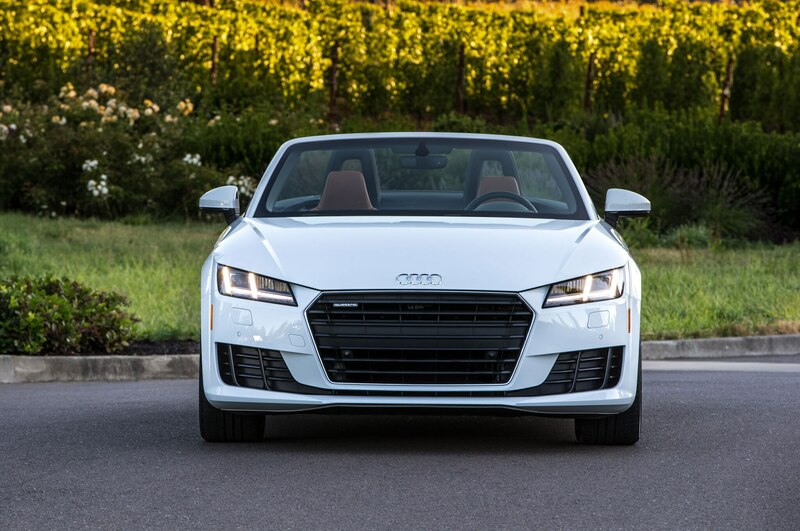 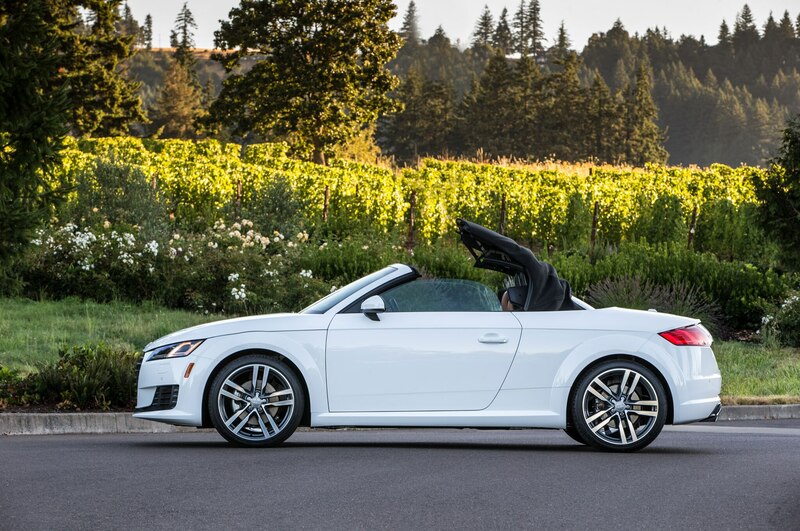 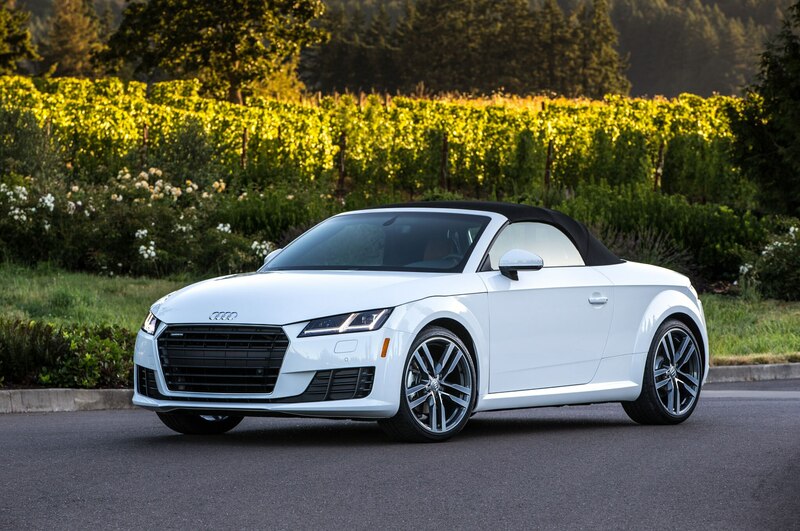 The coupe tips the scales at 3,174 lb, which Audi says is 22 lb less than the outgoing model, while the convertible is just 3,373 lb. 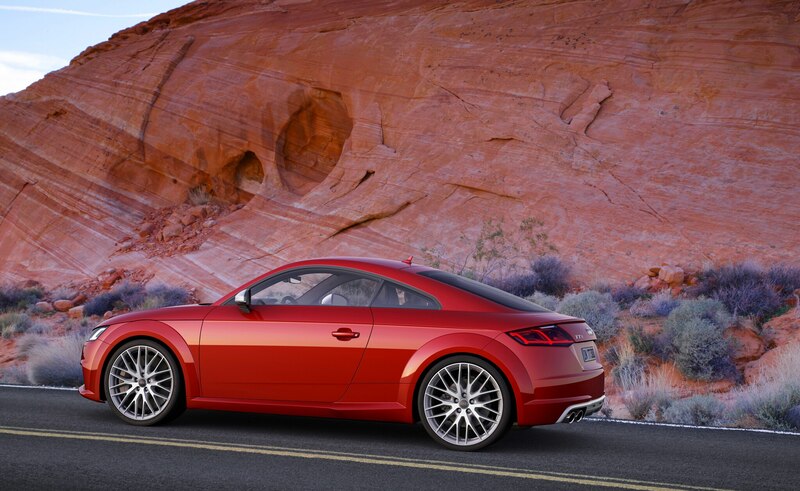 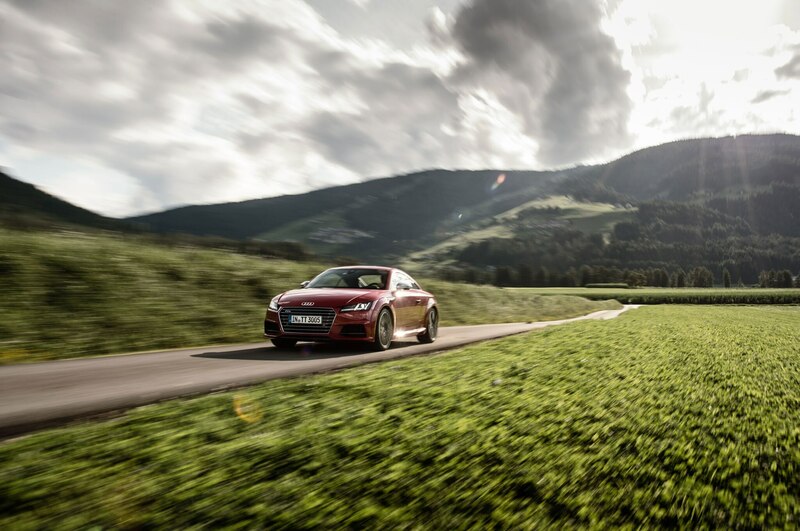 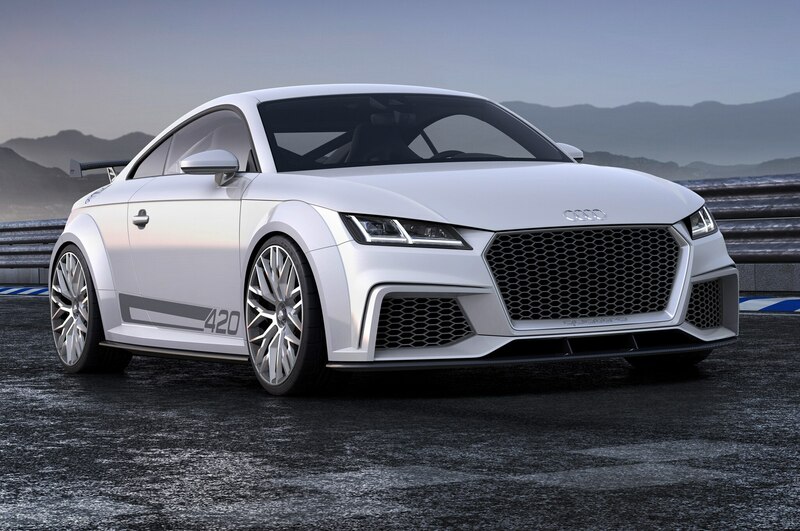 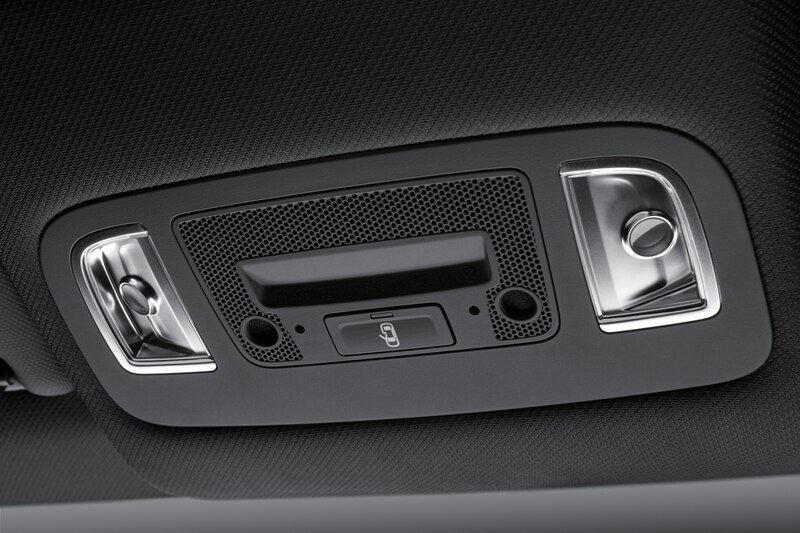 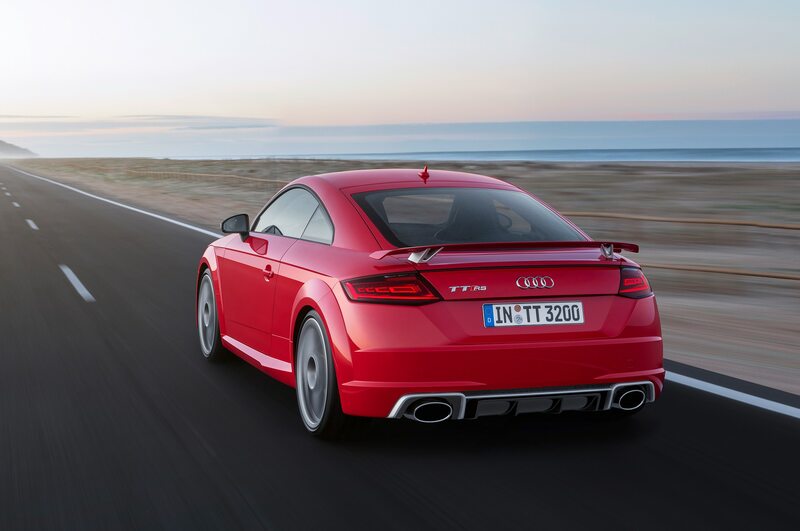 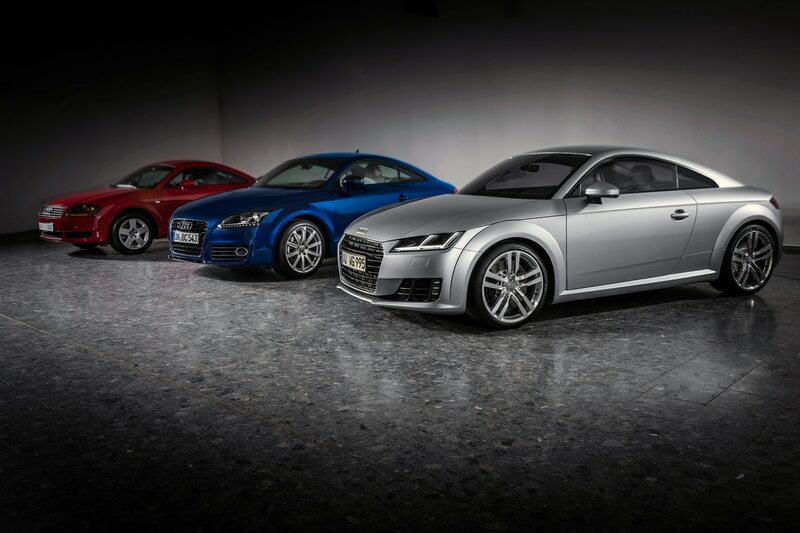 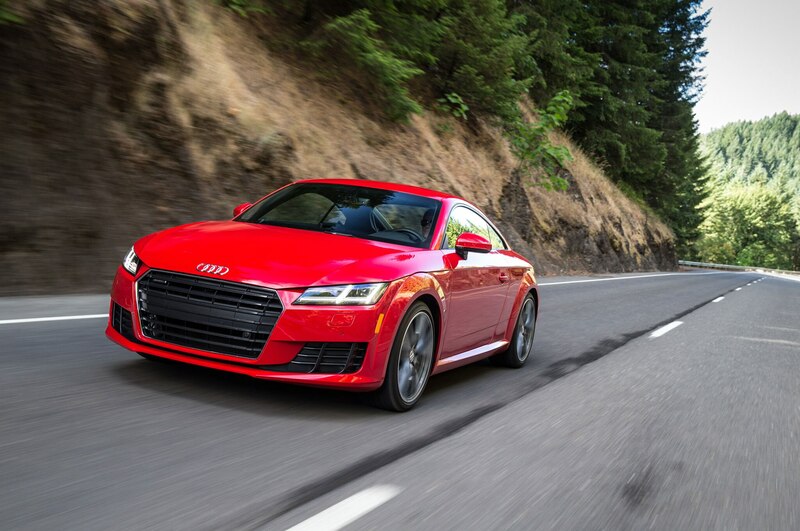 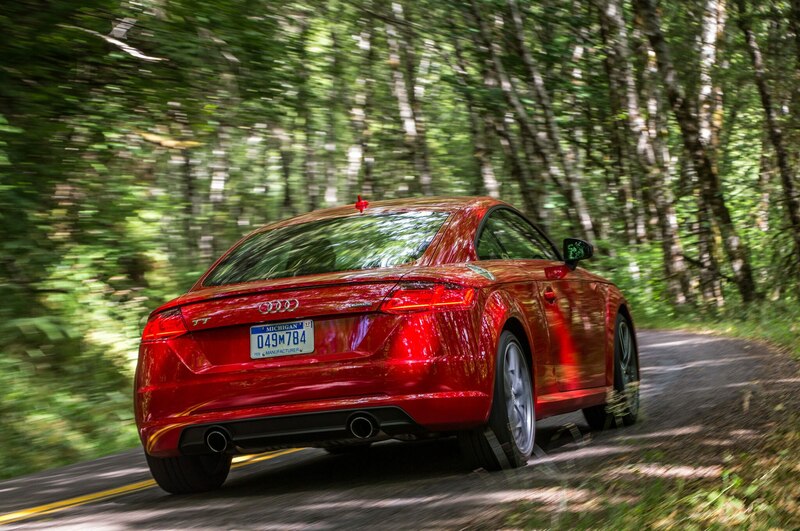 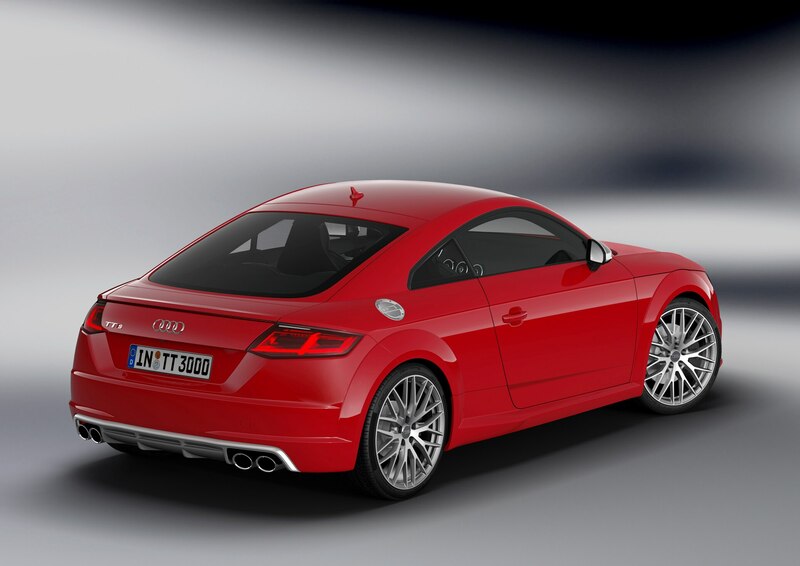 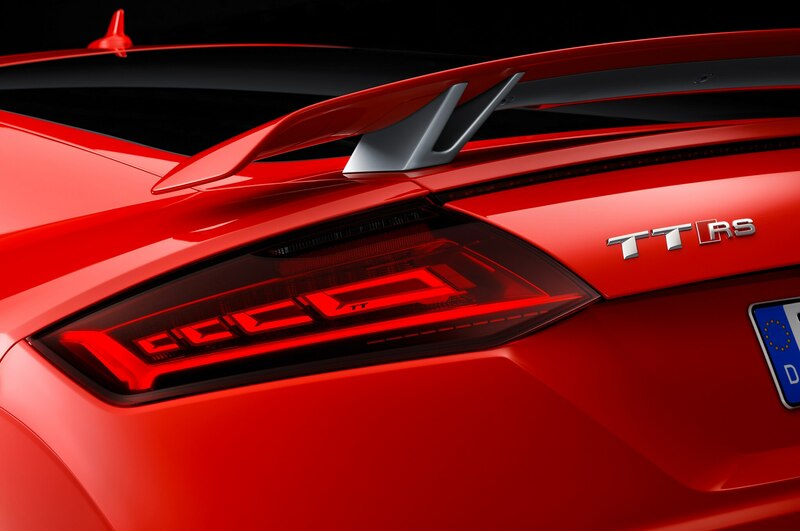 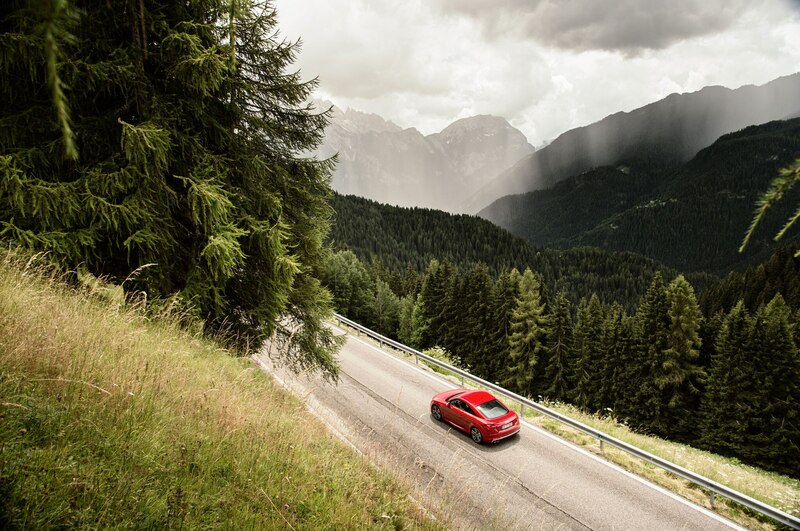 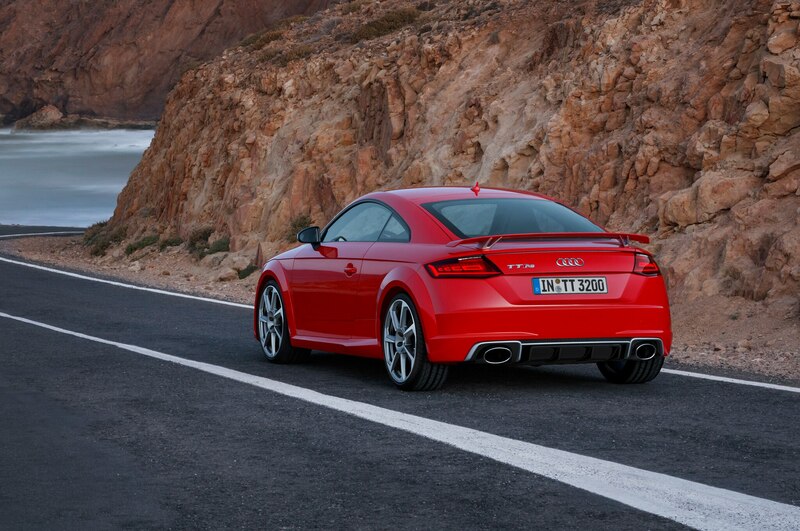 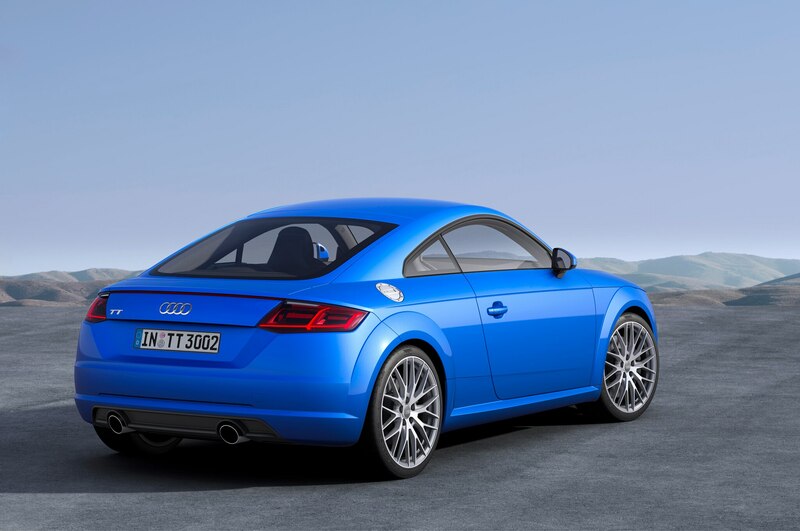 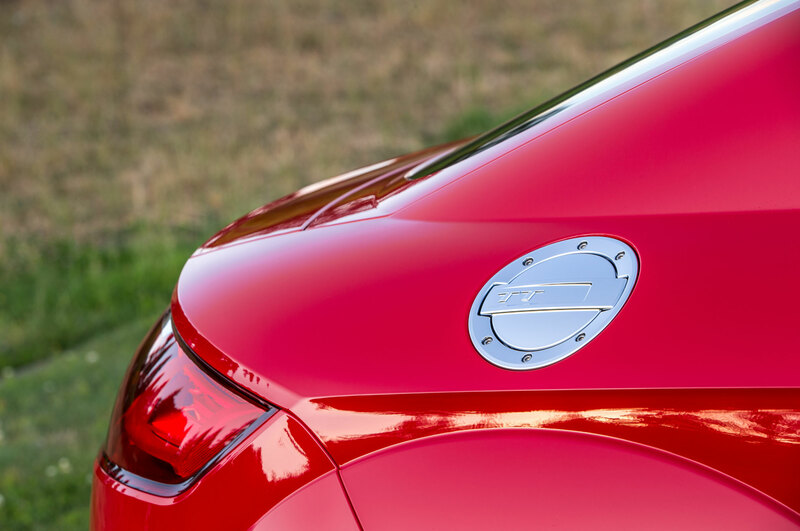 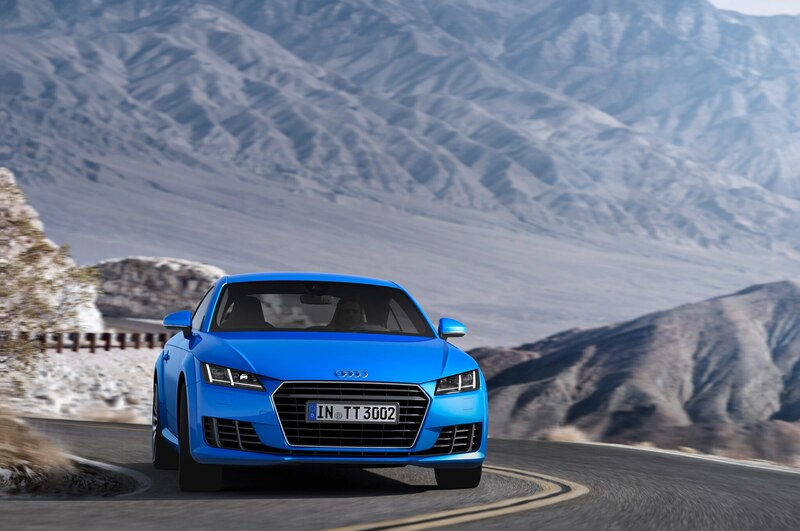 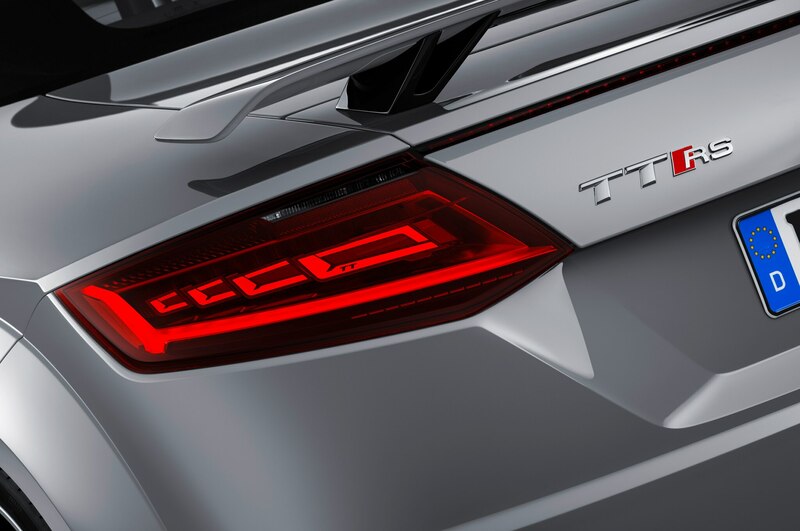 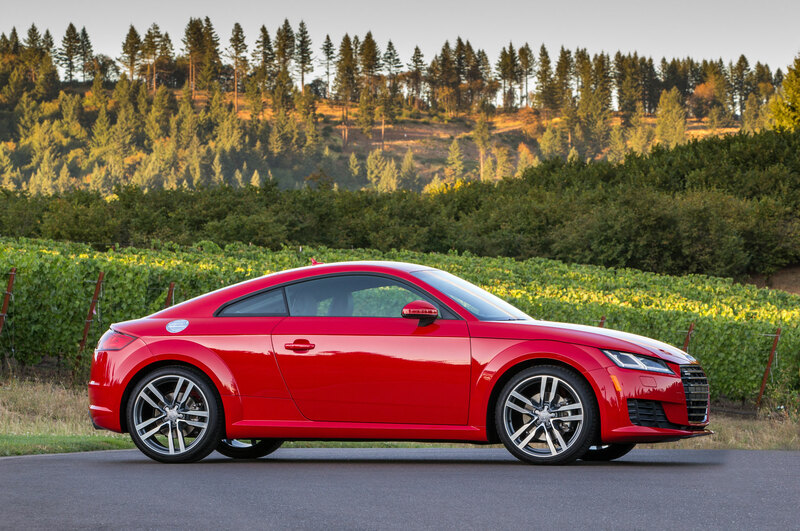 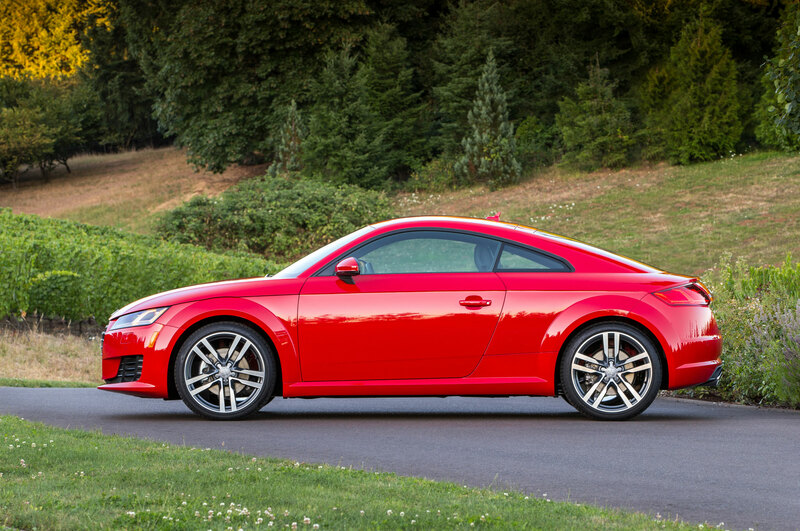 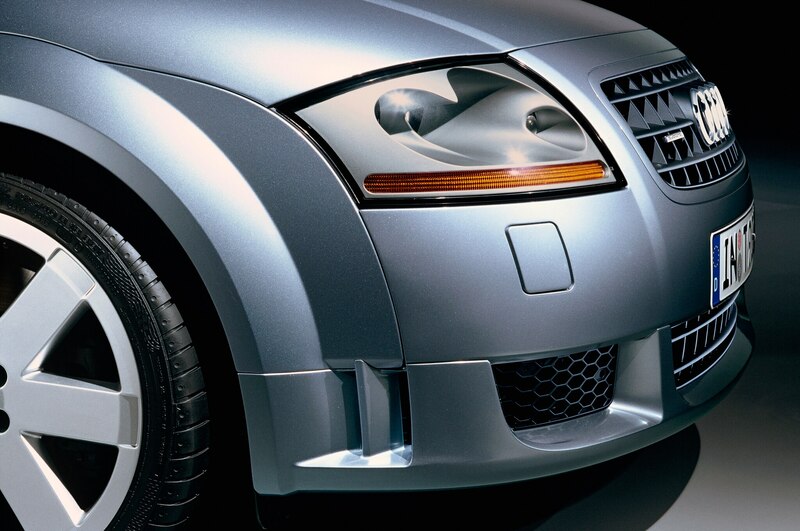 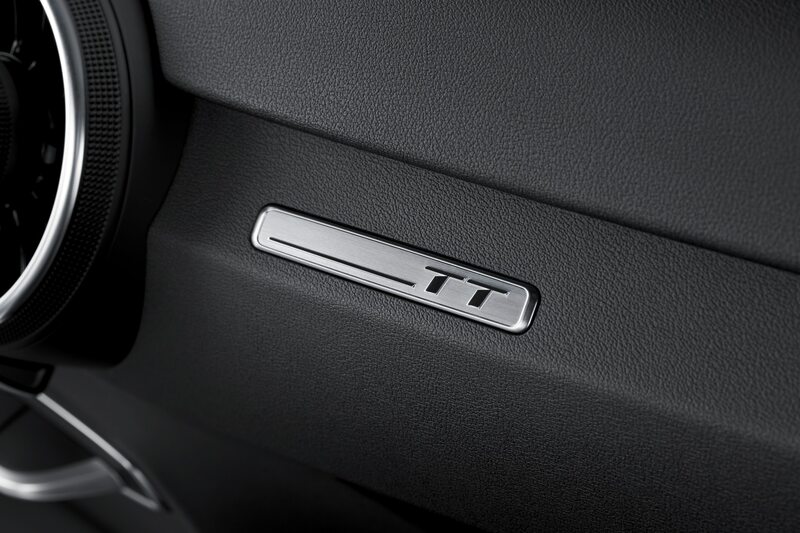 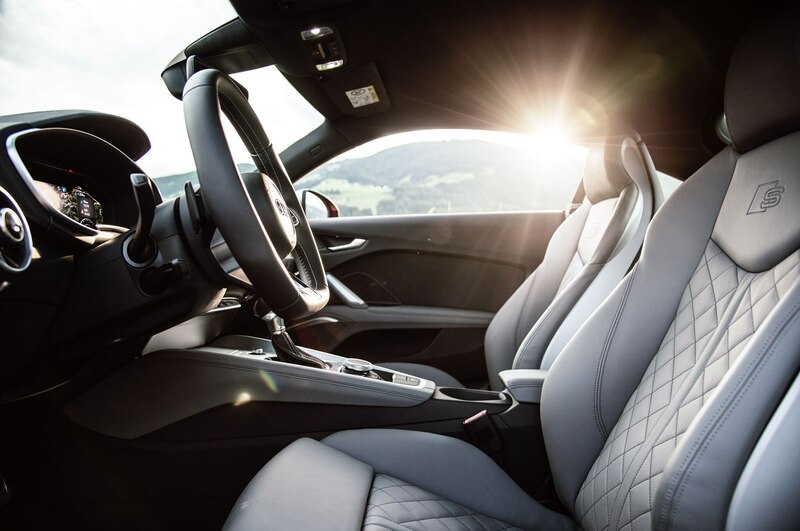 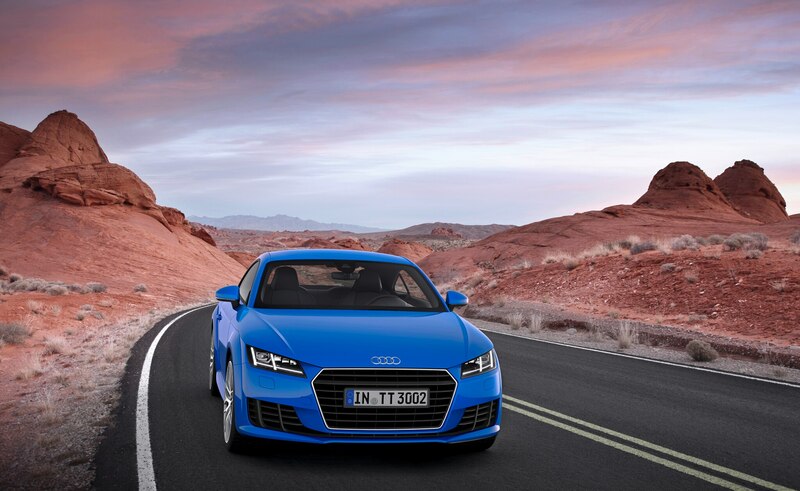 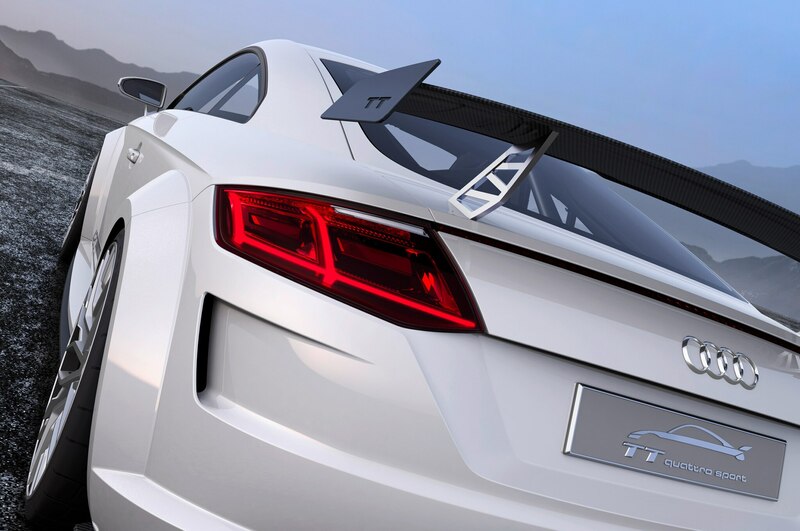 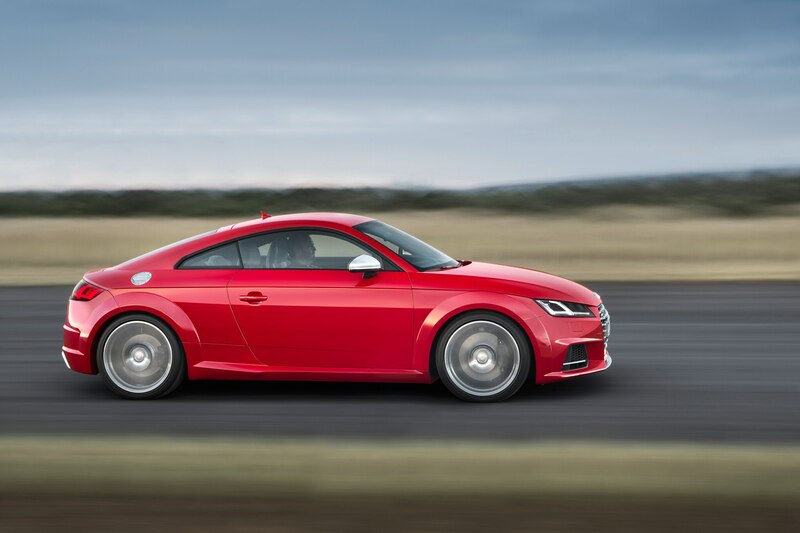 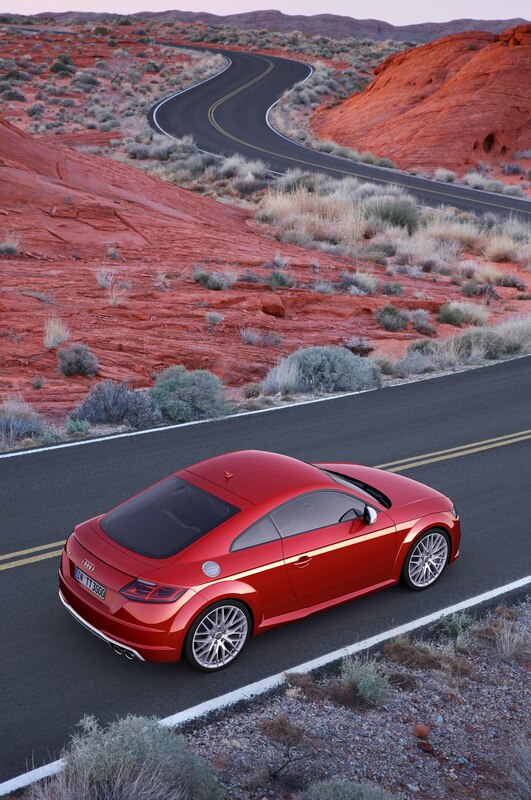 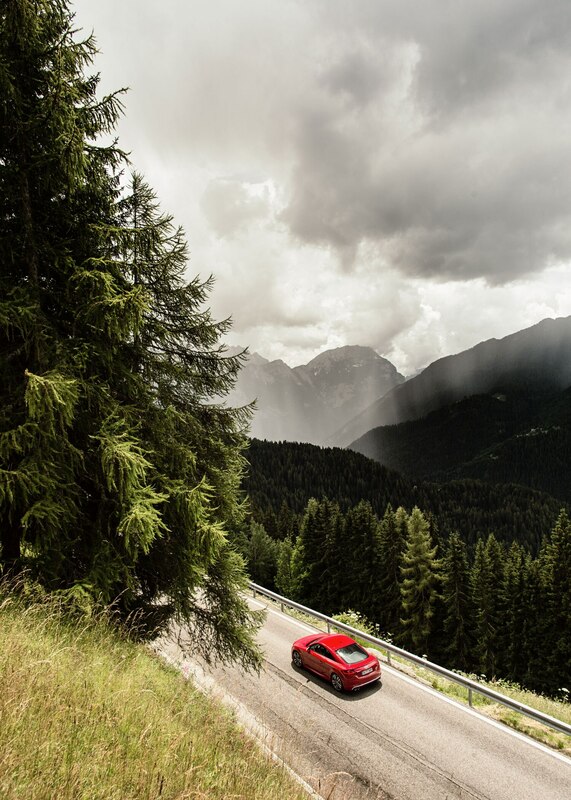 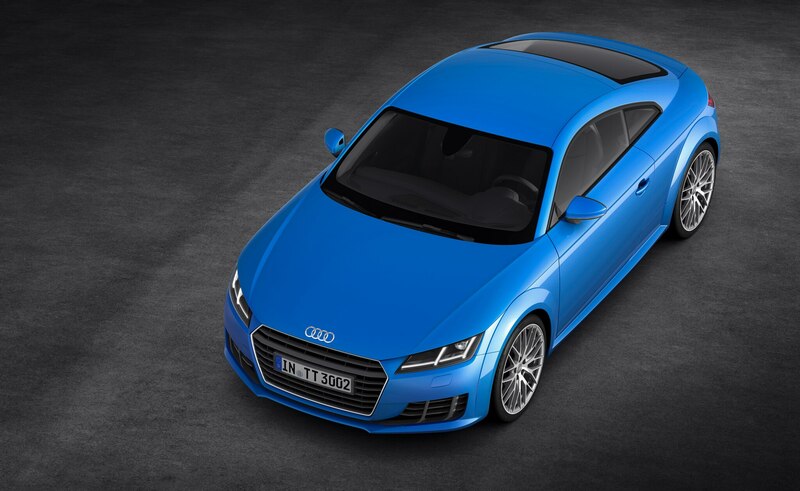 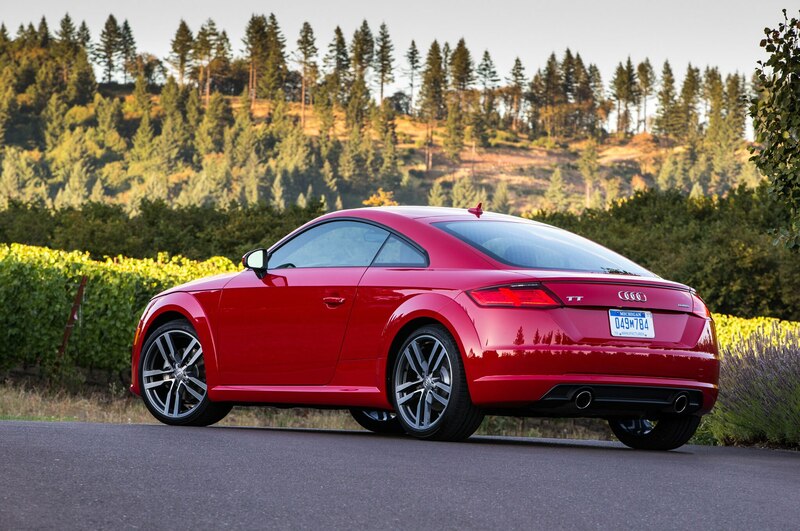 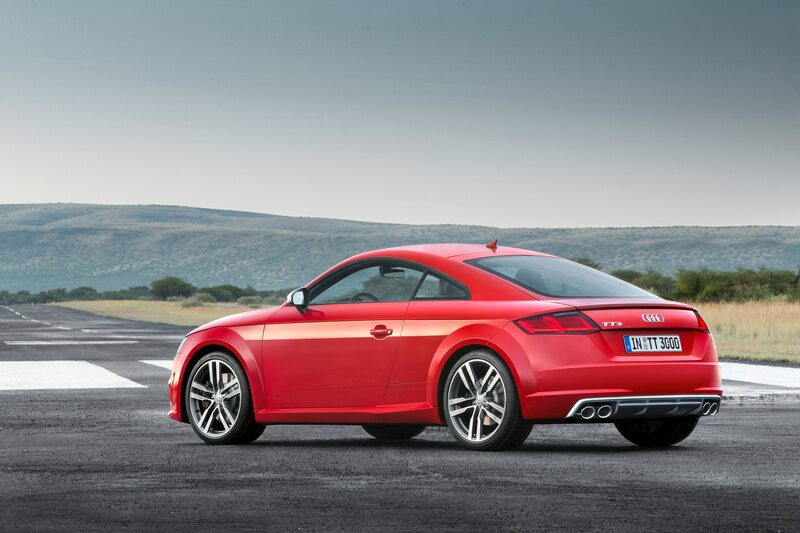 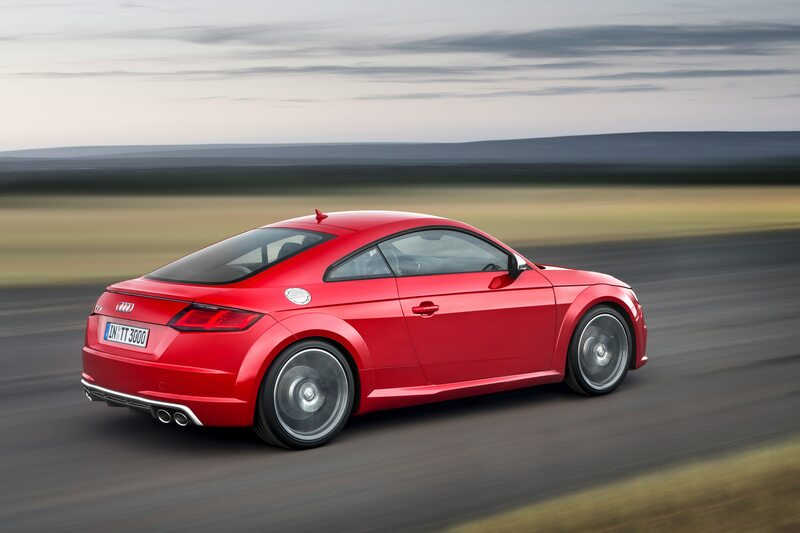 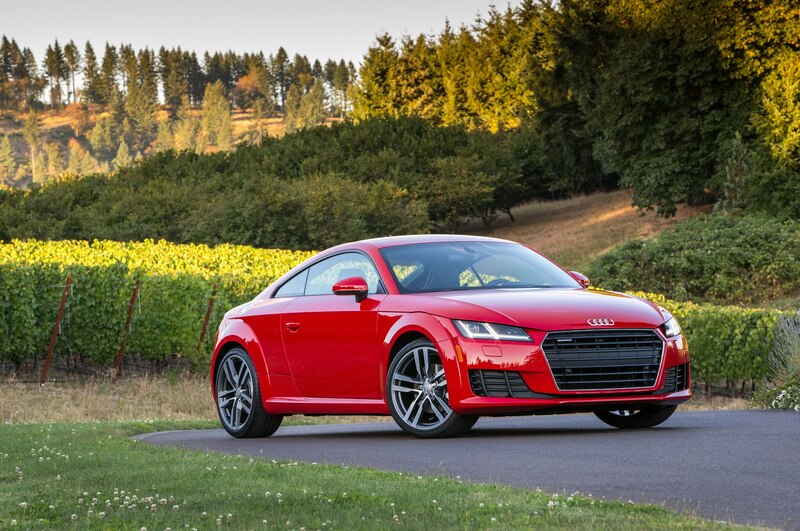 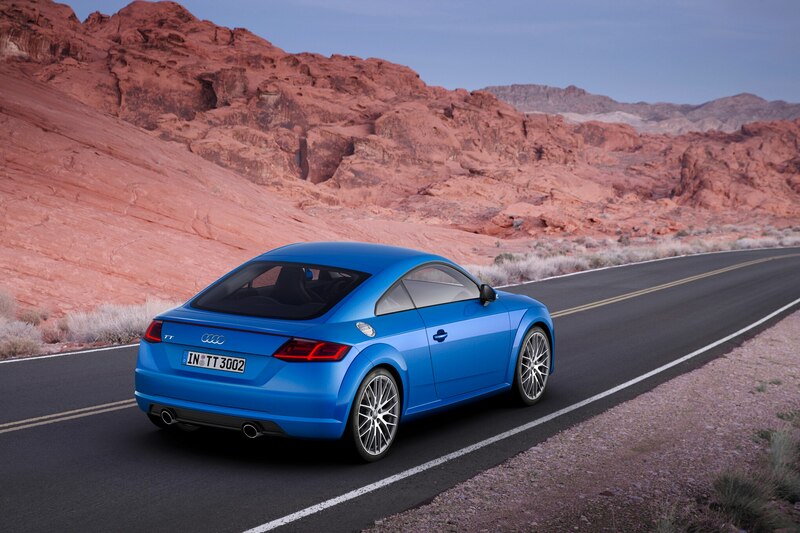 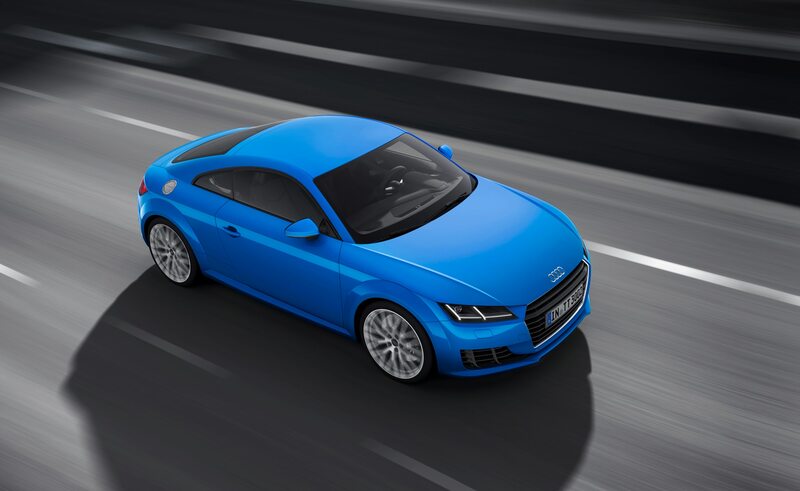 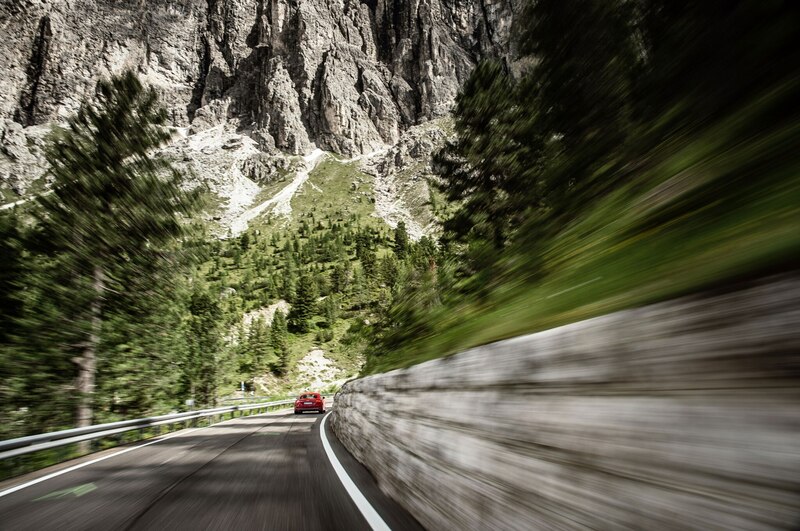 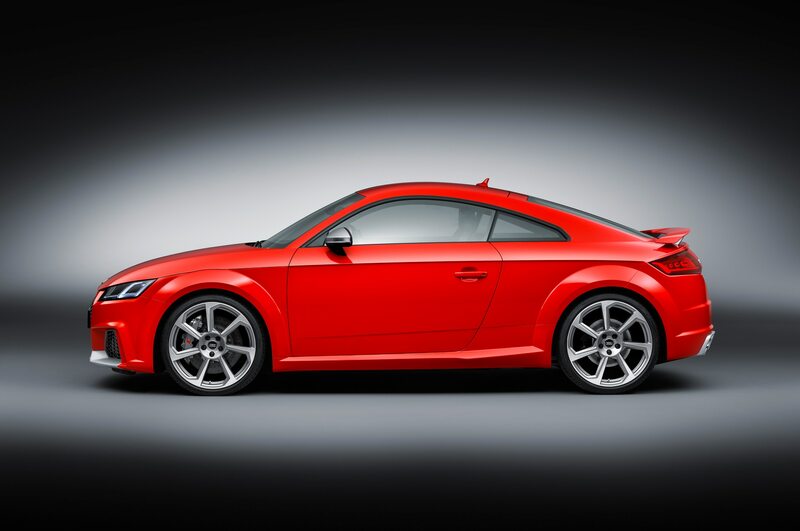 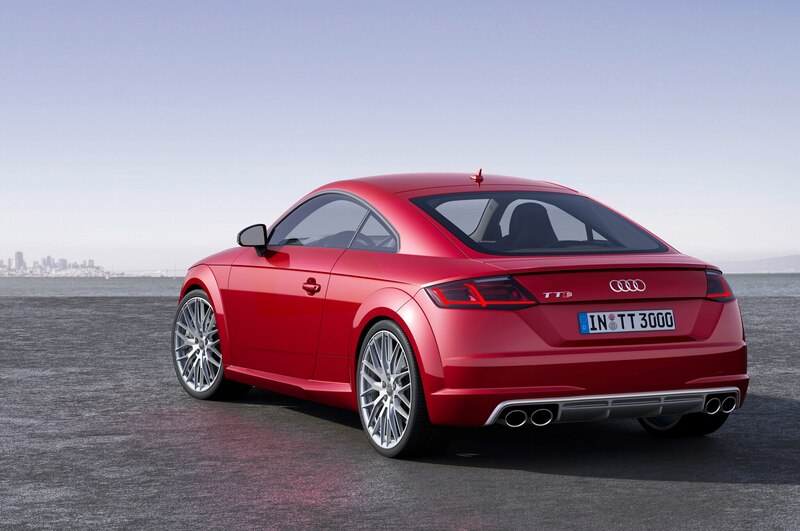 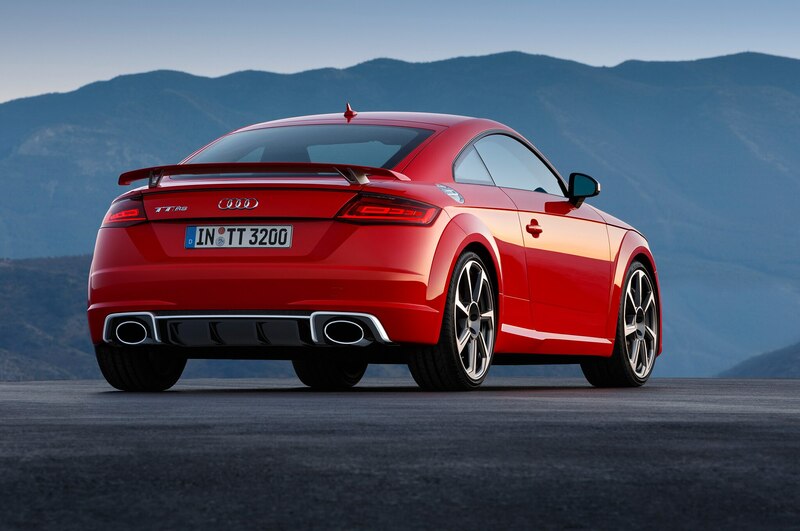 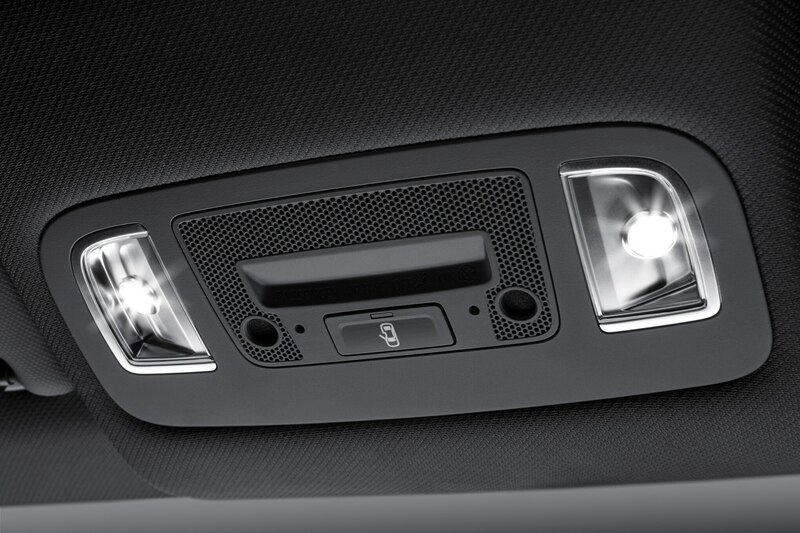 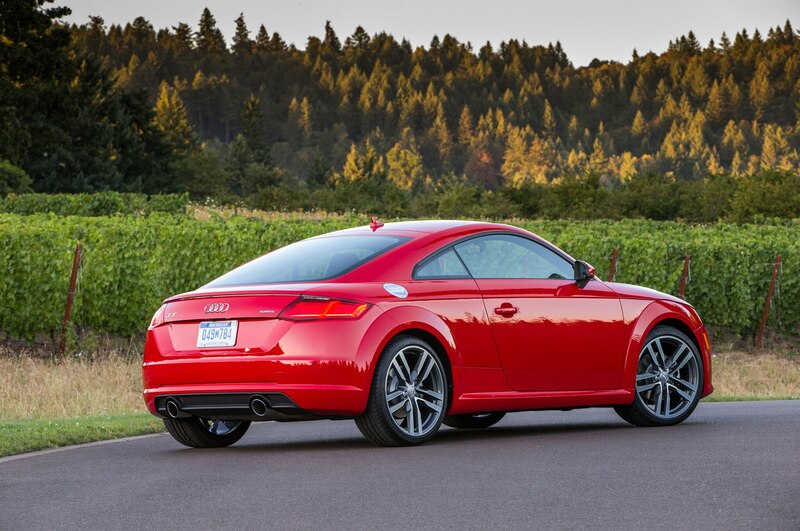 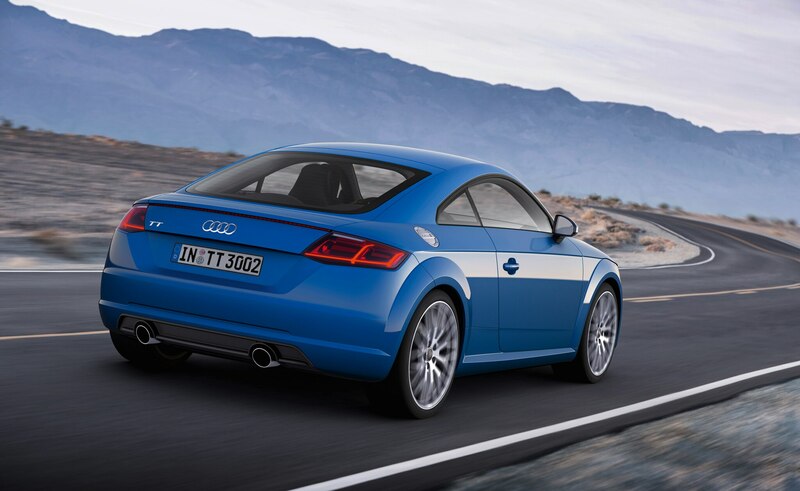 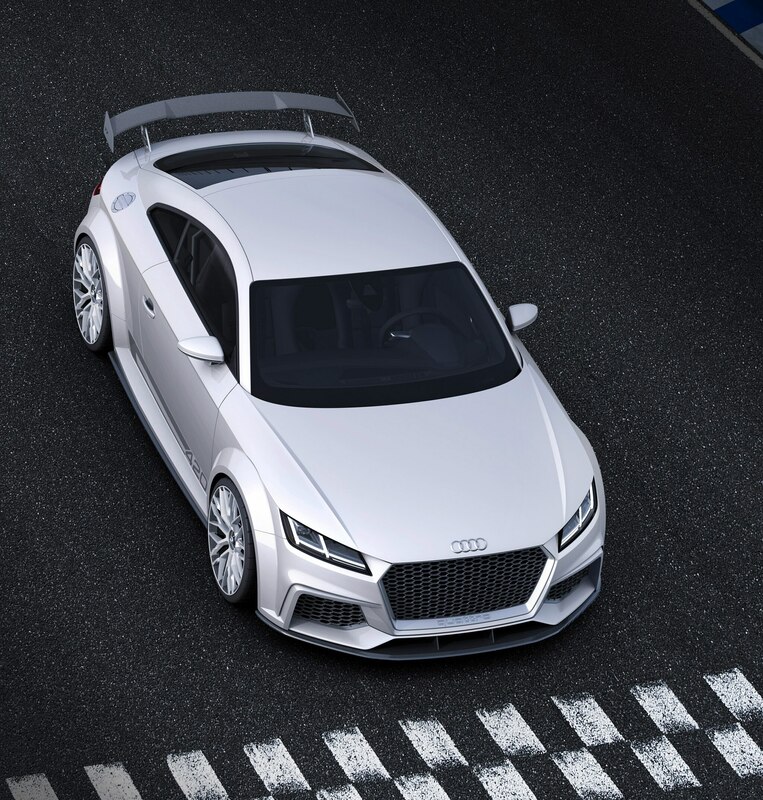 Sporty enhancements continue throughout the Audi TT RS. 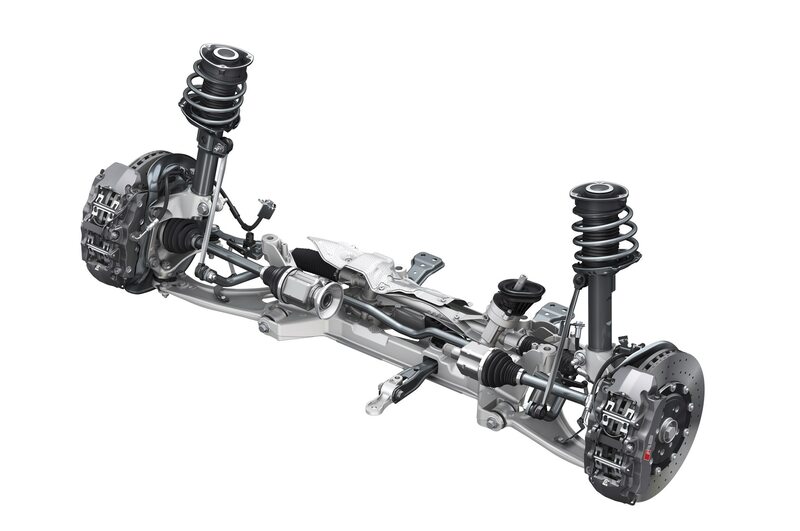 The suspension is 0.4 inch lower, with adjustable magnetic dampers available as an option. 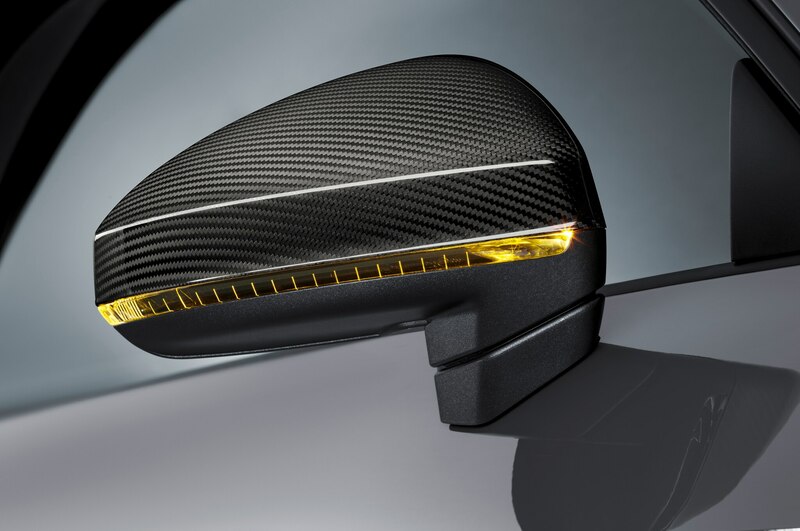 Cross-drilled front brakes measure 14.6 inches in diameter, with carbon-ceramics available as an option. 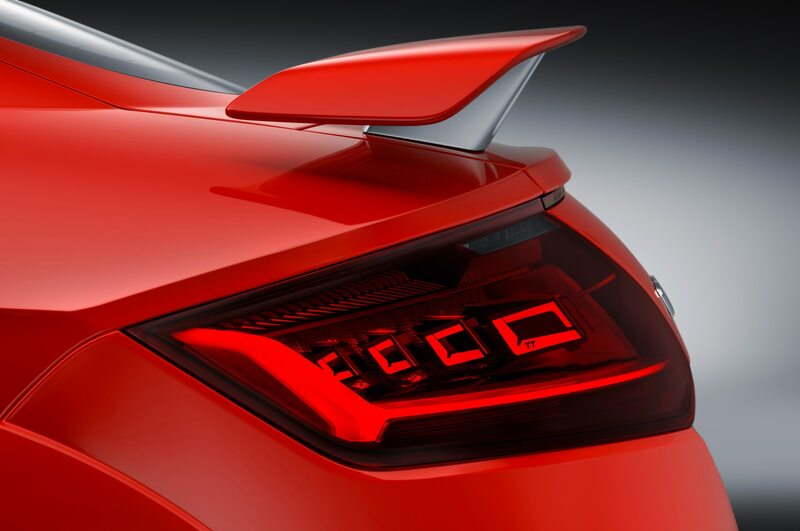 Buyers can pick between a fixed rear wing or an electrically deploying version that opens and closes automatically. 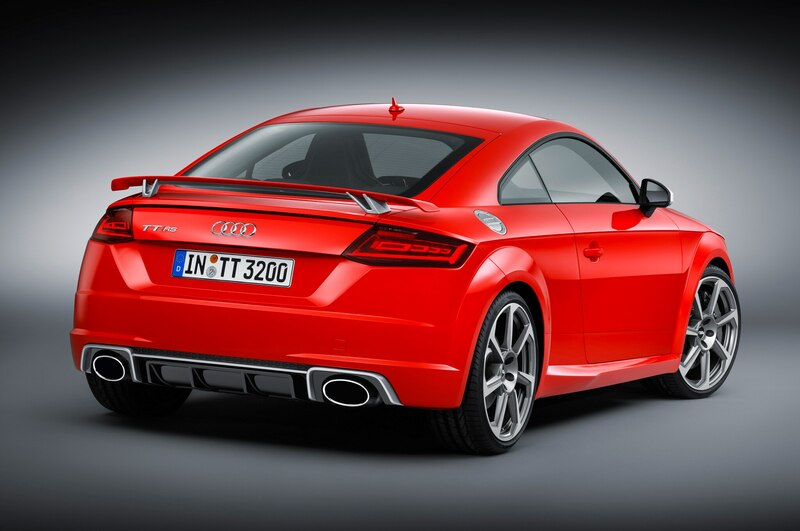 And the exhaust has a special flap that can make the TT RS louder or quieter on demand. 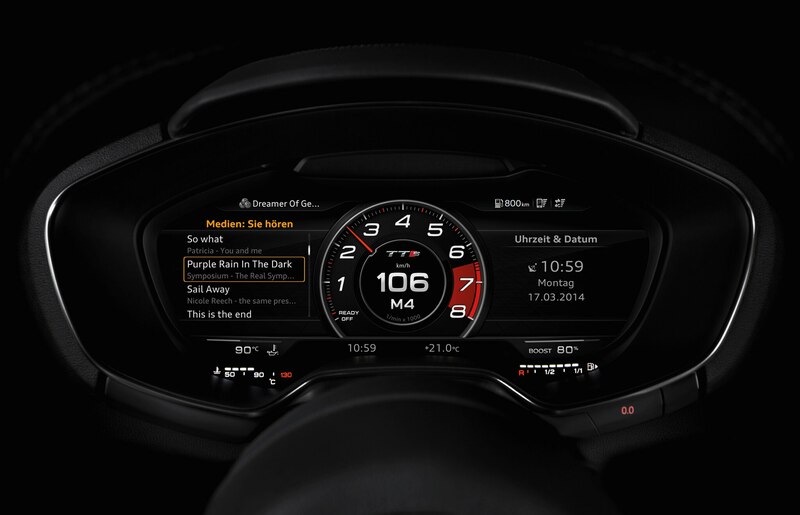 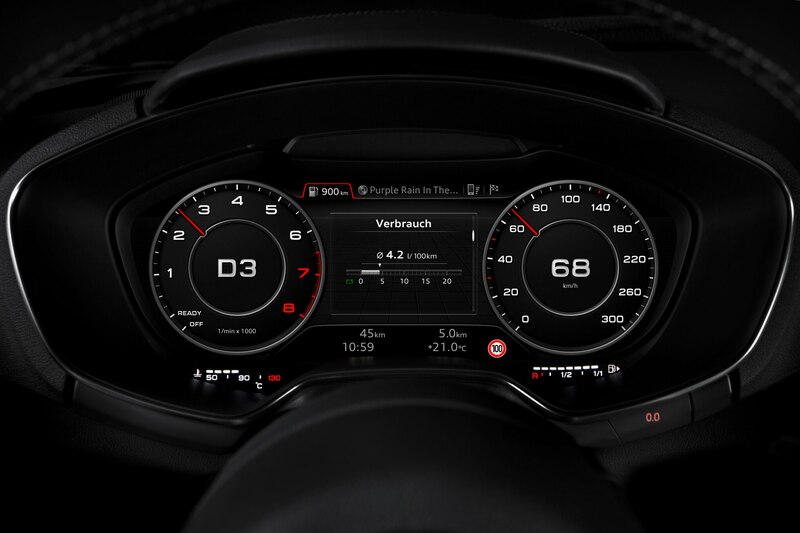 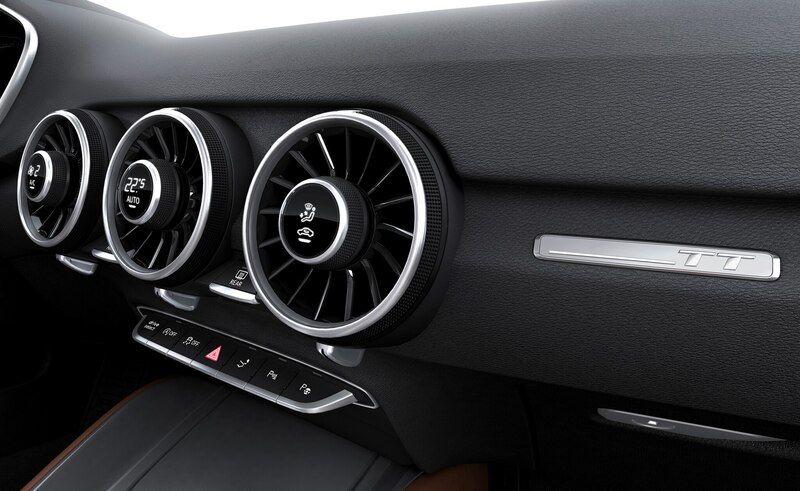 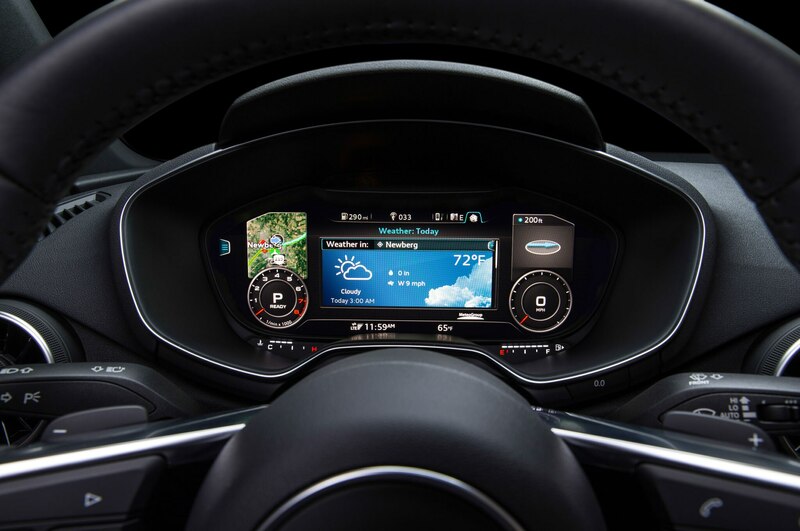 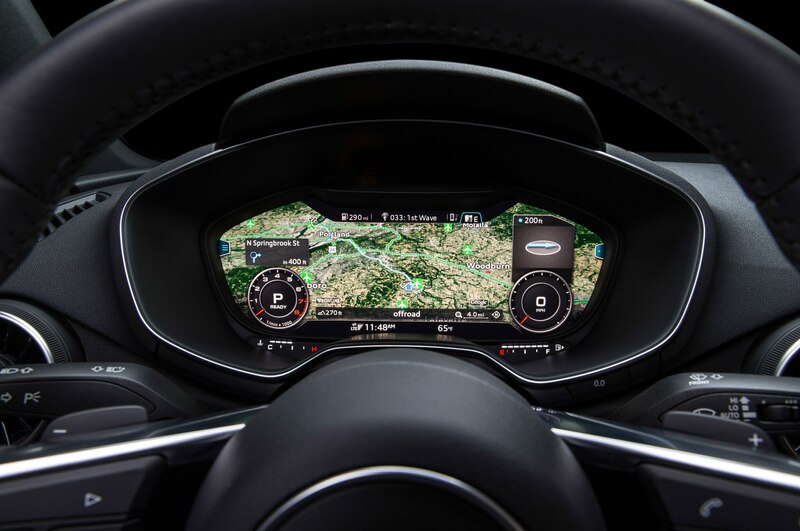 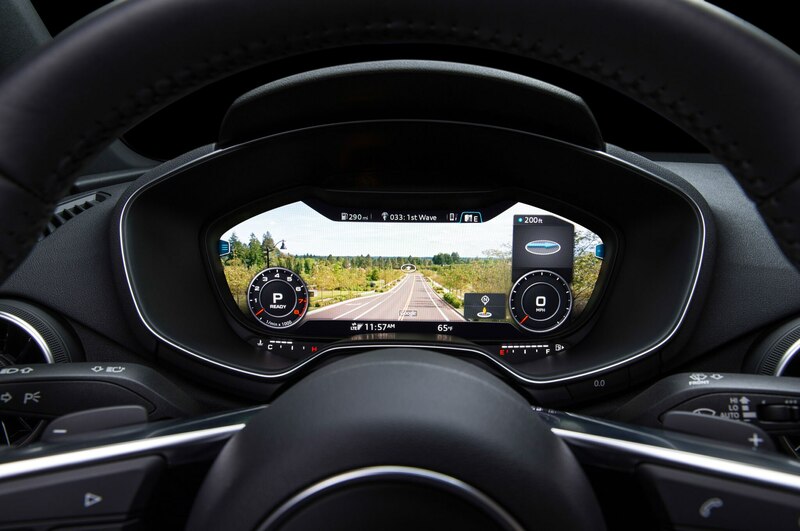 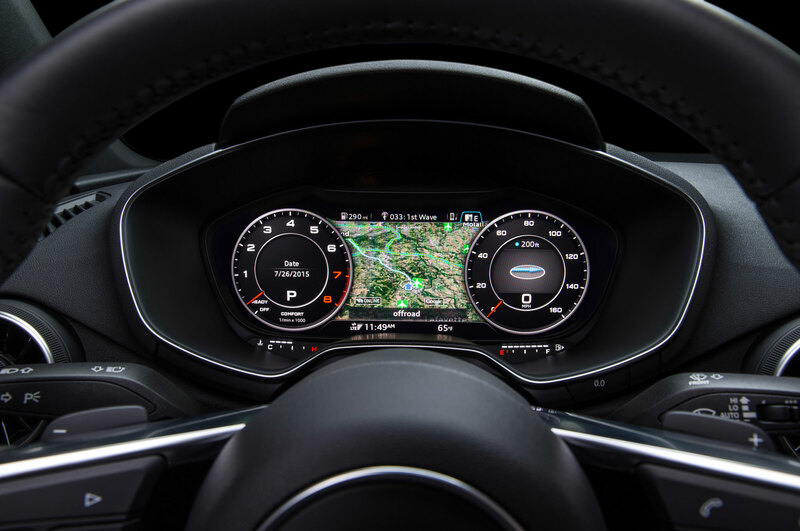 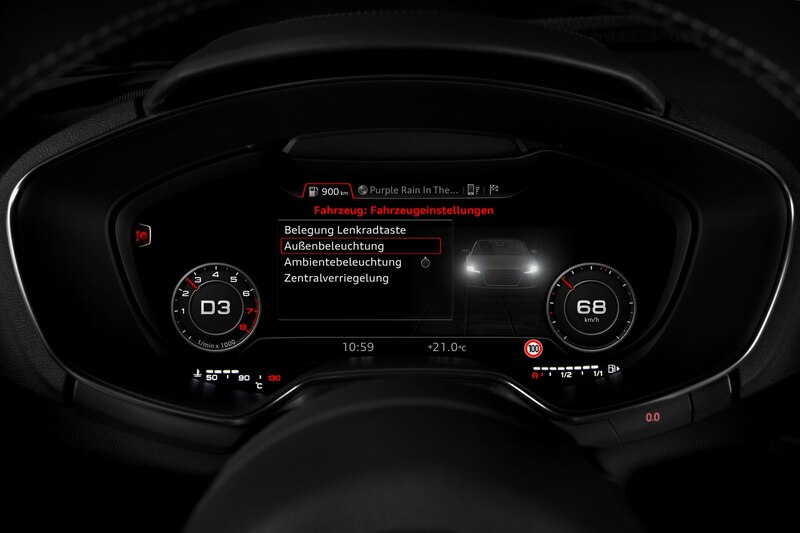 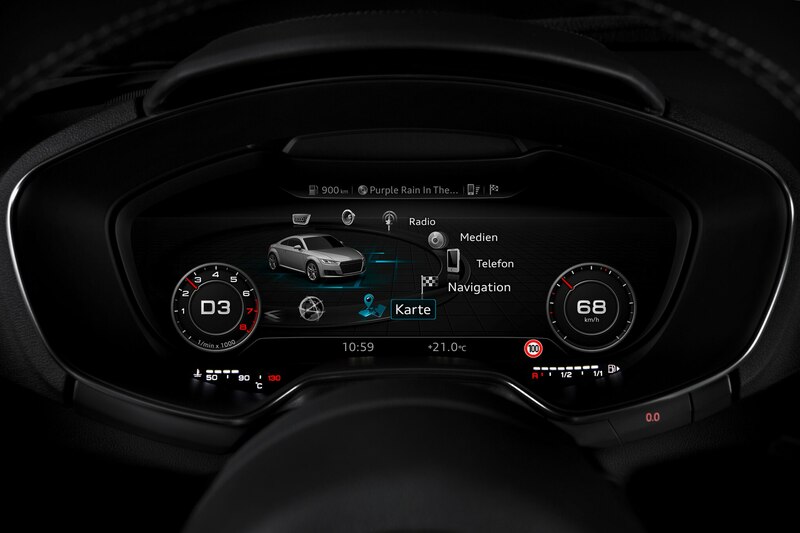 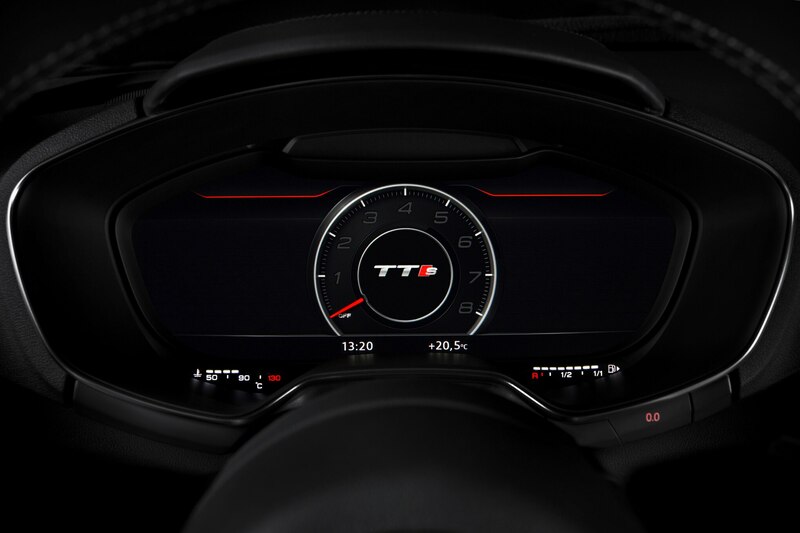 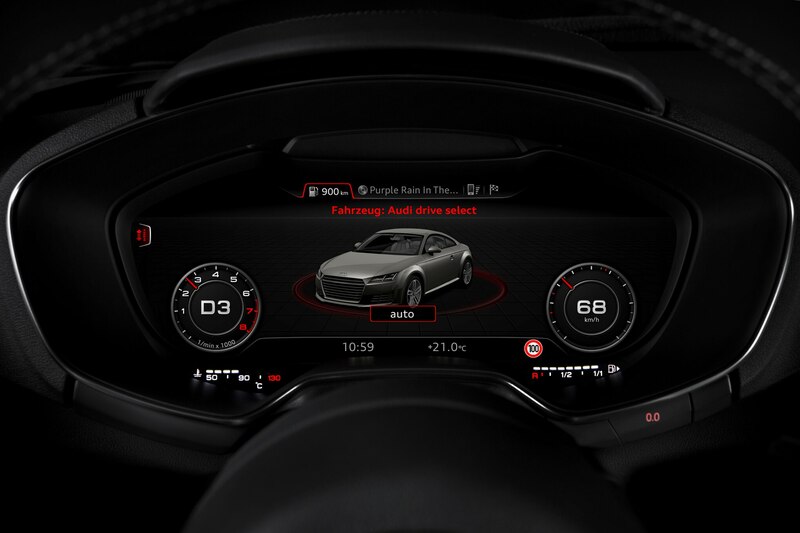 As in other versions of the newest Audi TT, the cockpit is a sparse affair, with information and entertainment duties handled on the 12.3-inch Virtual Cockpit color screen ahead of the driver. 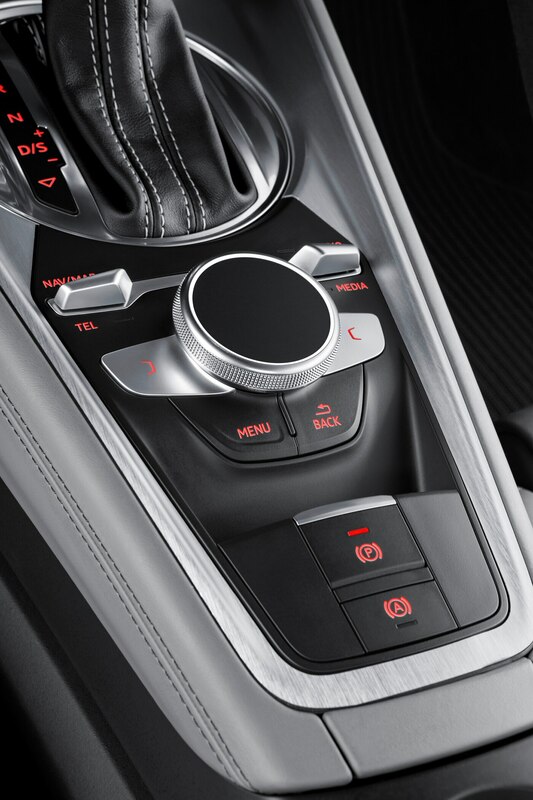 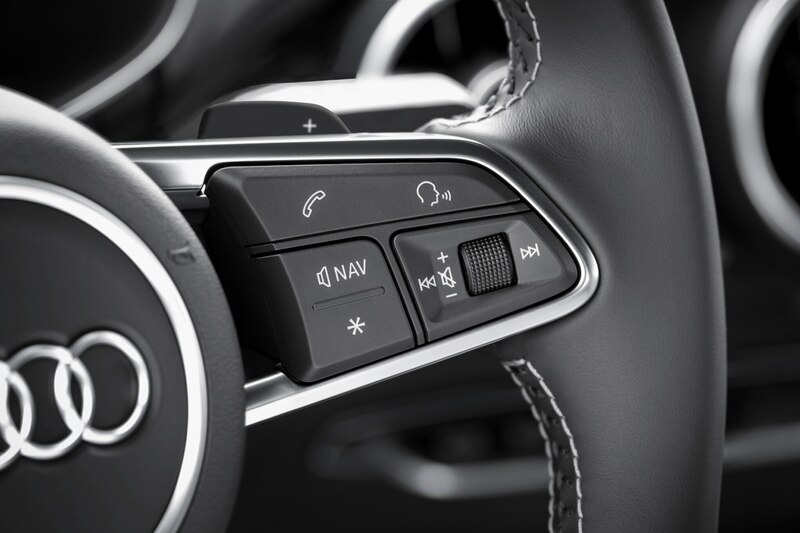 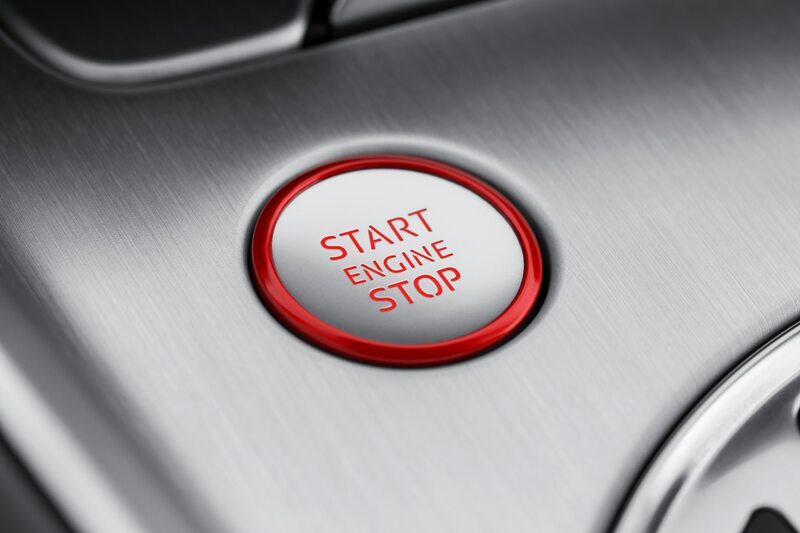 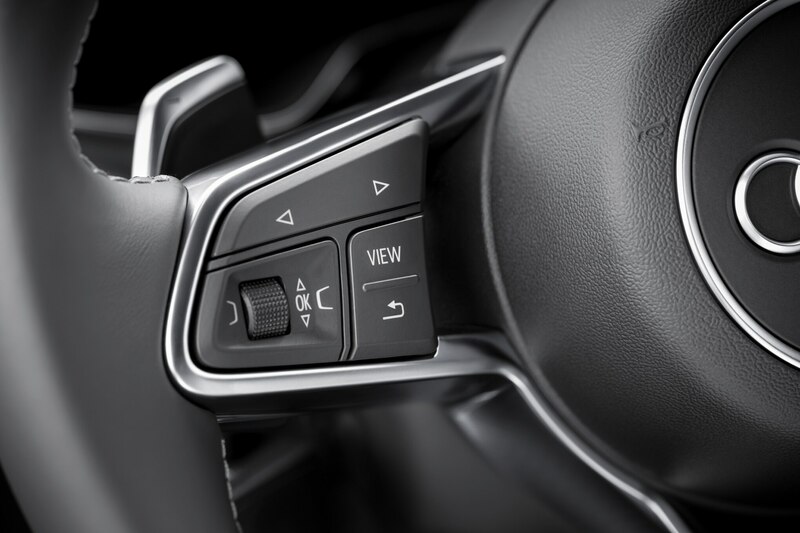 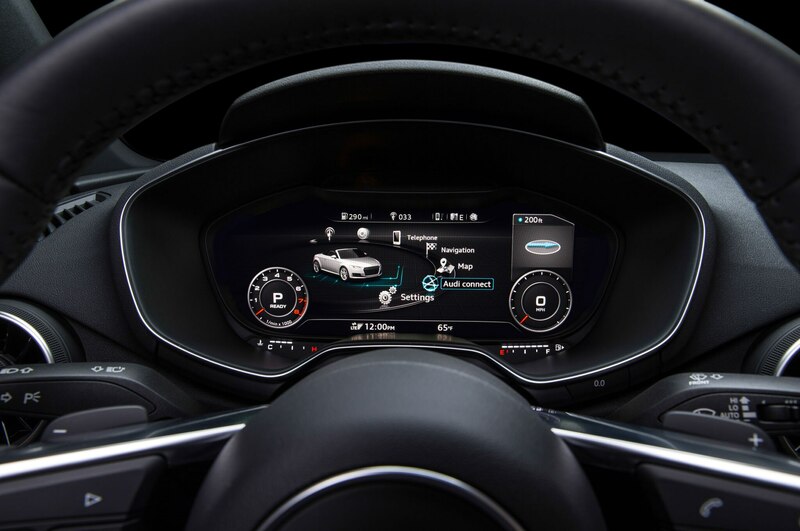 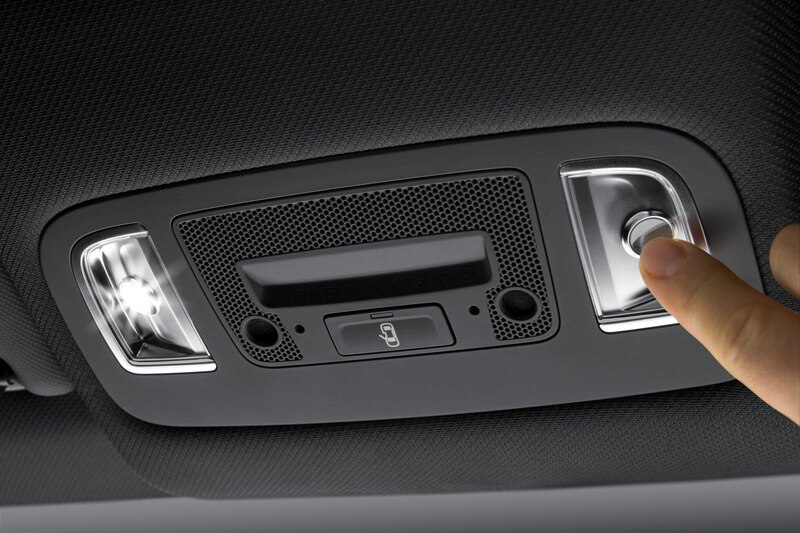 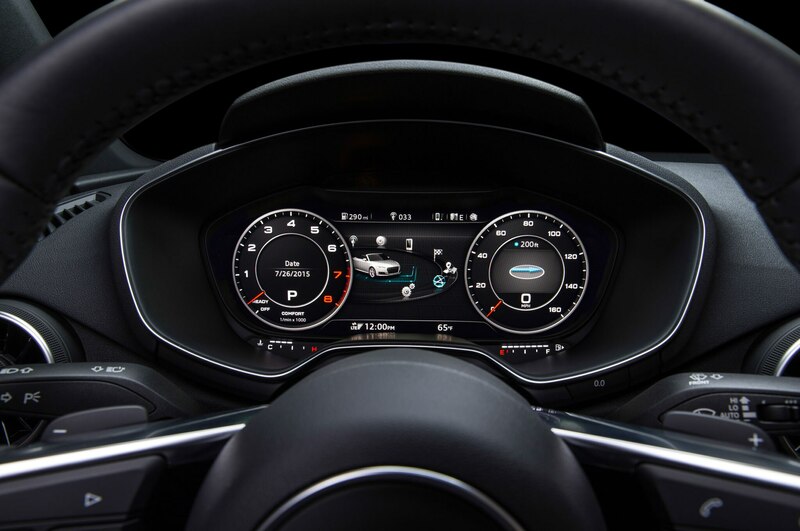 As on the R8 supercar, the engine start-stop button is mounted to the steering wheel. 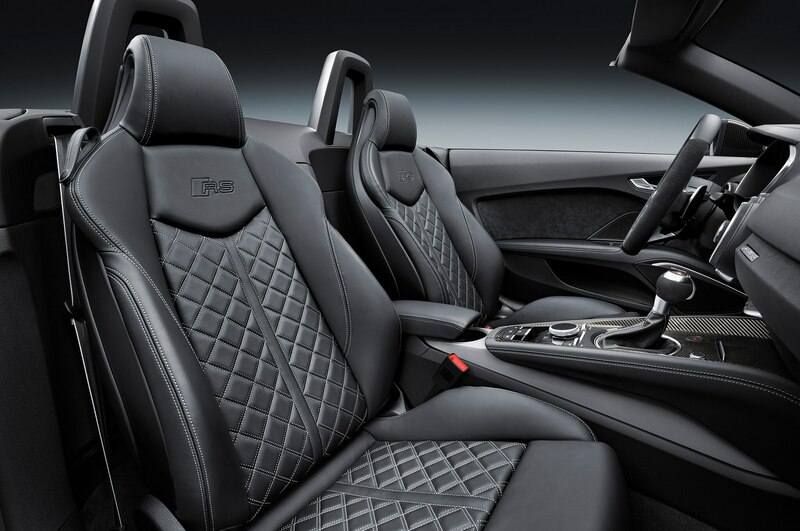 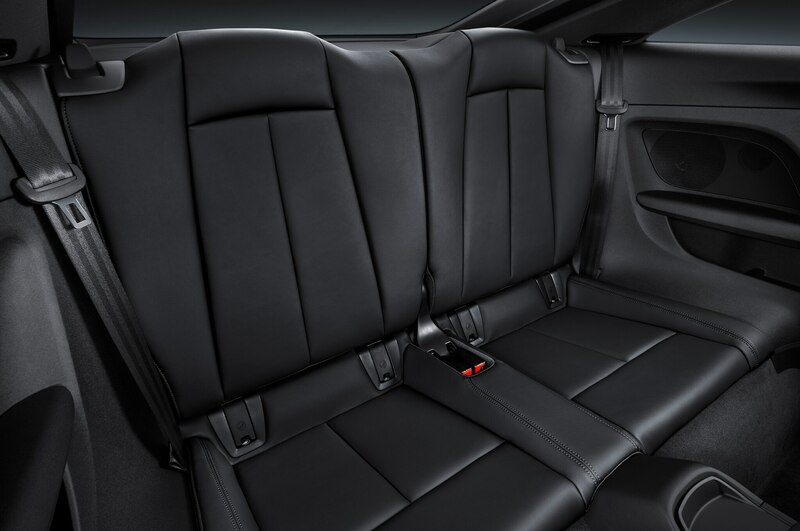 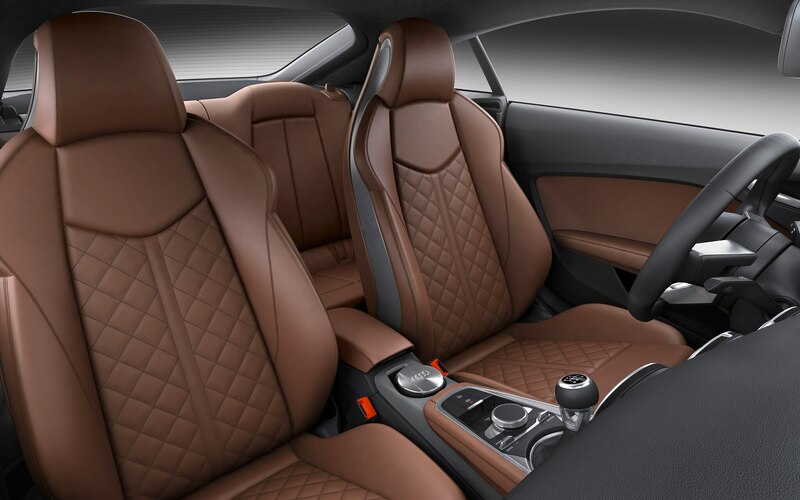 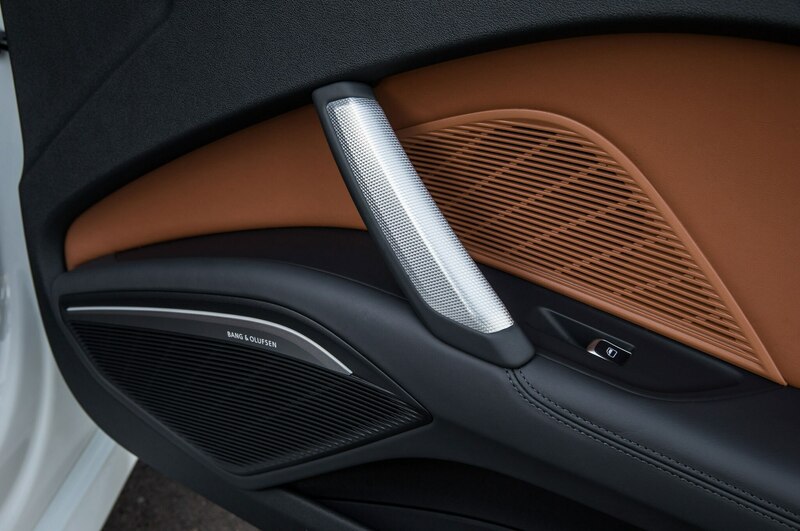 Other interior upgrades include sporty diamond-stitched Alcantara, bucket seats with RS logos on the headrests, and a variety of red and gray accents. 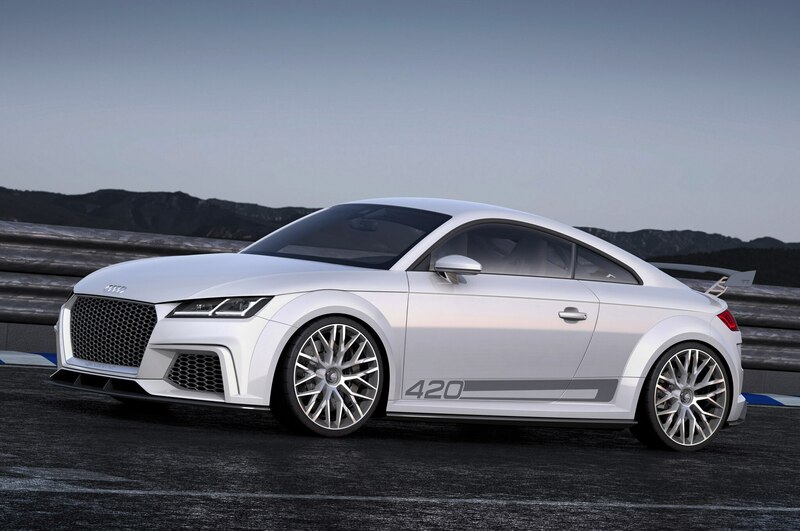 Aside from the fixed rear wing, the visual enhancements to the Audi TT RS are relatively subtle, comprising 19- or 20-inch wheels, a more aggressive front fascia with prominent air intakes, a revised rear bumper, and a pair of ovoid exhaust tips. 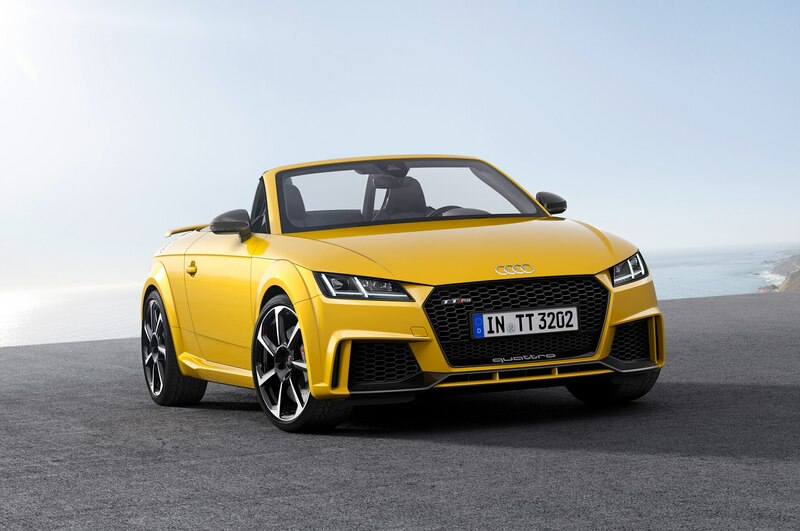 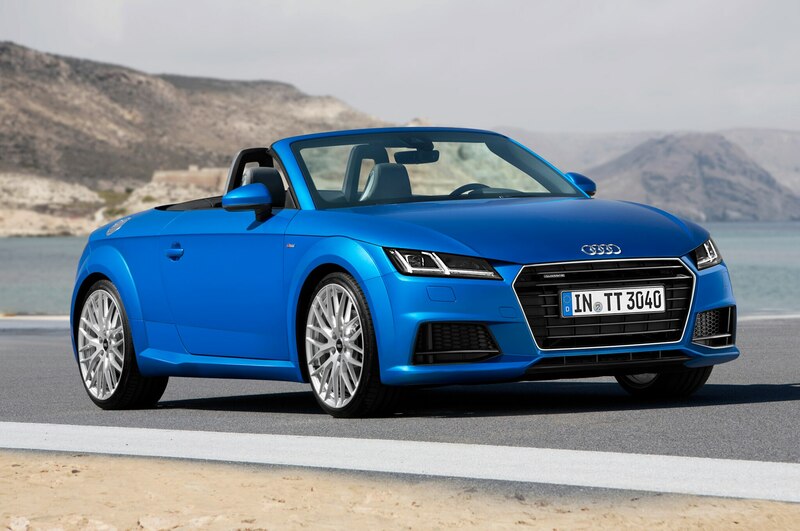 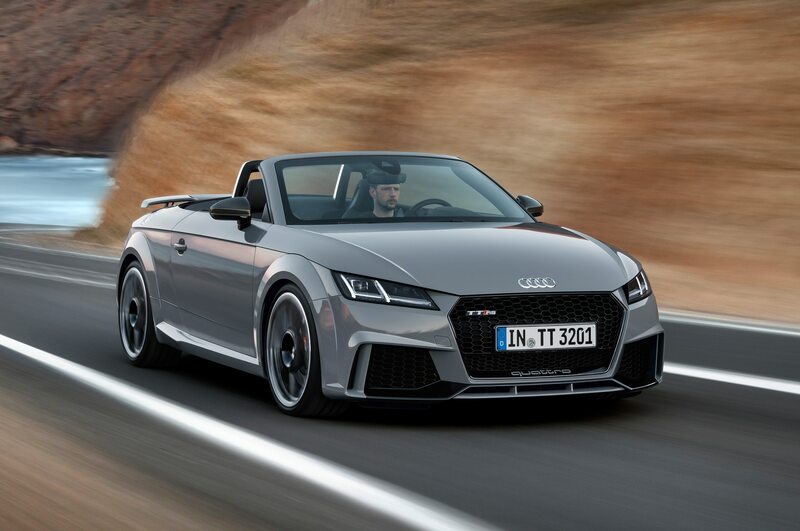 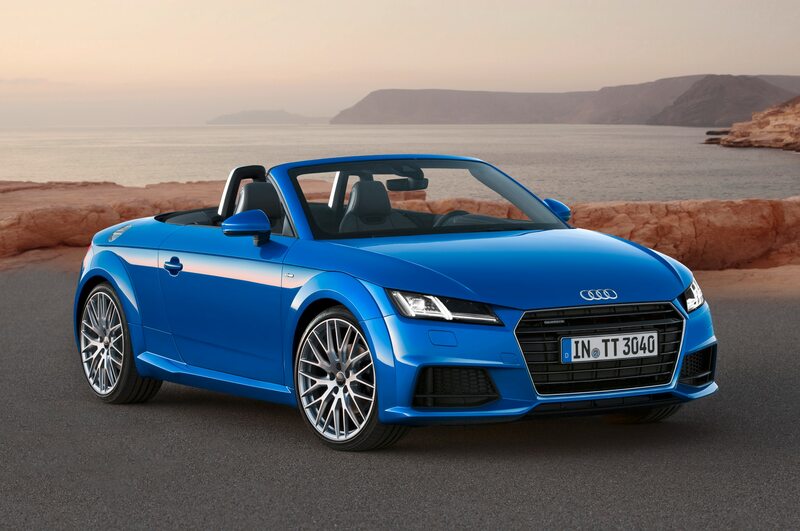 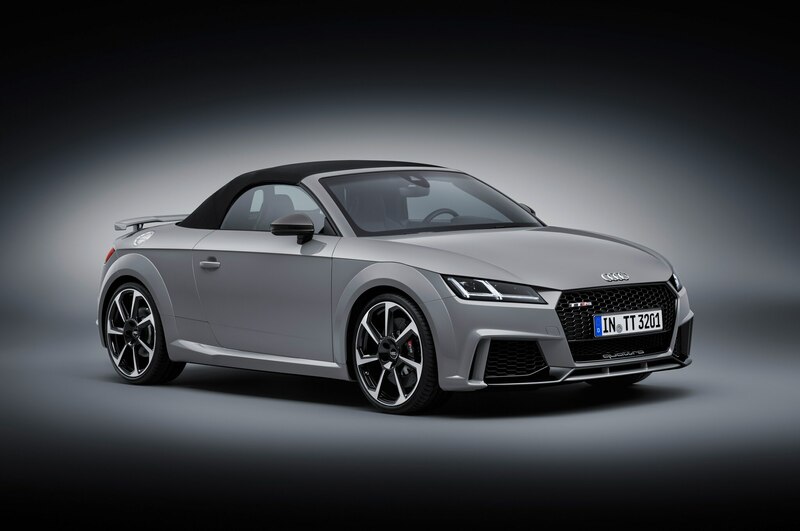 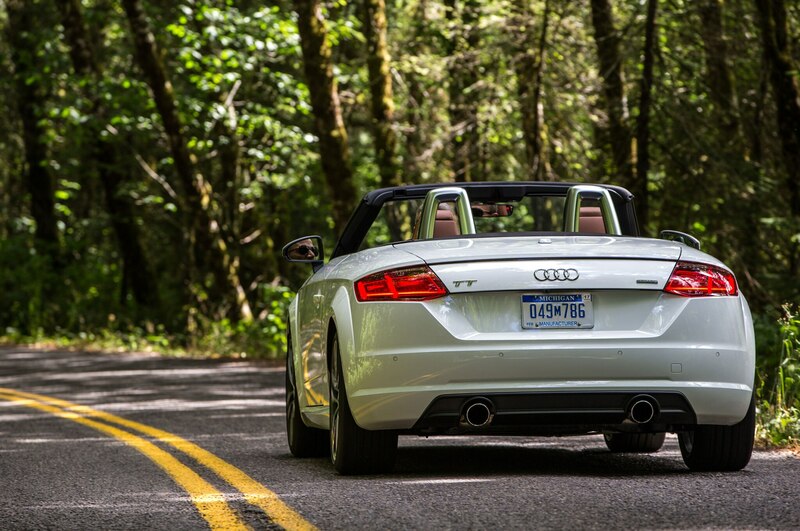 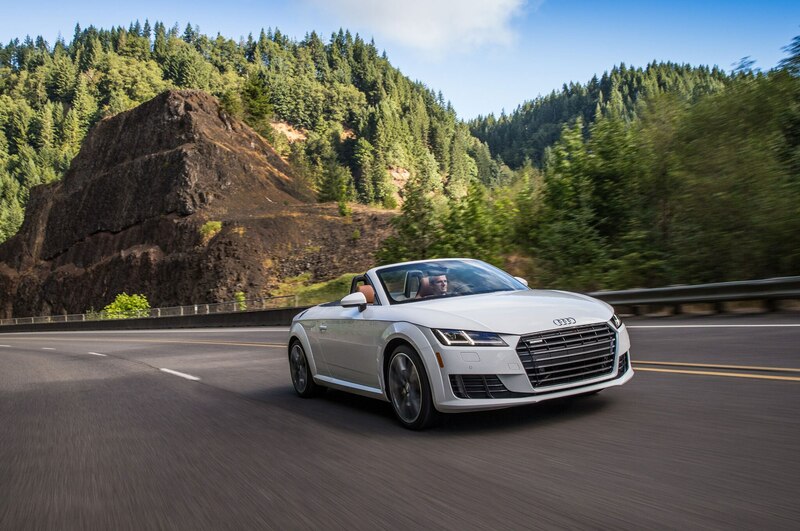 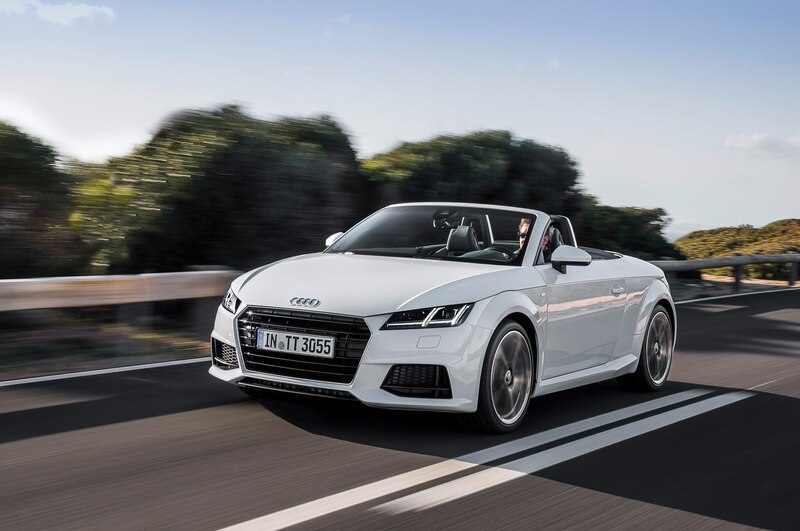 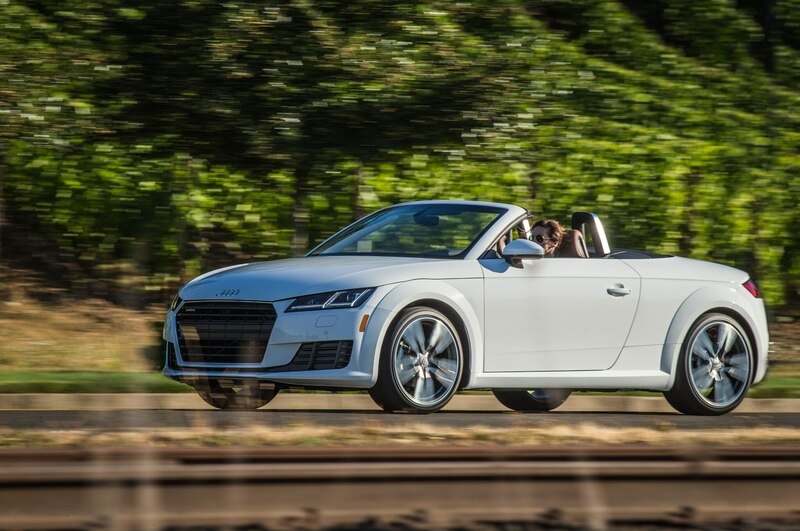 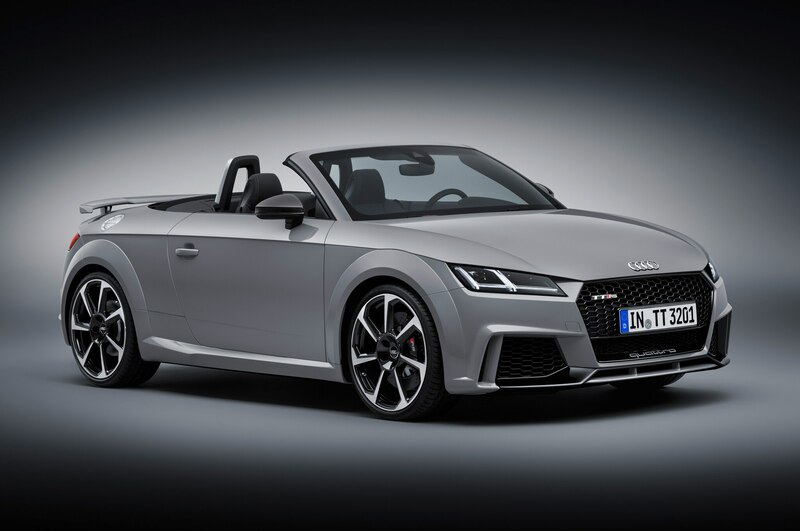 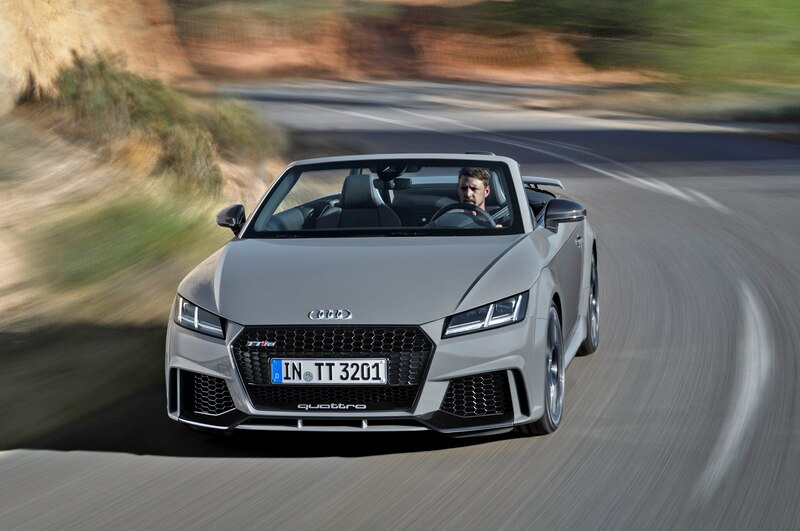 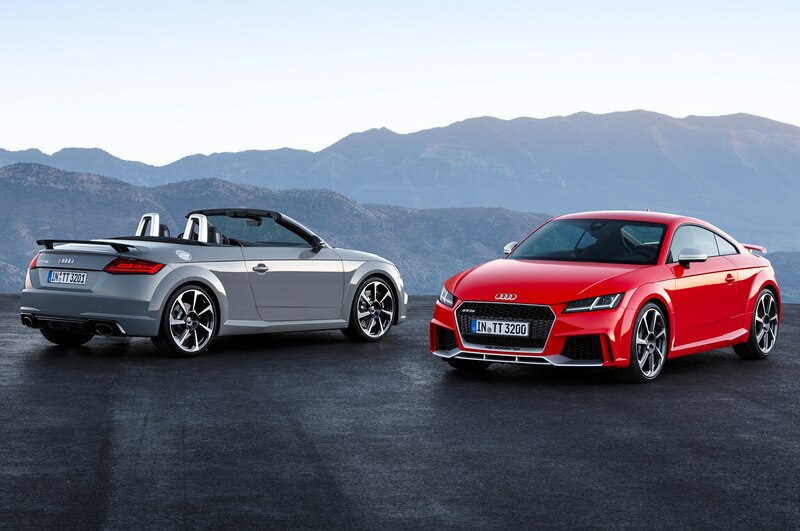 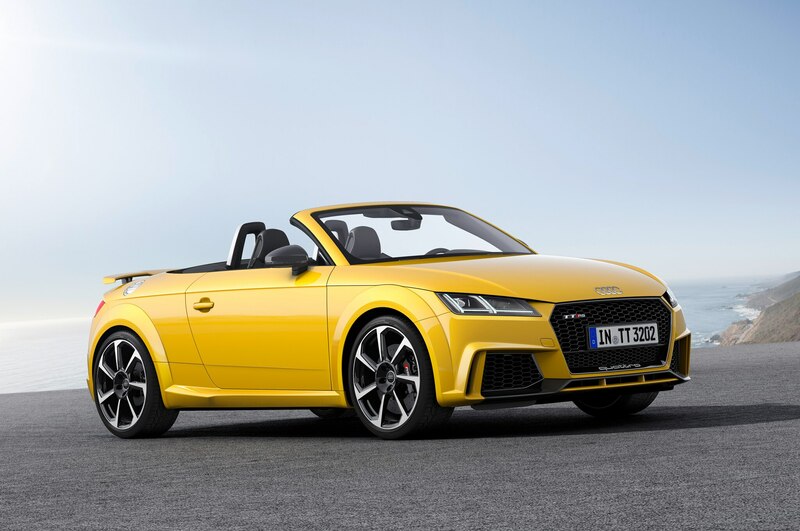 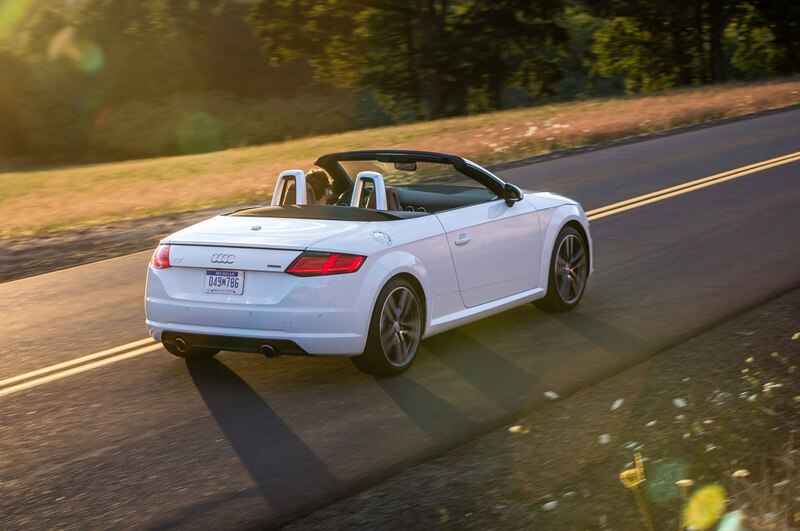 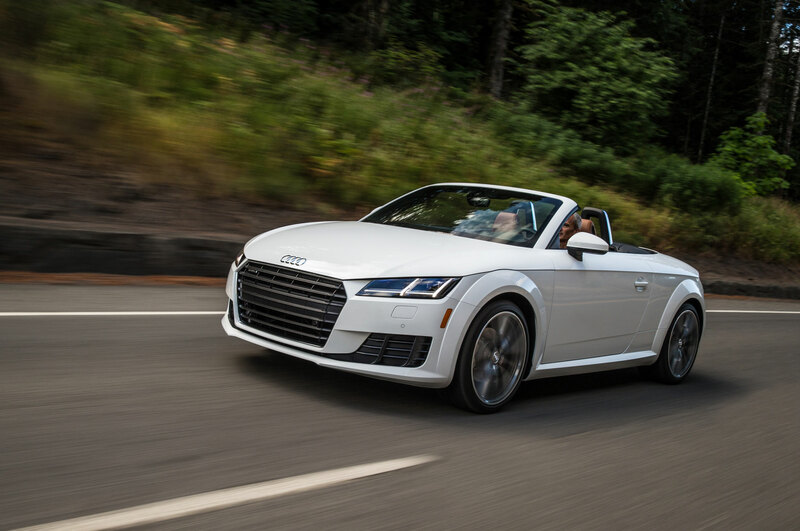 The Audi TT RS coupe and convertible go on sale in Europe this fall and should reach the U.S. by early next year. 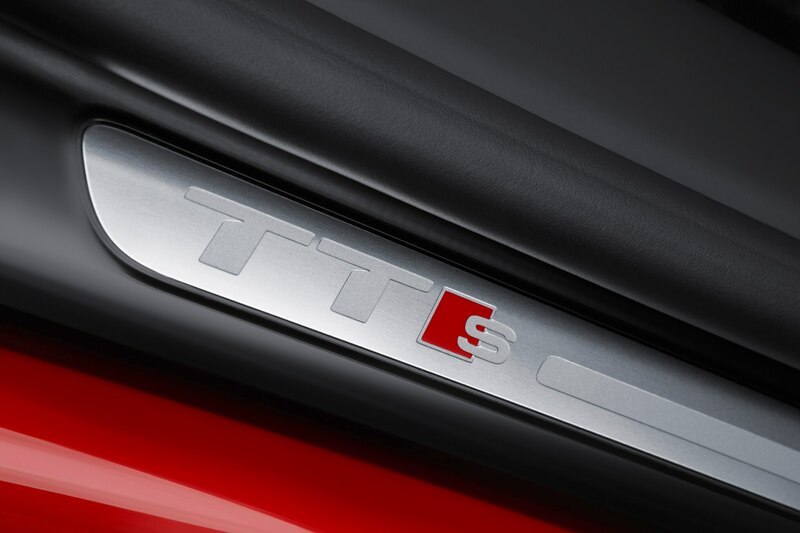 Though pricing hasn’t been announced, expect a starting figure somewhere north of $60,000, given that the 292-hp TTS coupe already commands $52,825.